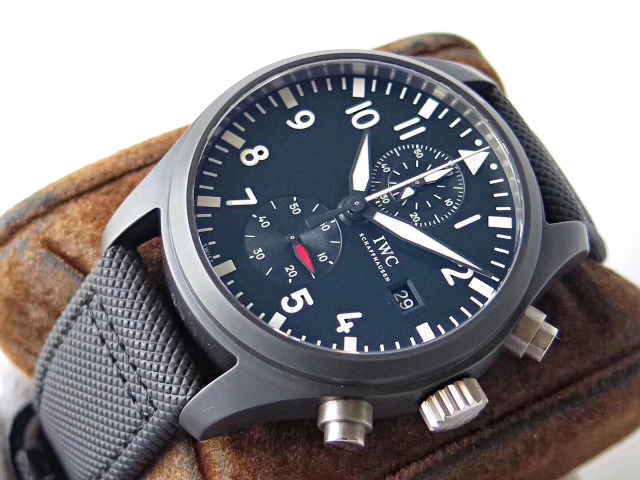 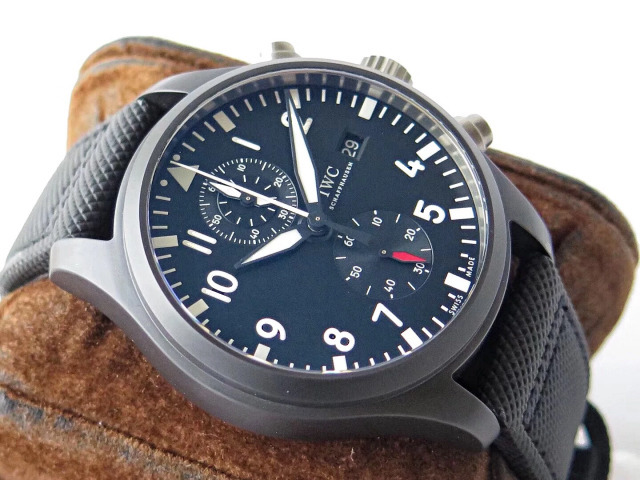 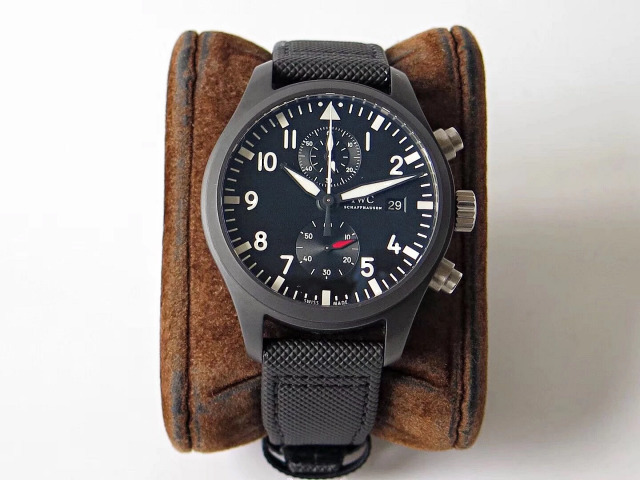 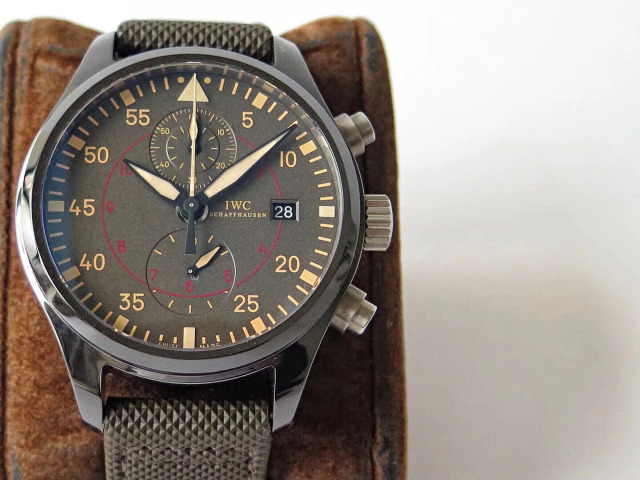 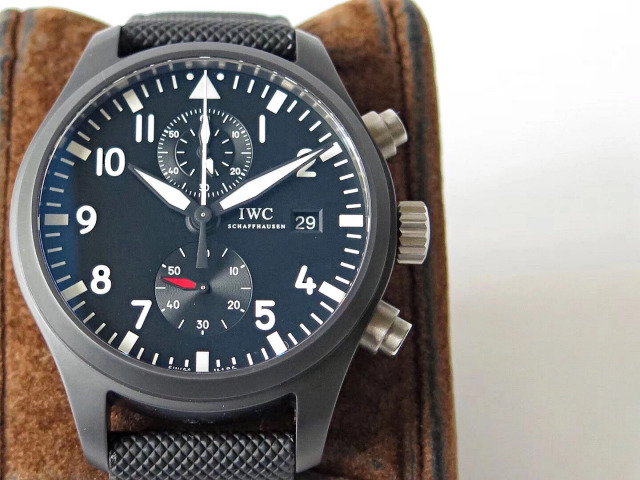 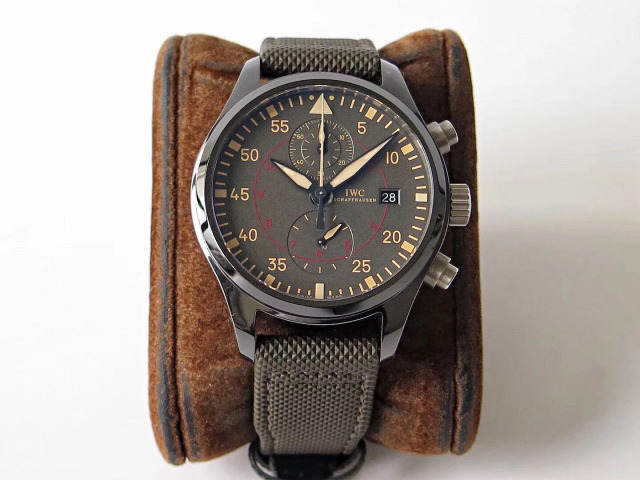 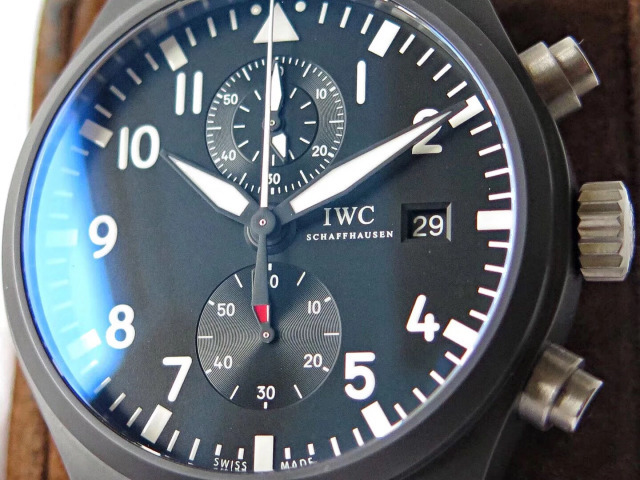 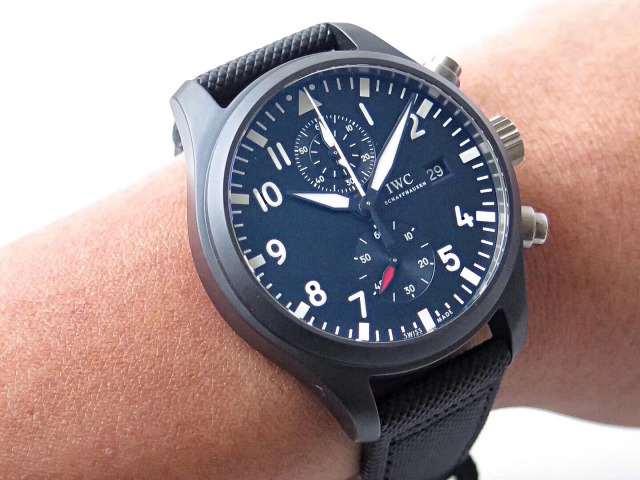 Two important IWC watches are just published by ZF factory in our market, they are from Pilot chrono series of IWC, Top Gun IW389001 and IW389002. 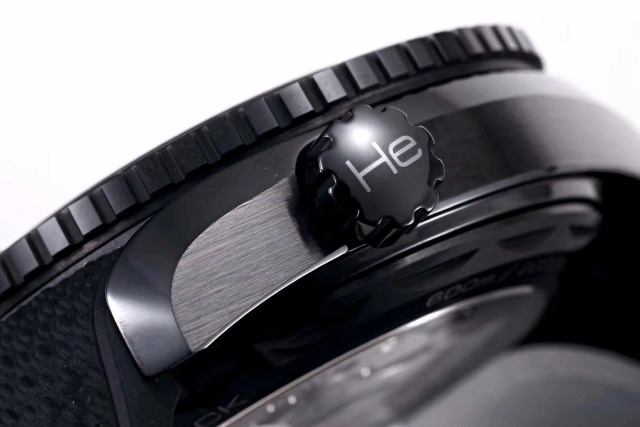 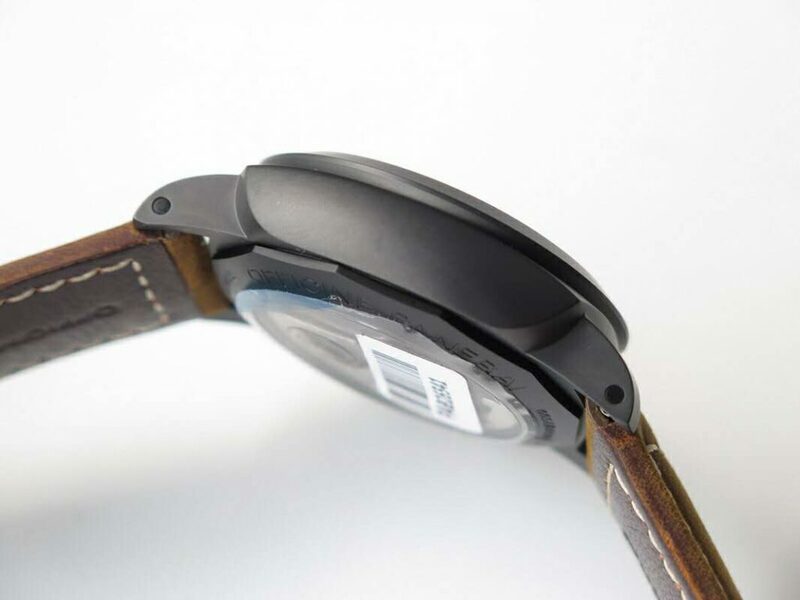 Both watches use ceramic case and military-style nylon band. 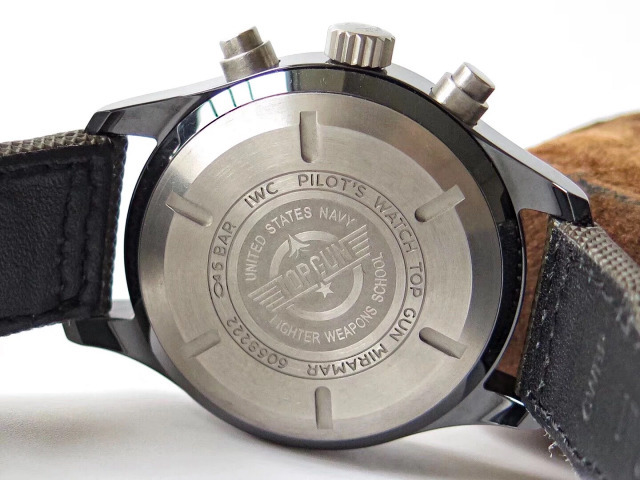 They are good choices for military watch fans. 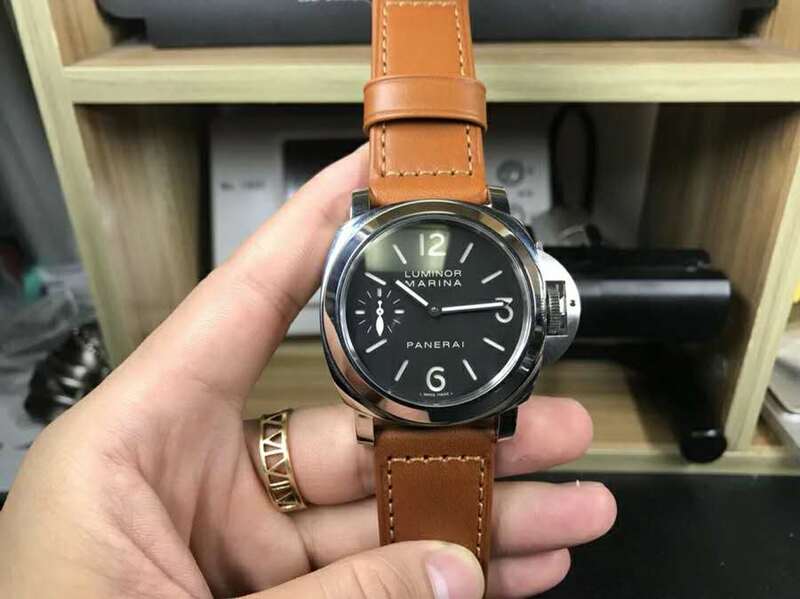 Here I post specification of these two watches. 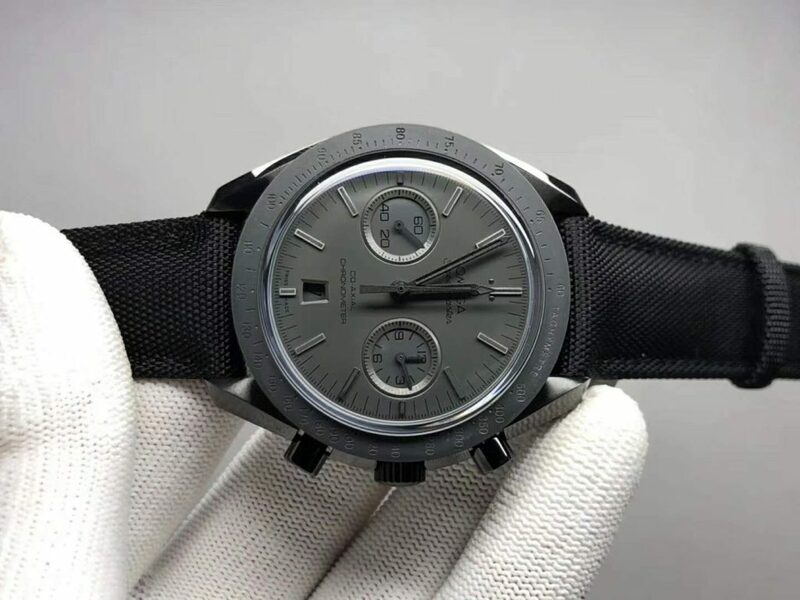 Both replica watches have black ceramic case that is brushed, whether in the front or sides, the entire case is brushed, both chronograph buttons are also brushed with polished round edge. 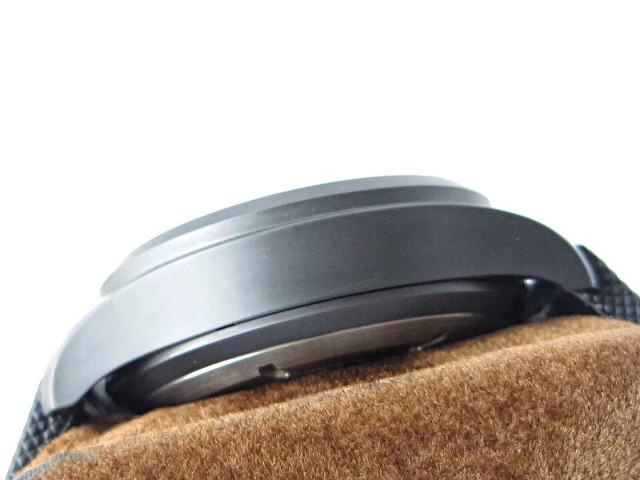 The case diameter is up to 44mm, because of ceramic material, the case feels heavy. 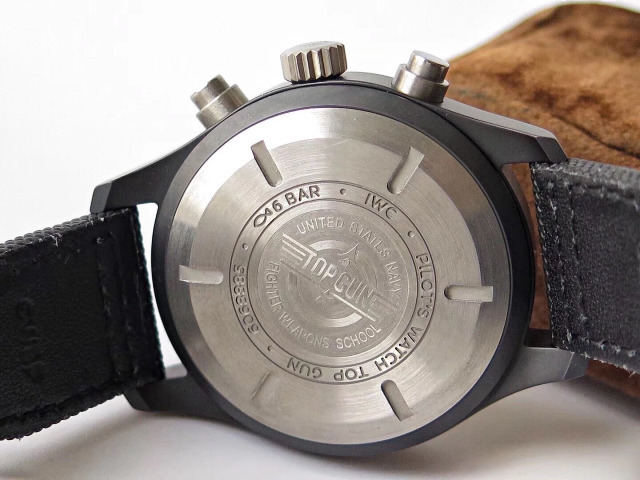 Case back has correct engravings in brushed surface, there are “TOP GUN” sculpture and other engravings. 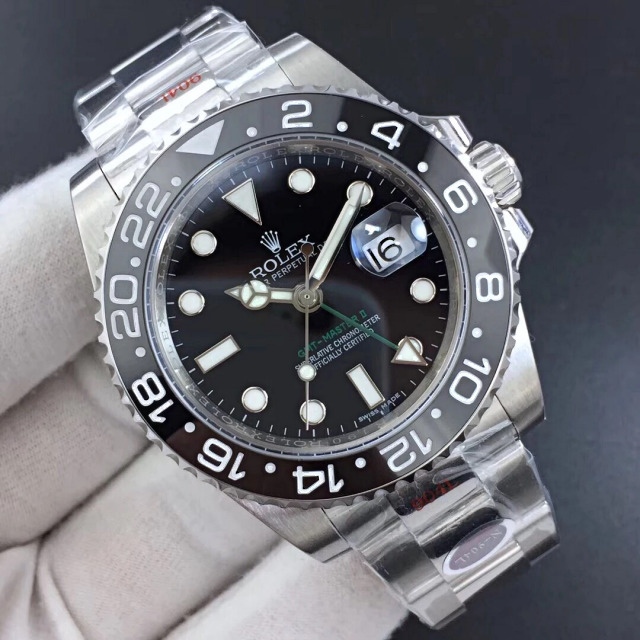 IW389001 is in whole black, including the dial, it is the model I prefer. 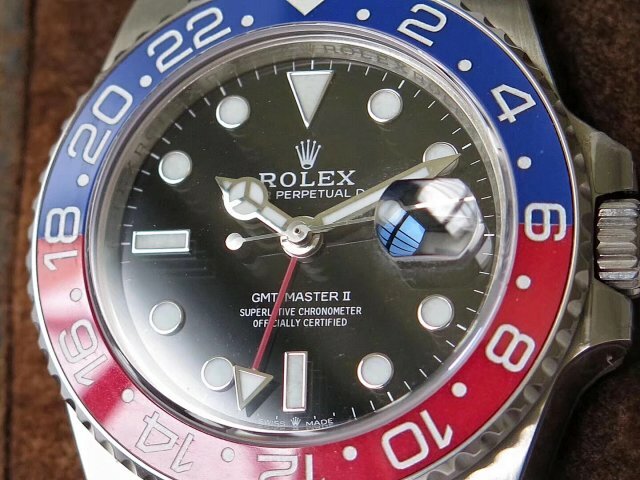 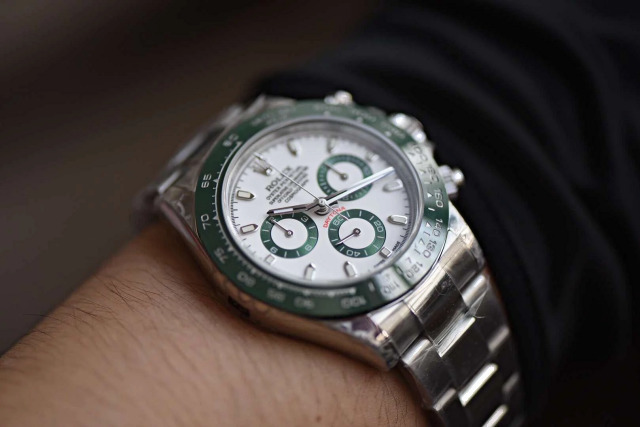 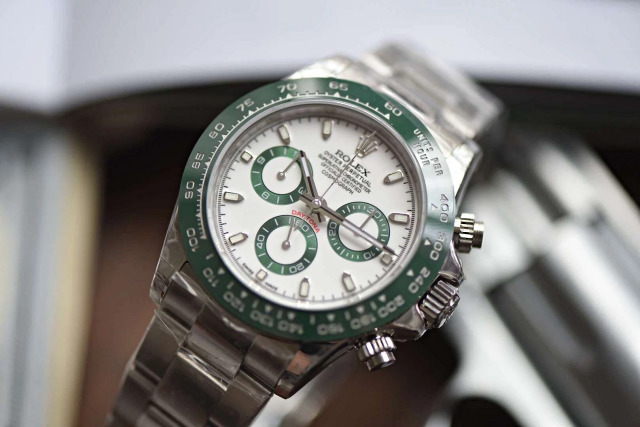 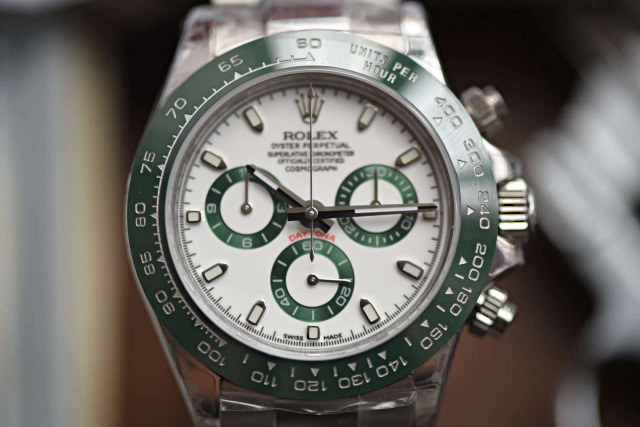 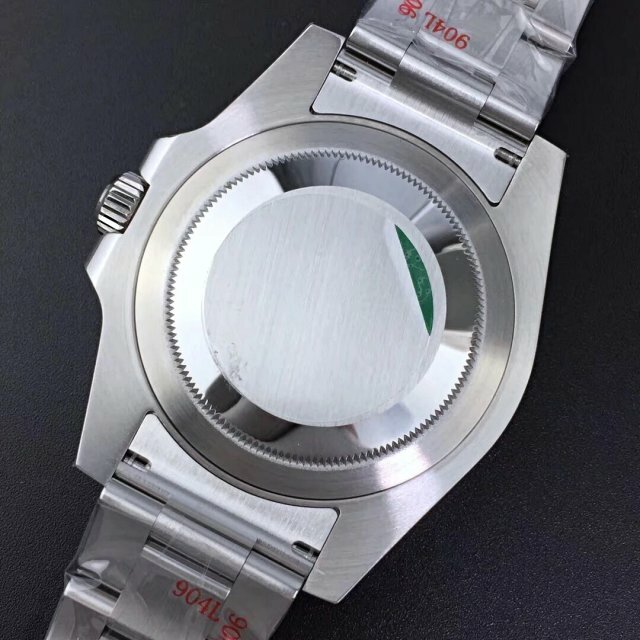 While IW389002 has a green dial. 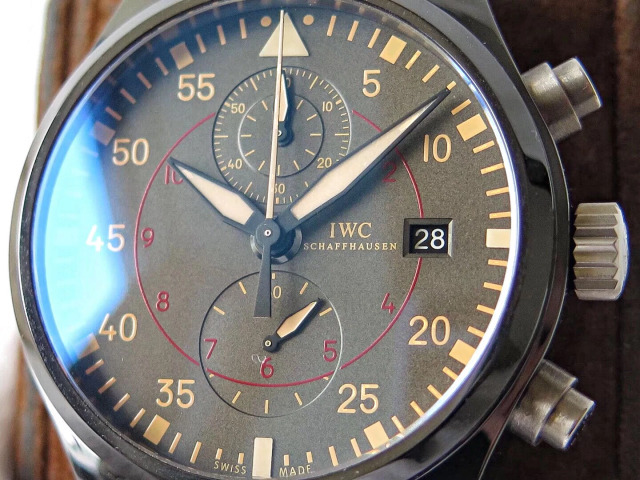 There is one little difference between the two watches on the dial, that is IW389002 has a red circle on the center of the dial to display 12 hours. 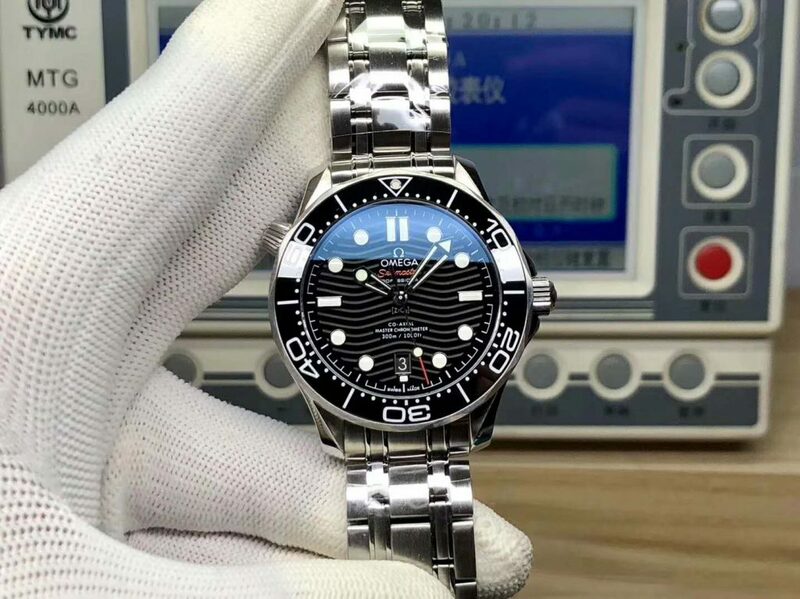 Two subdials are positioned at 12 and 6 o’clock. 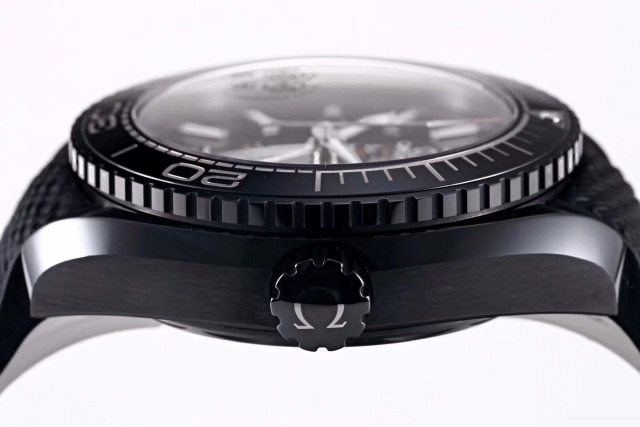 The subdial with a small red hand is small seconds subdial, while the subdials at 12 o’clock have two small dials in sunken design, the outer one is 60-minute chronograph counter, while the inner one is 12-hour chronograph counter. 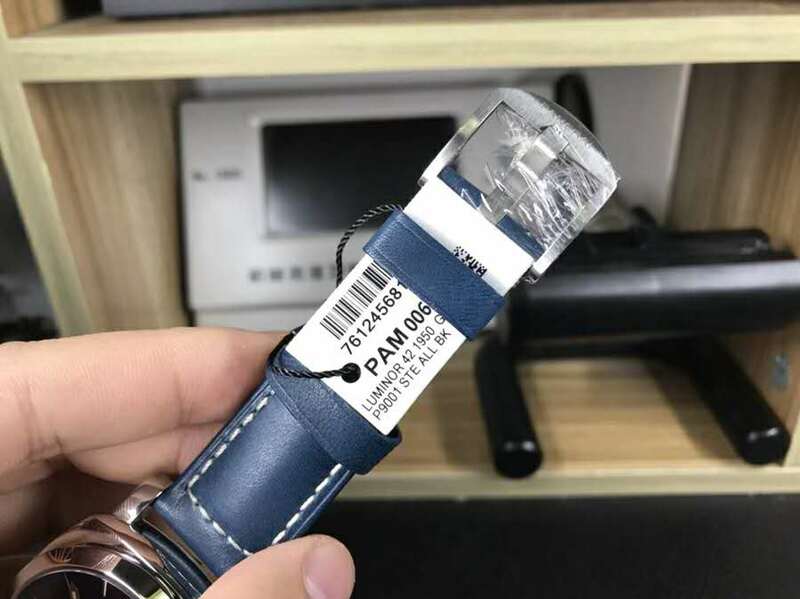 All hour markers are in white, the markers at 3, 6, 9 and 12 o’clock are applied with luminous material, they will emit a strong green light at night. 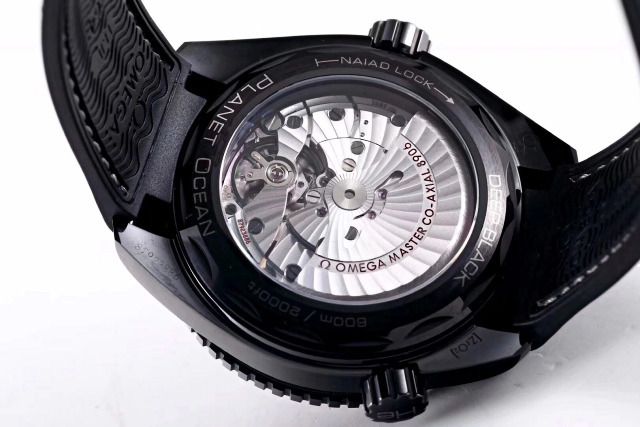 Compared with the green dial of IW389002, I like the black one of IW389001 more. 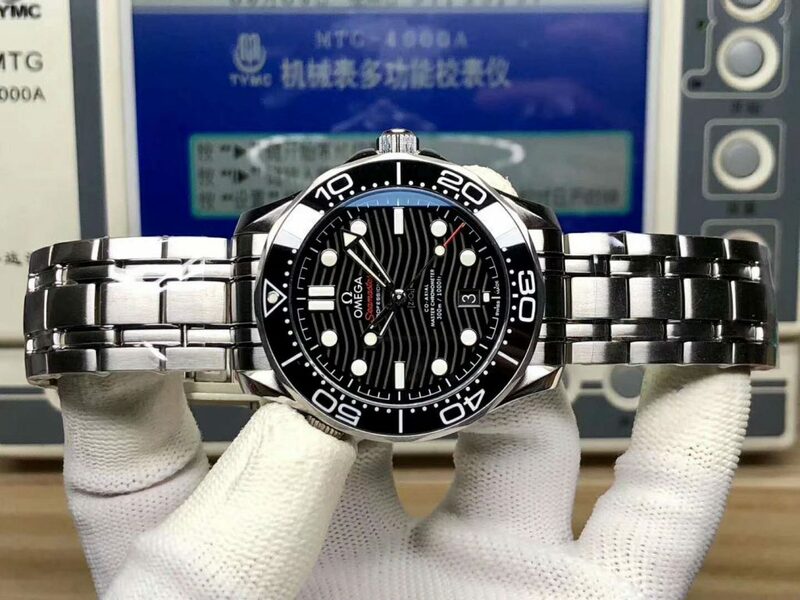 It has a match of white details in blackground, which greatly increases the dial readability. 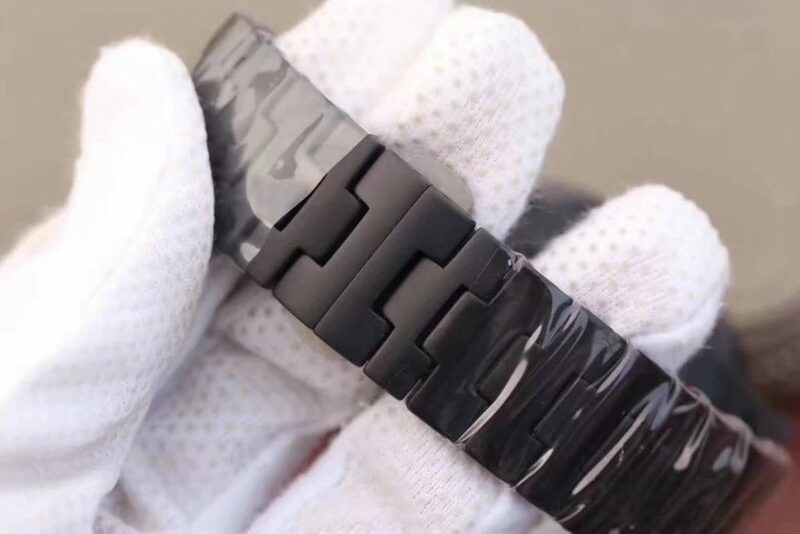 Black looks cooler too. 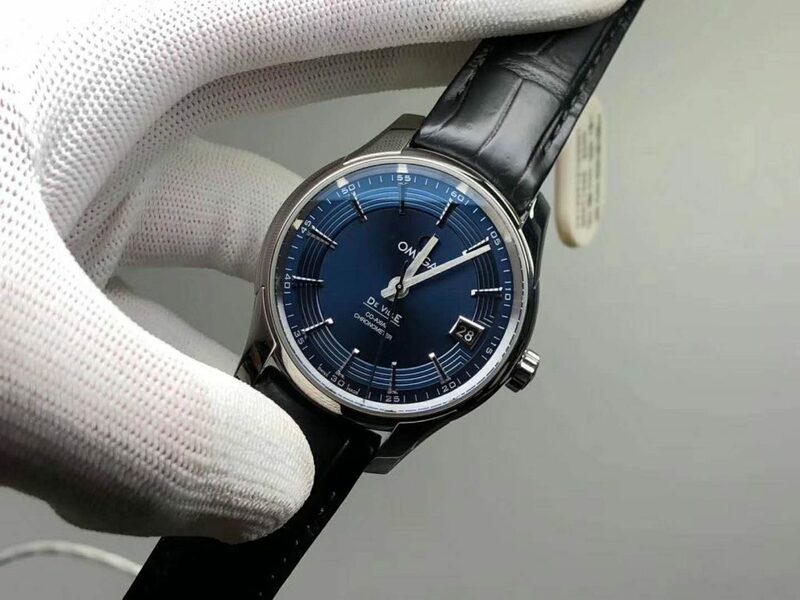 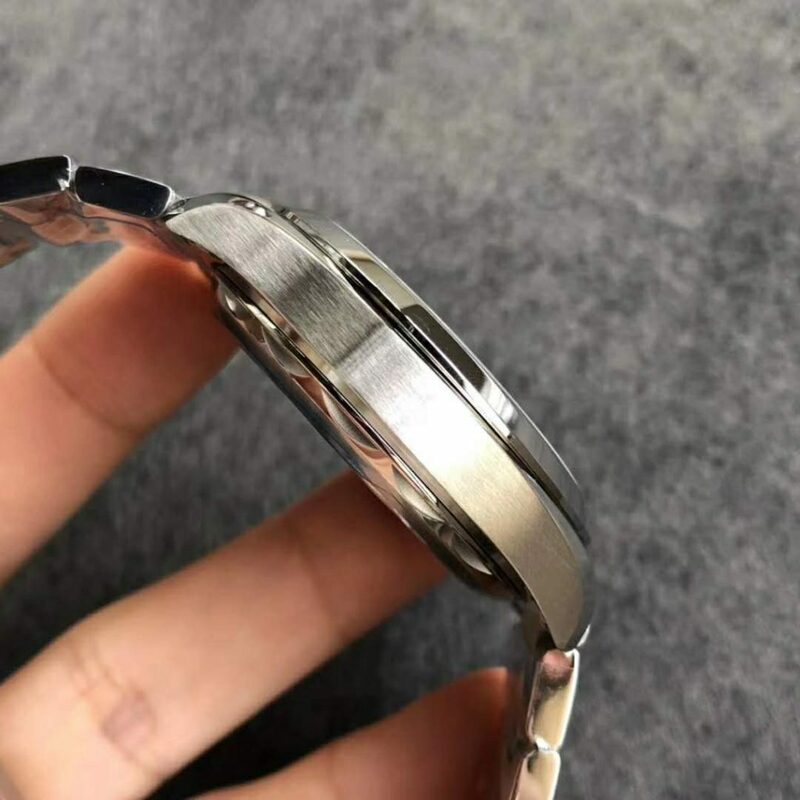 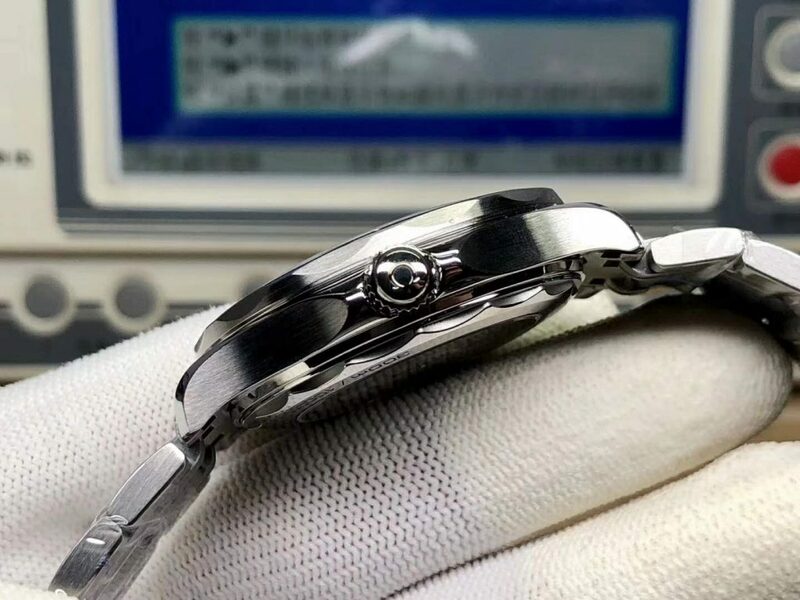 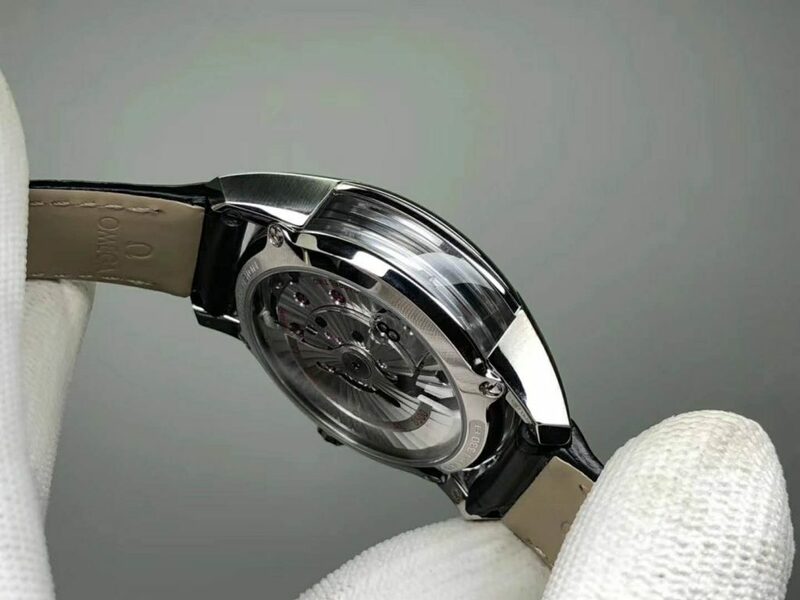 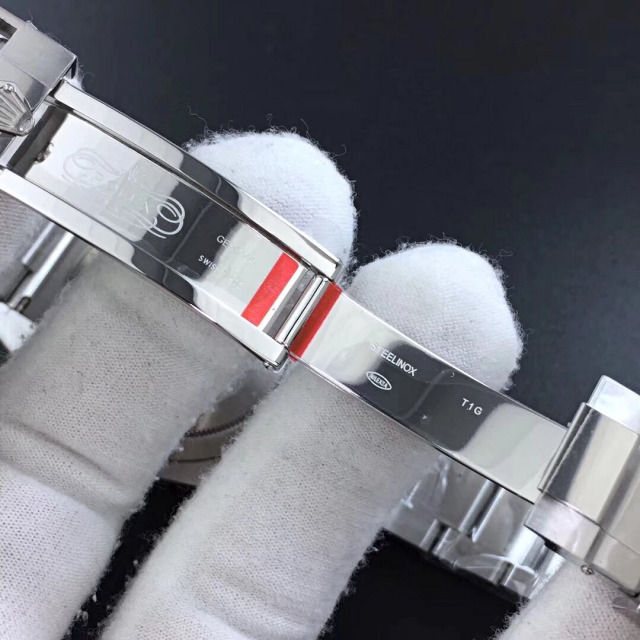 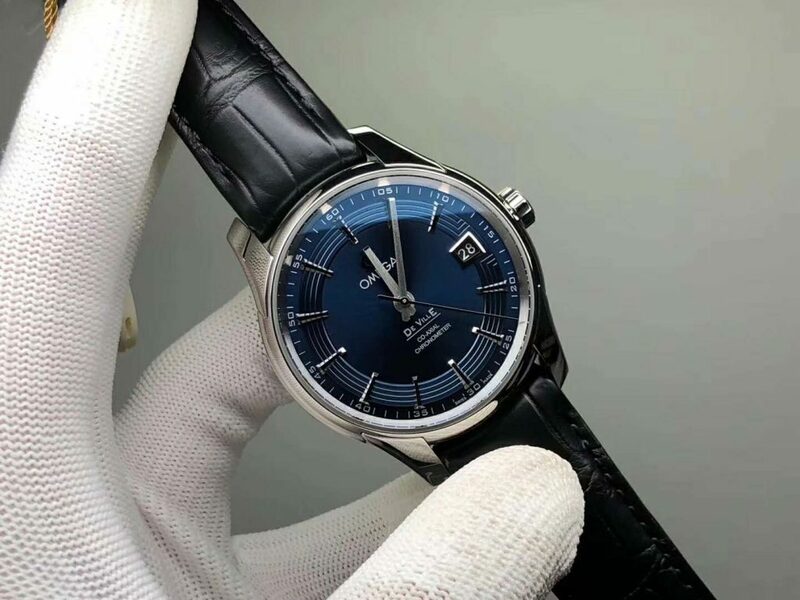 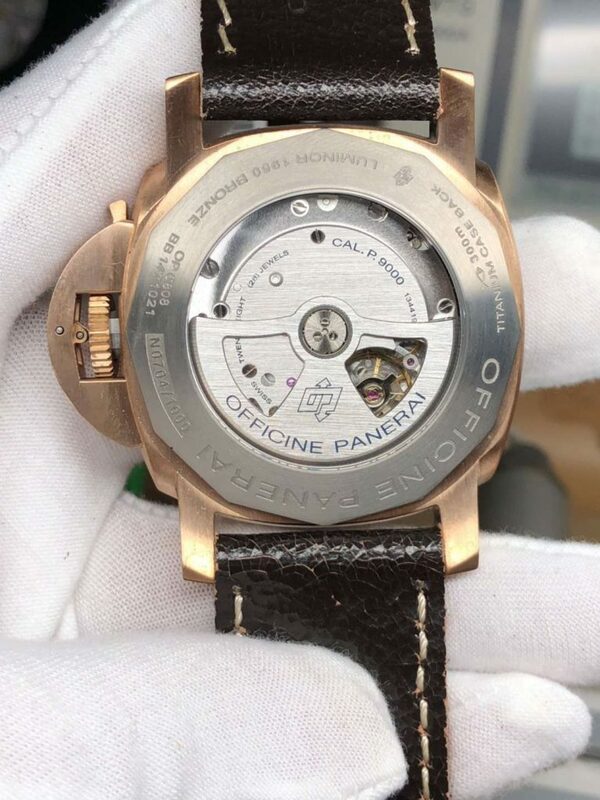 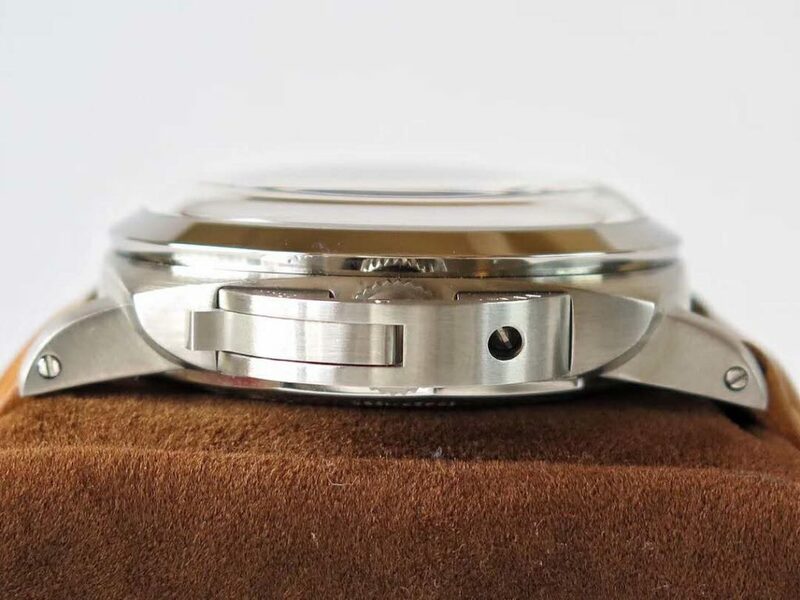 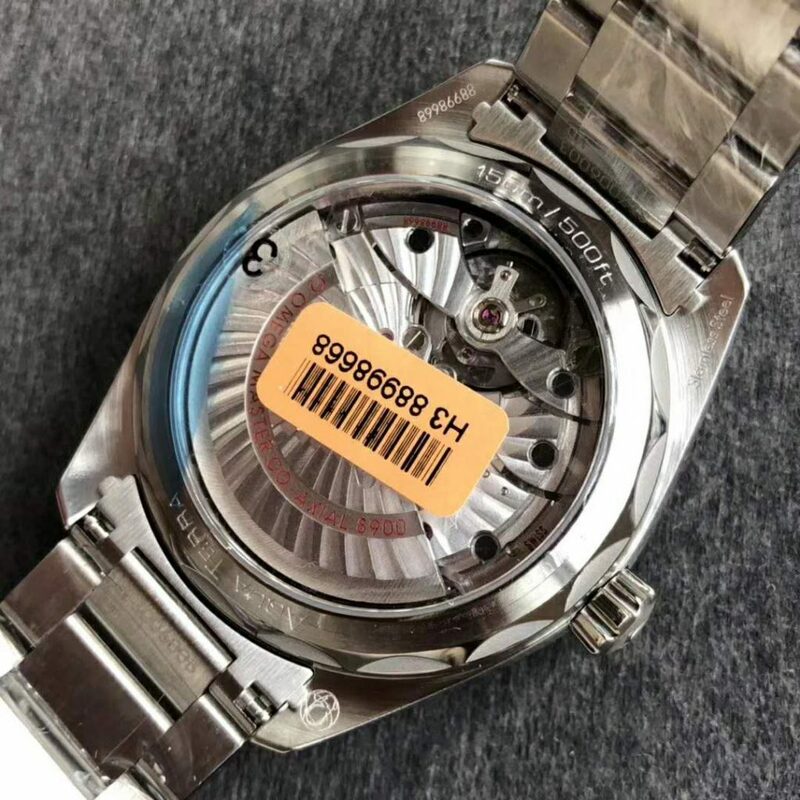 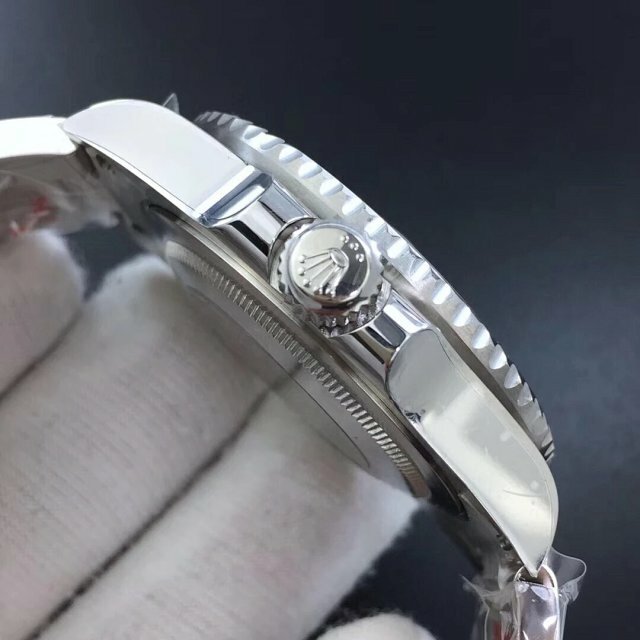 About the movement, ZF claimed that it is a clone IWC 89361, actually it is modified from a Chinese chronograph movement, we call it Asia Valjoux 7750, whatever behind the solid case back, the movement can completely achieve all functions of genuine watch. 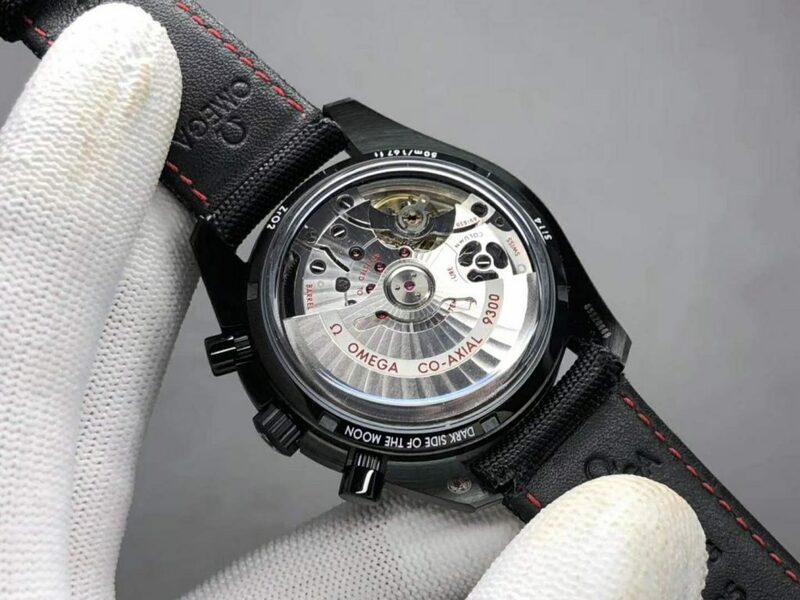 Besides, the stability of this type of Asia Valjoux 7750 has been tested for more than 10 years, it is trustworthy. 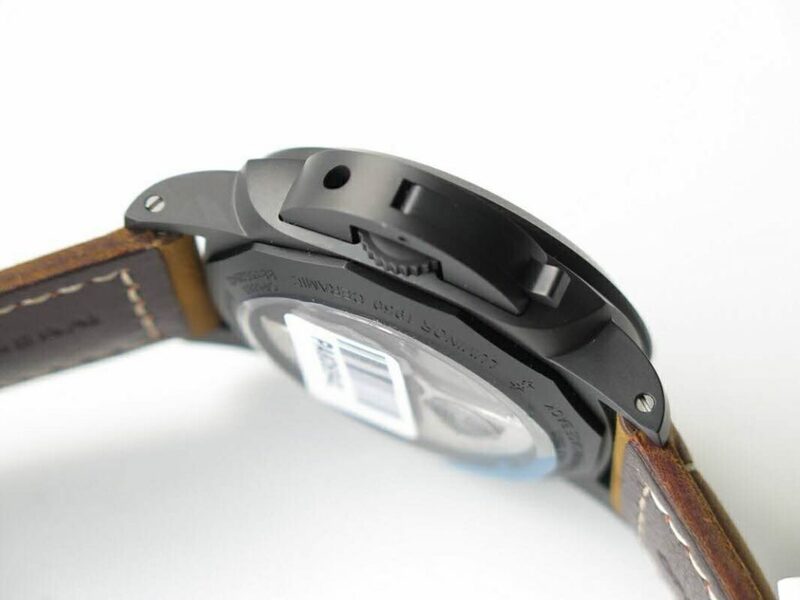 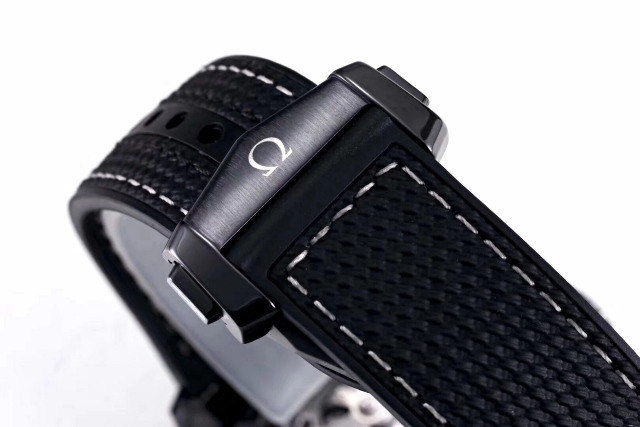 Watch band looks nylon on the outside, but it is actually made of calf leather, you can see it on the back side. 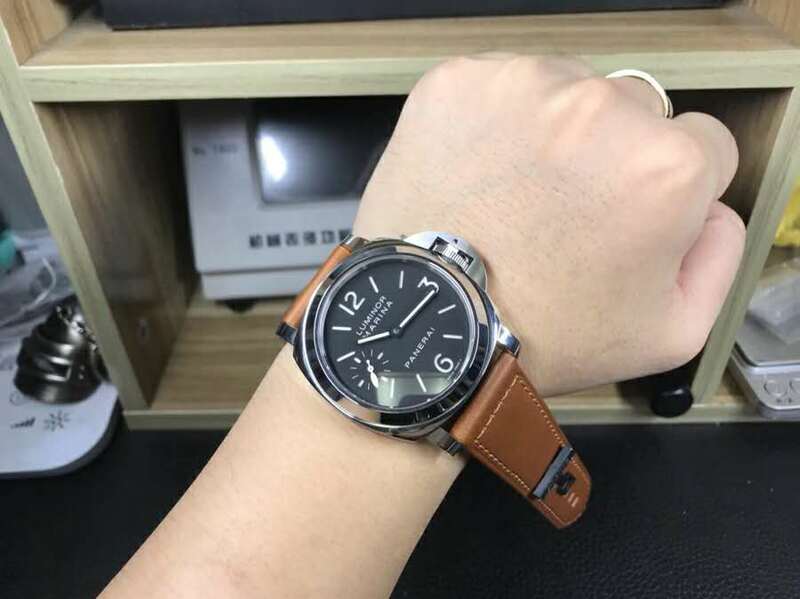 The nylon face outside can prevent rain and water drops when washing your hands, while the genuine leather that touches your skin will bring you a great wearing comfort. 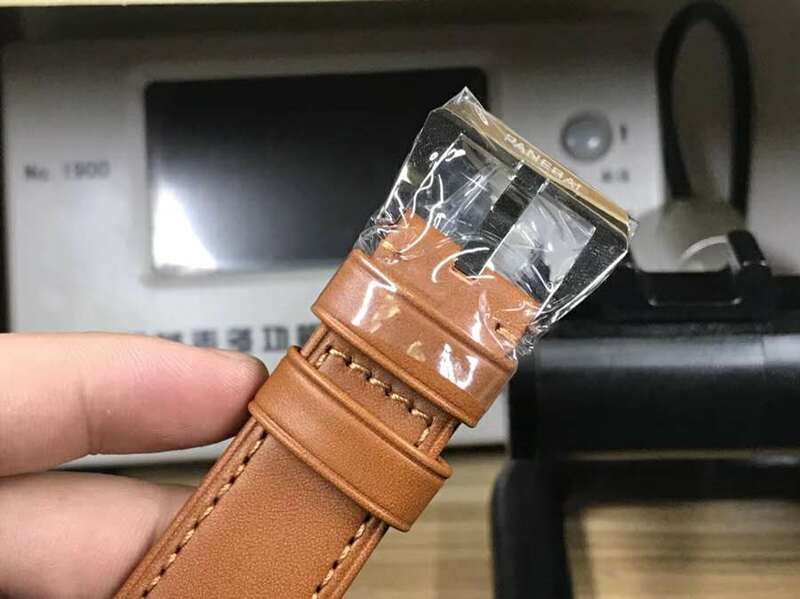 So such type of band has multiple purposes. 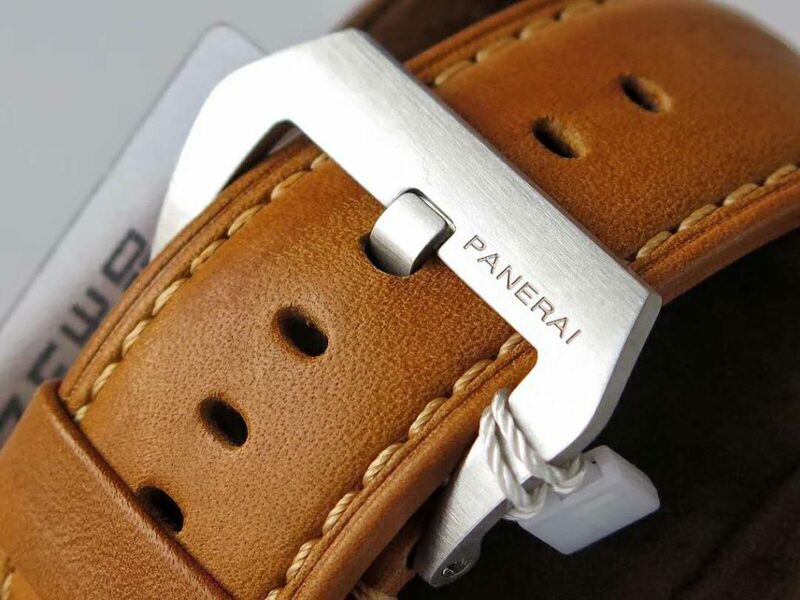 The buckle on the band is crafted very well and has a good brushing finish. 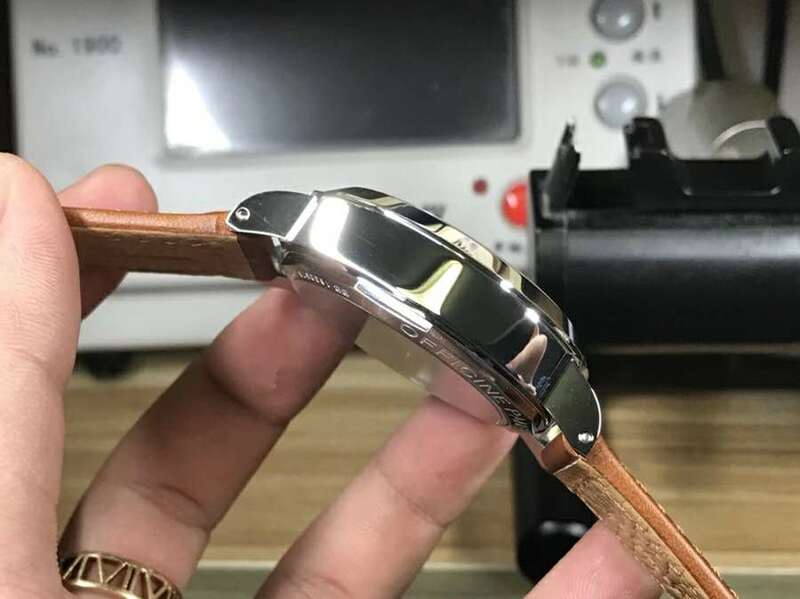 The review is done, let’s appreciate their acutal photos below. 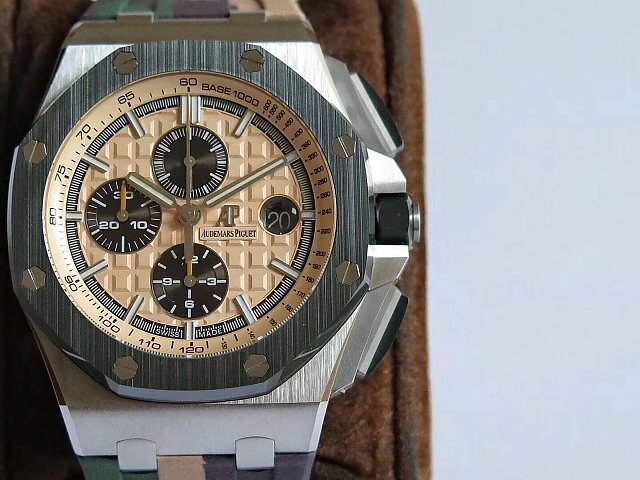 This may be the biggest Audemars Piguet watch, look at its crown and chronograph buttons, they are greatly different from other Audemars Piguet watches. 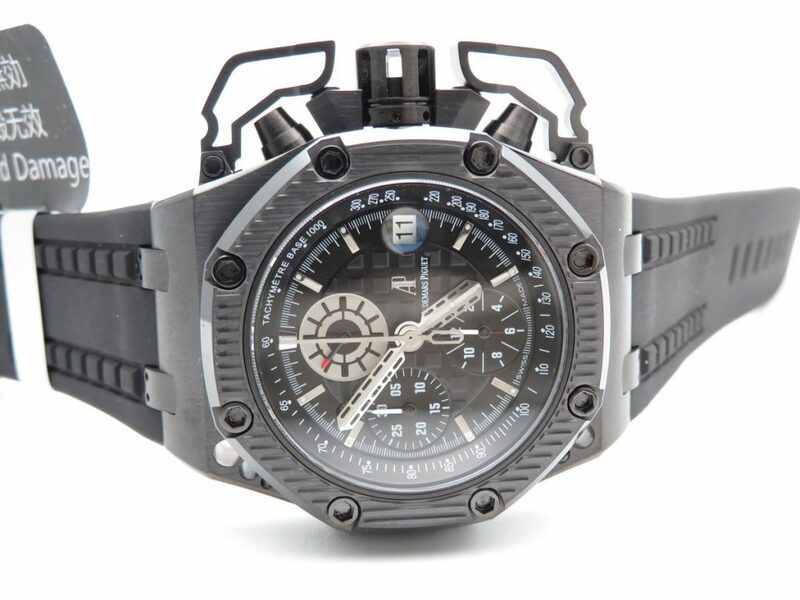 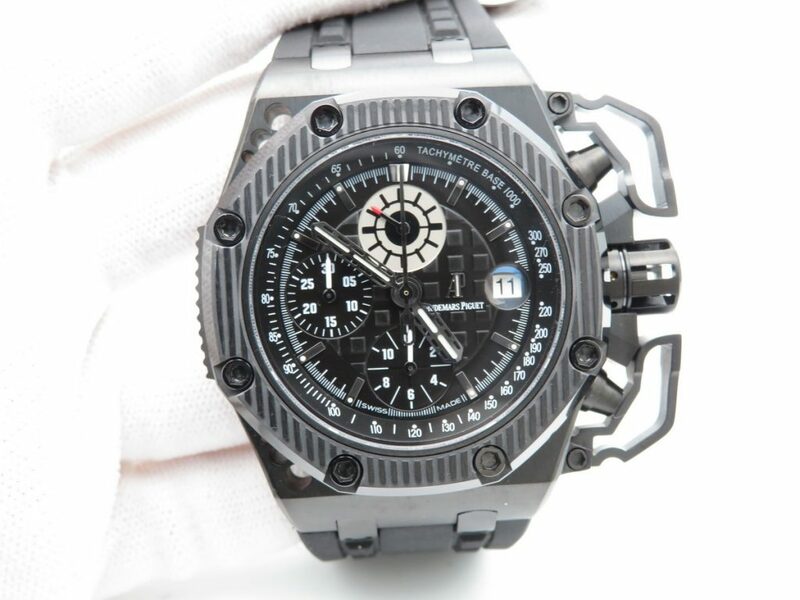 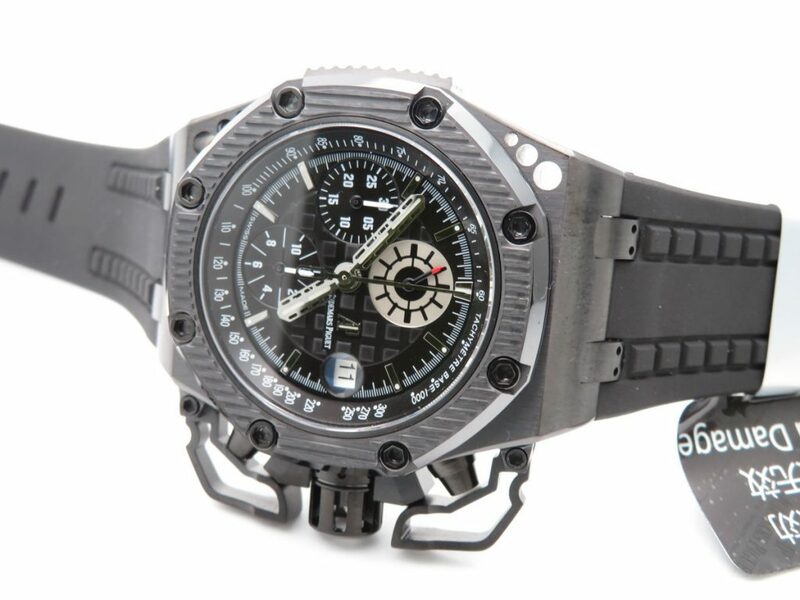 Royal Oak Survivor is a limited edition model of Audemars Piguet, it is a full black watch and looks very cool. 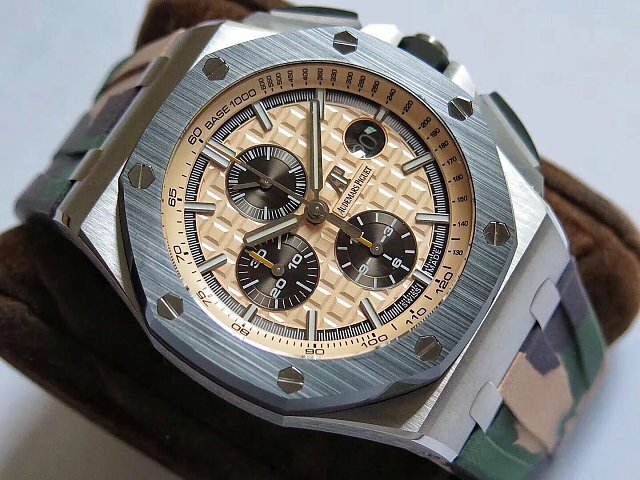 The replica of Audemars Piguet Survivor only has two editions, one is made by Noob factory, the other is made by a small factory. 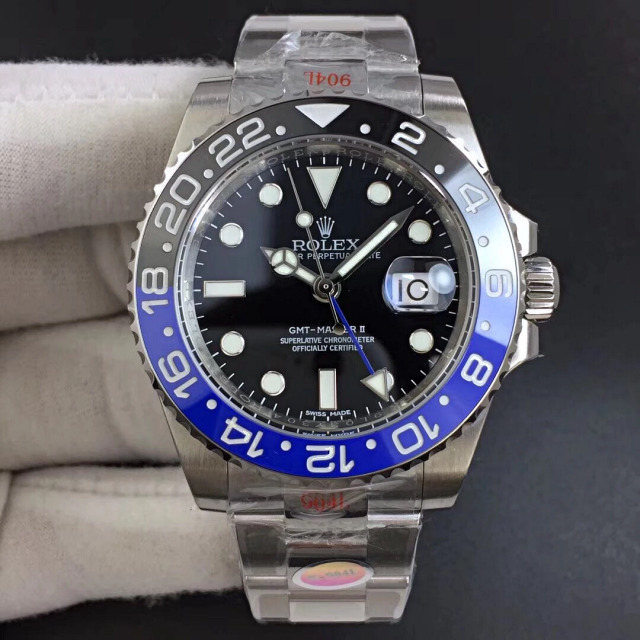 While these two models have been out of stock for a long time, especially the one from Noob, you are not able to buy it even having money. 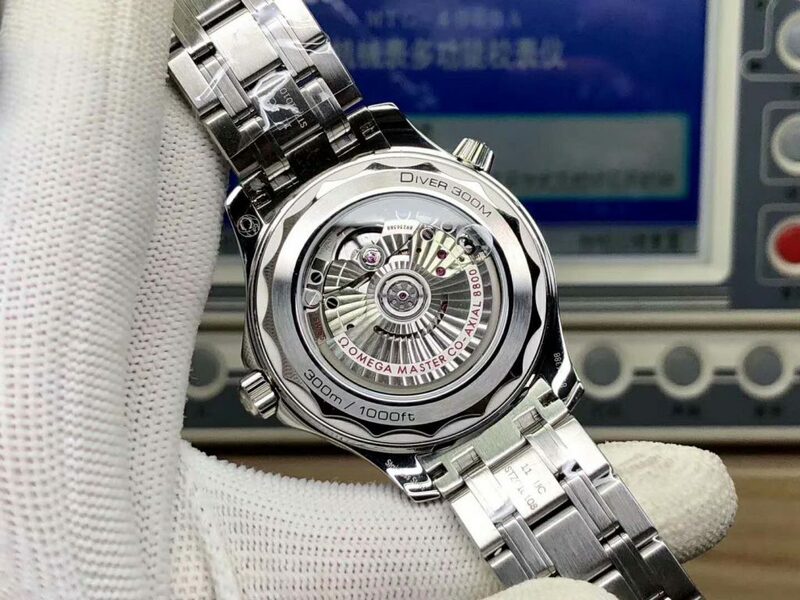 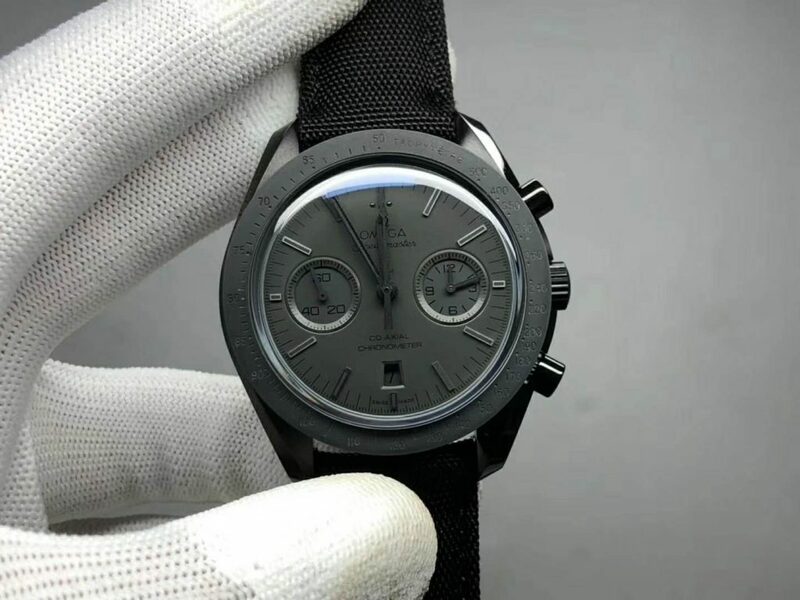 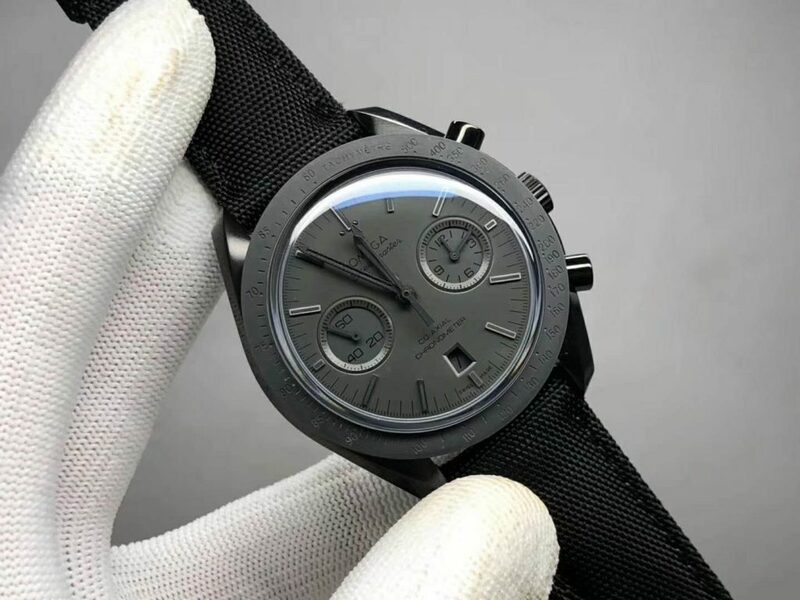 Now, in the beginning of 2019, to give you guys a big surprise new year gift, a factory in our market made this Audemars Piguet Survivor replica. 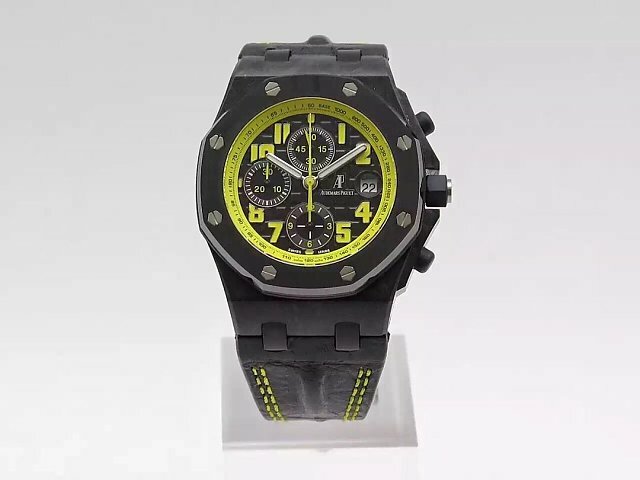 Now, this is the only version you can find online, also the best edition. 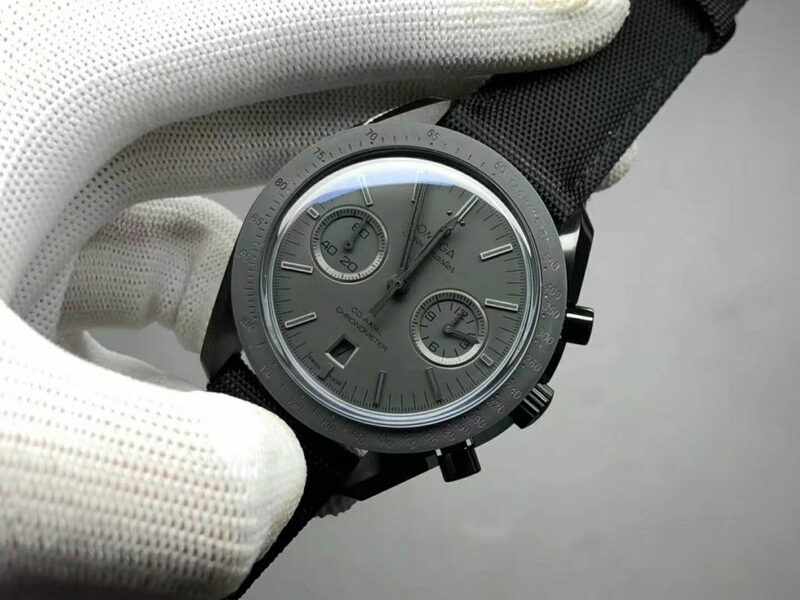 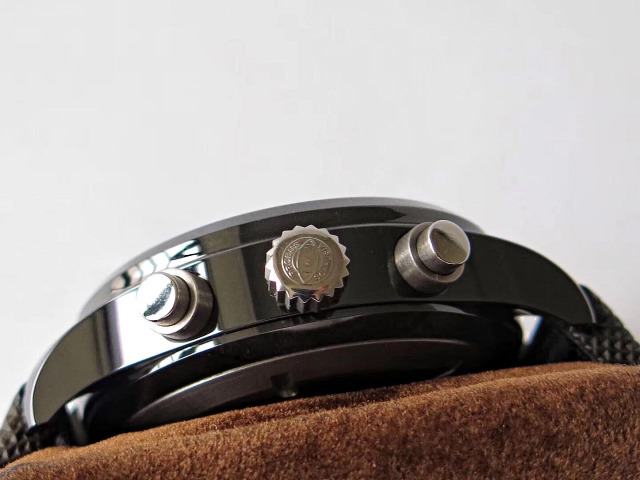 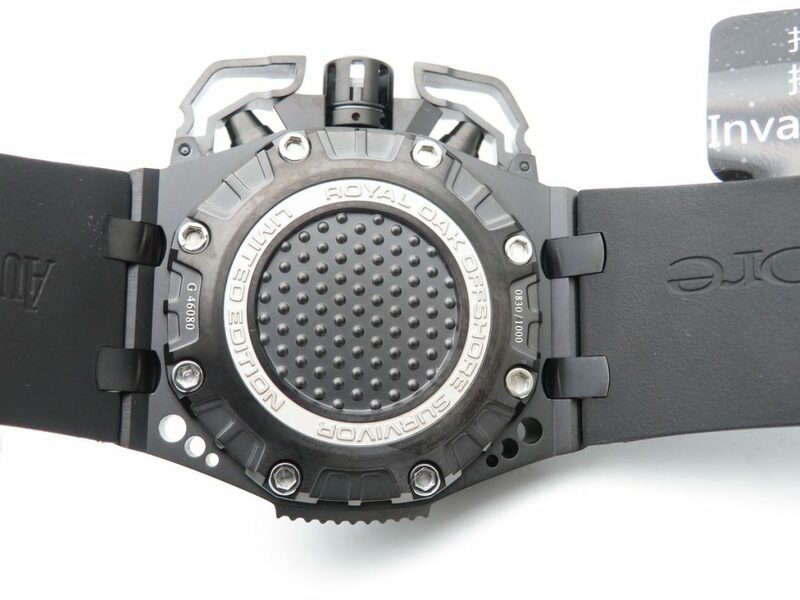 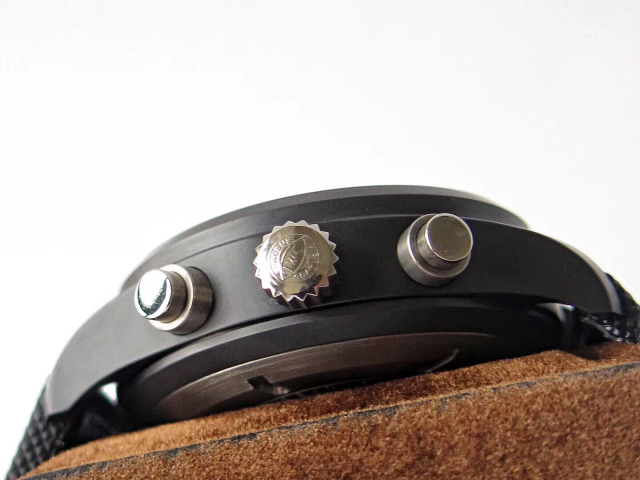 The case looks very large, it is 42mm in diameter, which does not include crown and chronograph buttons. 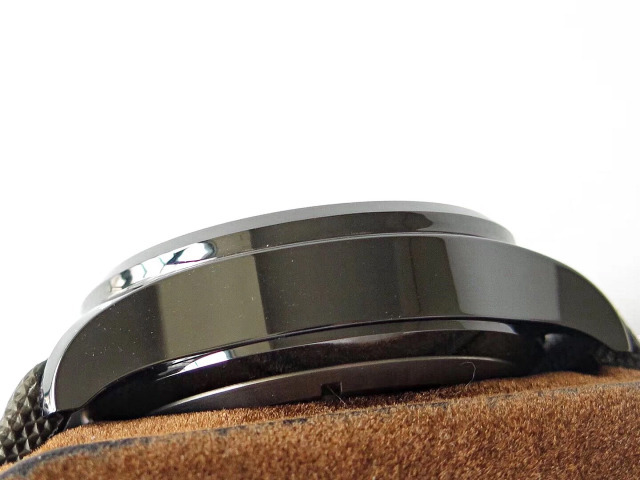 The case is made of 316L stainless steel, the black DLC coating on the case is thick, the whole case is brushed. 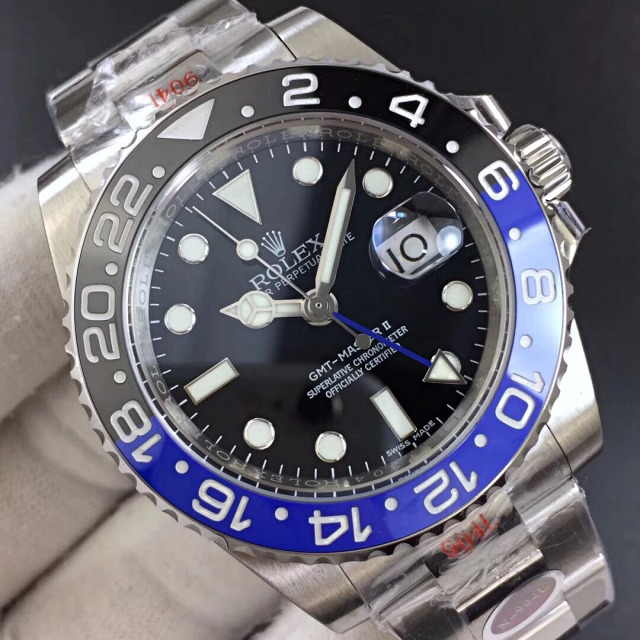 The bezel is made of black ceramic that is imported abroad, it has eight screws to fix the bezel, middle case and case back together. 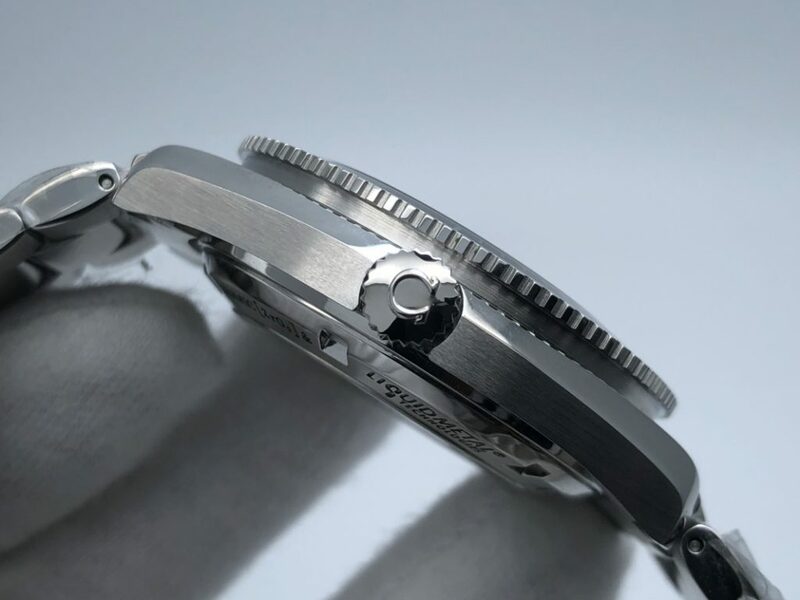 Case back is solid, the screws are in white stainless steel, not black on the bezel. 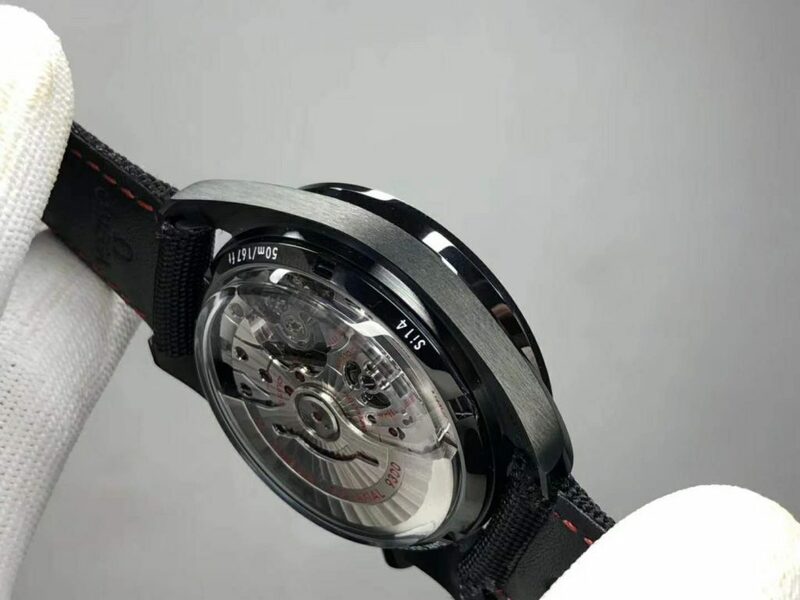 Black dial is checkered style, there are white stainless steel hour markers and hands, the hour hand and minute hand are skeletonized. 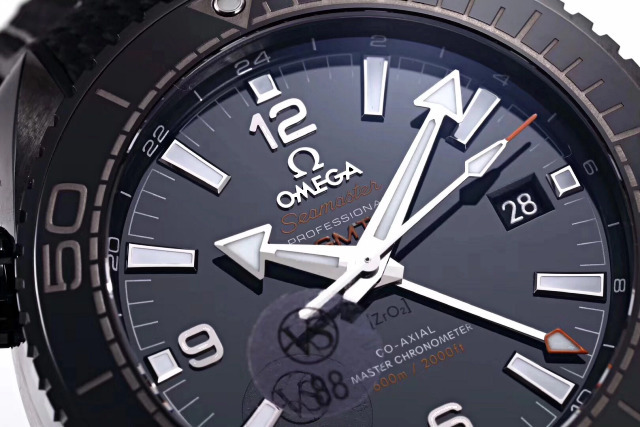 Three small dials are working, small seconds hand with a red tip is running on the subdial at 12 o’clock. 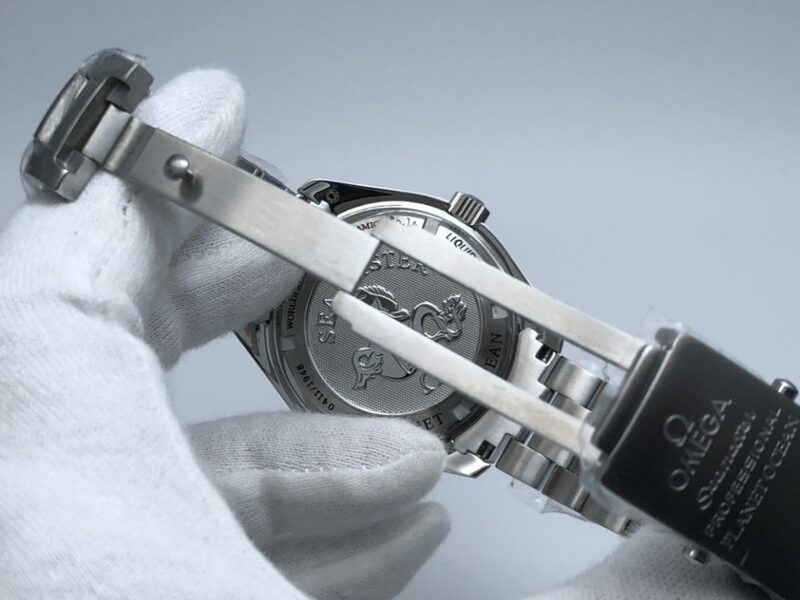 30-minute chronograph counter is set at 9 o’clock, 12-hour chronograph counter is positioned at 6 o’clock. 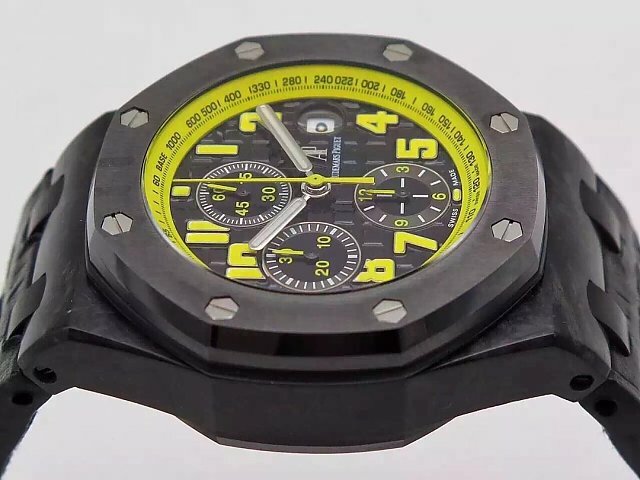 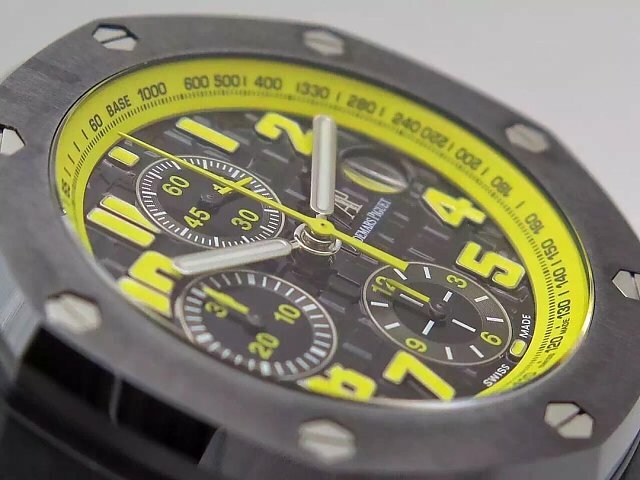 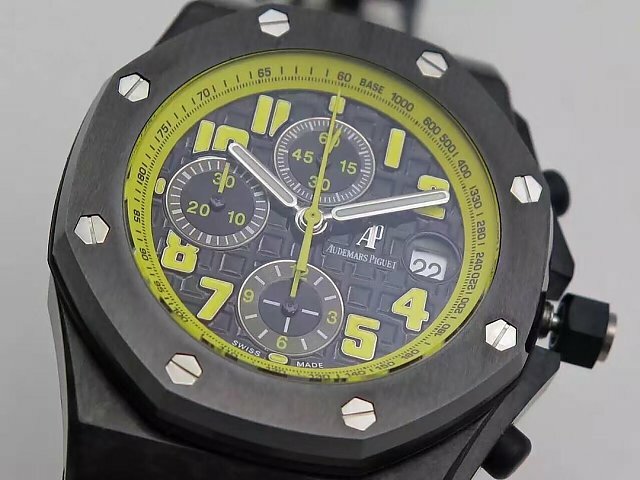 Compared with other Audemars Piguet watches, the subdials of this one seem to be bigger. 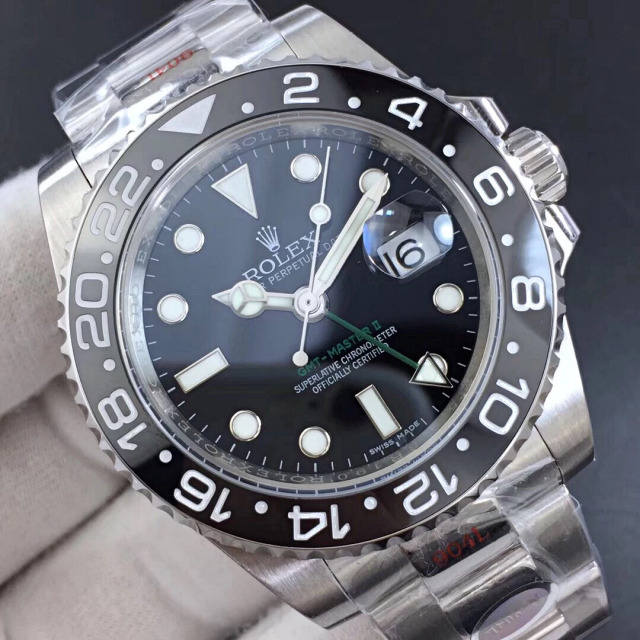 Date window has a black round frame, date font is black in white background. 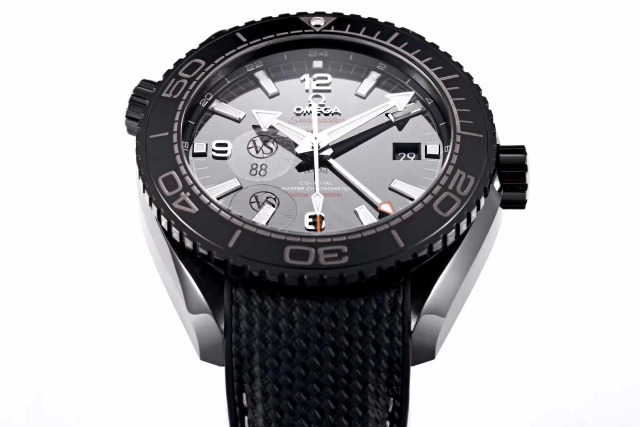 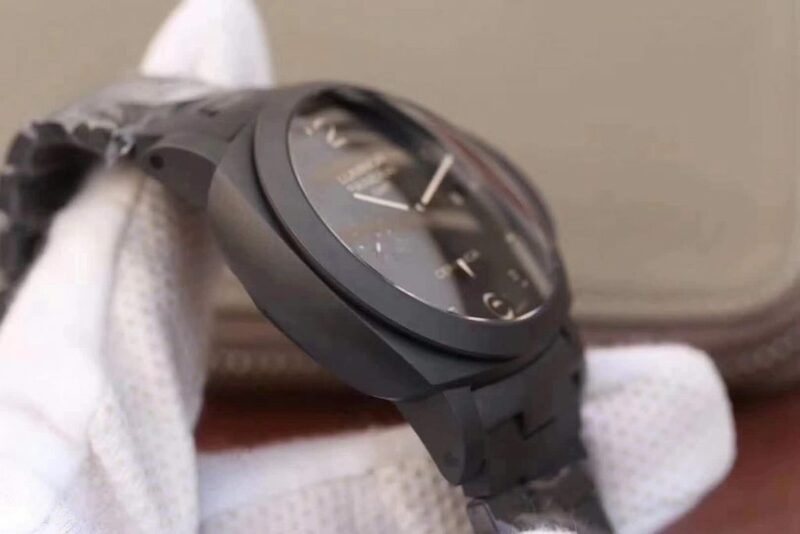 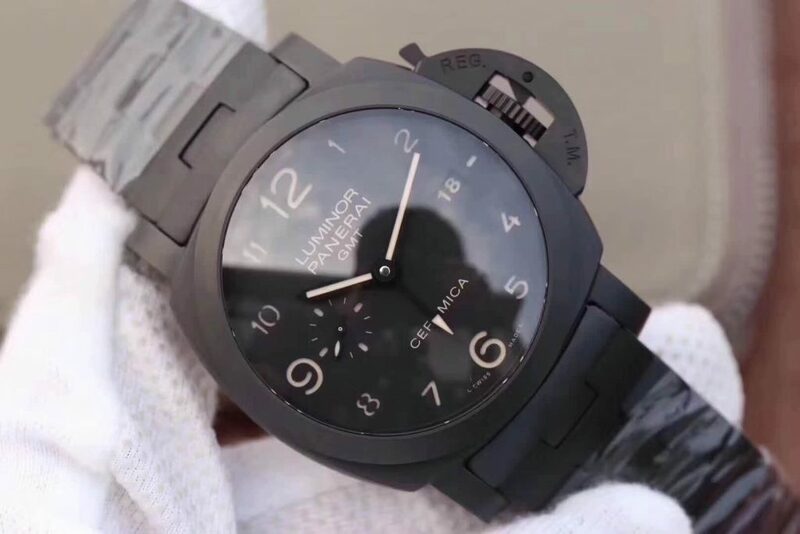 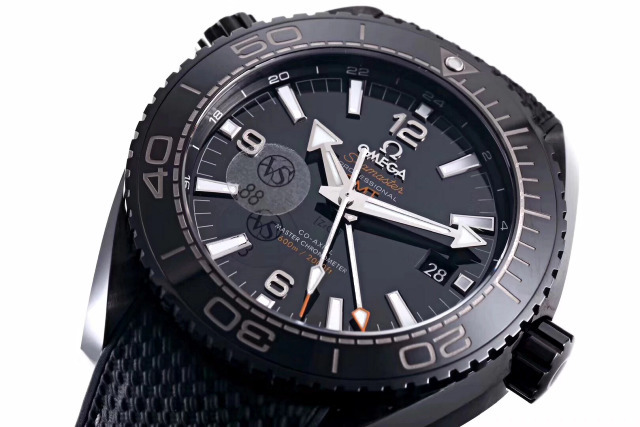 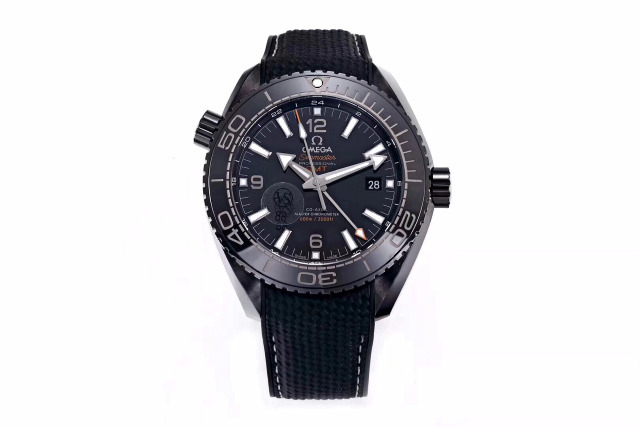 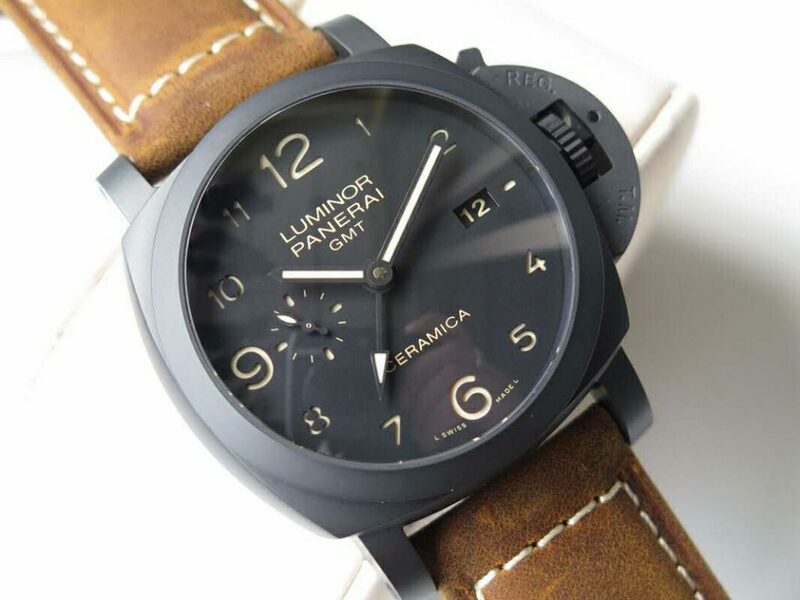 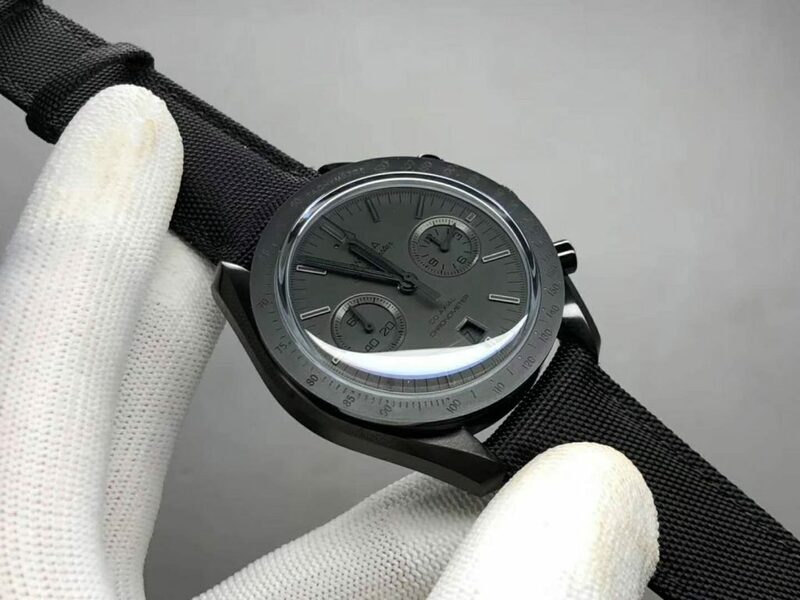 Under the full black appearance, the black dial is also highly readable, with reasonable layout design, you can easily read time and date information from the dial. 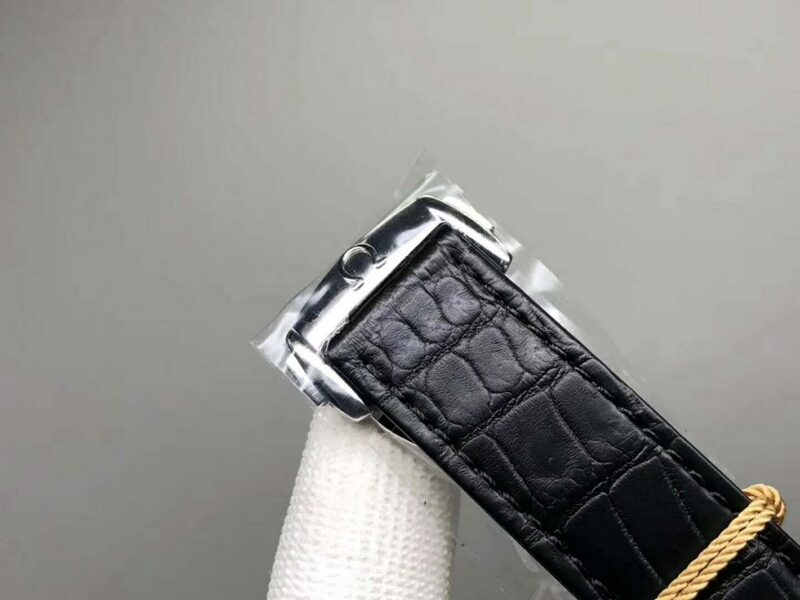 The replica watch is equipped with a black rubber band with a tang buckle, which is made of stainless steel and DLC processed. 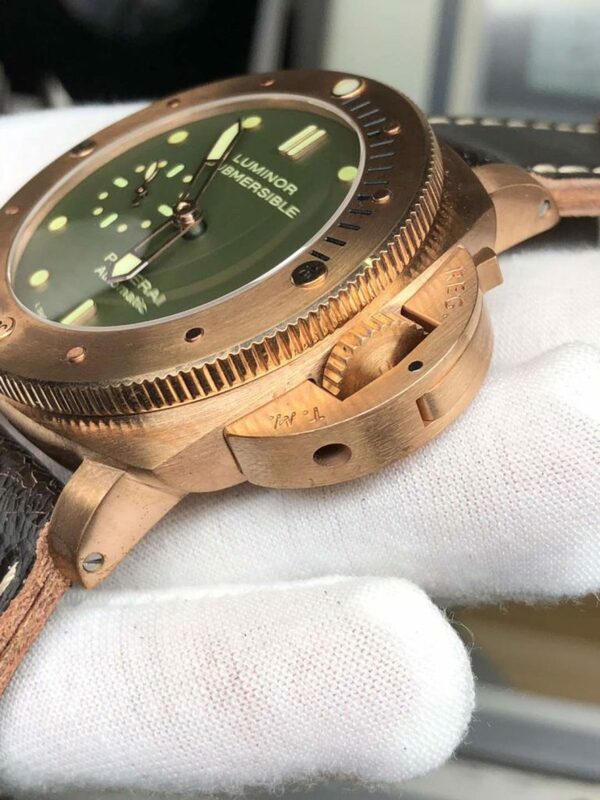 The factory also offers one pair of red leather straps for this replica, it is free, the wrist bands attached with the watch are also free. 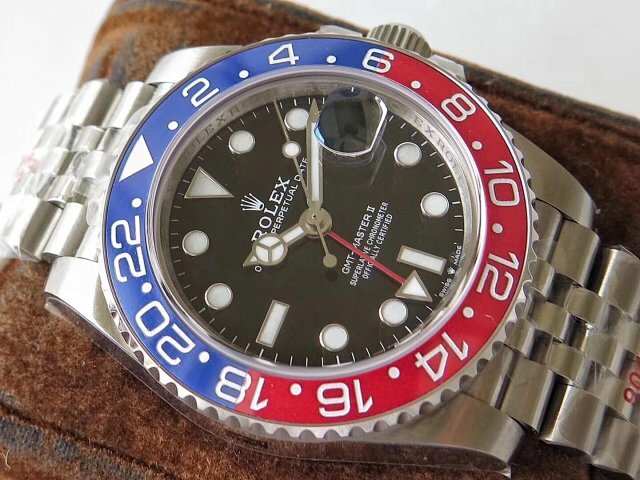 So, with so many free gifts, are you willing to consider to get it? 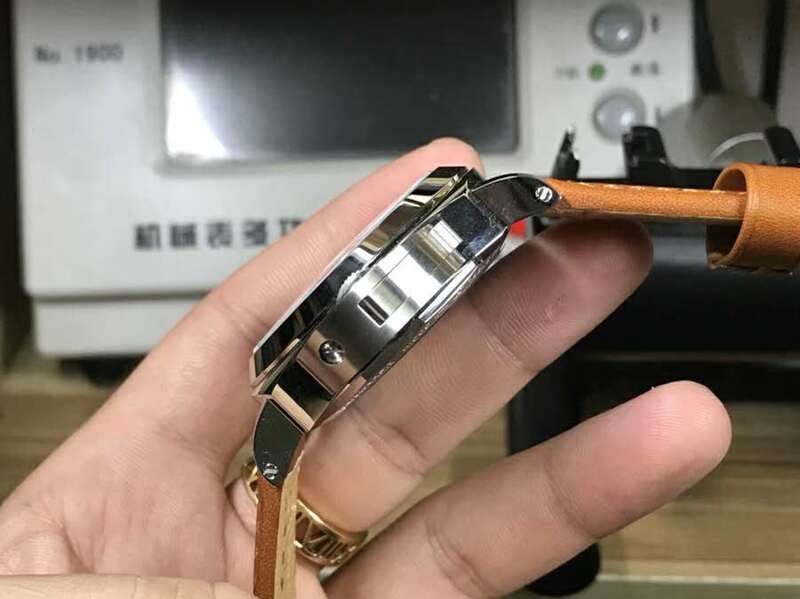 By the way, I have seen that the factory boss wore this watch on the bright red leather band, the red color really fits the watch perfectly. 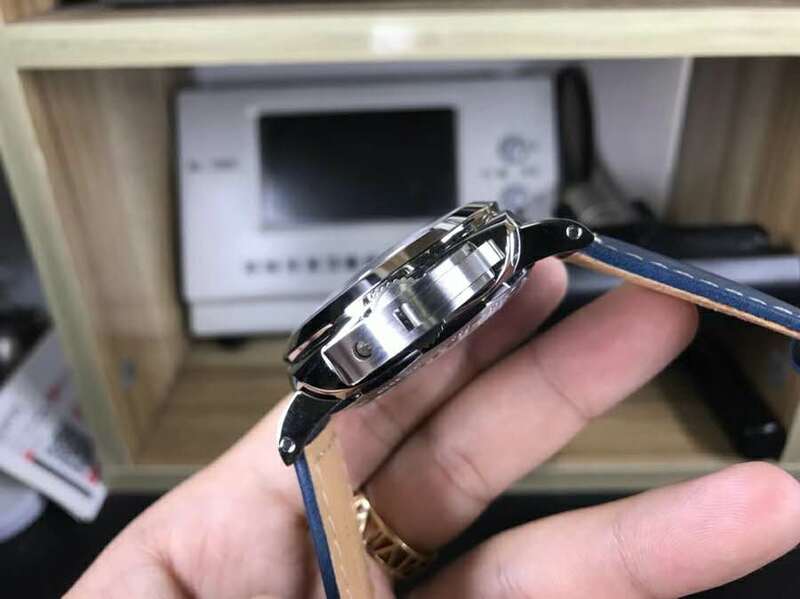 That’s also the reason I want to share a review here. 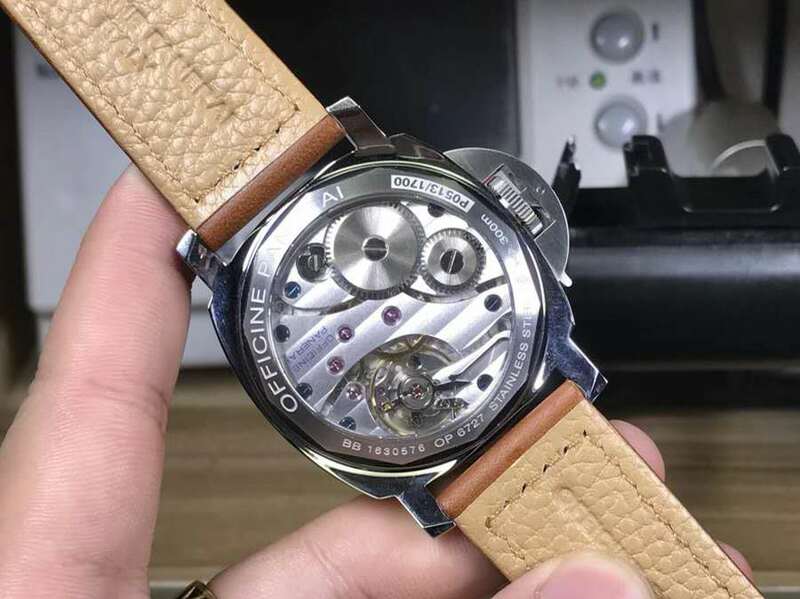 When it comes to the movement, it is an Asia clone 3126, the movement is modified from a Swiss Valjoux 7750, which is the so-called Secs@12 chronograph movement we mentioned. 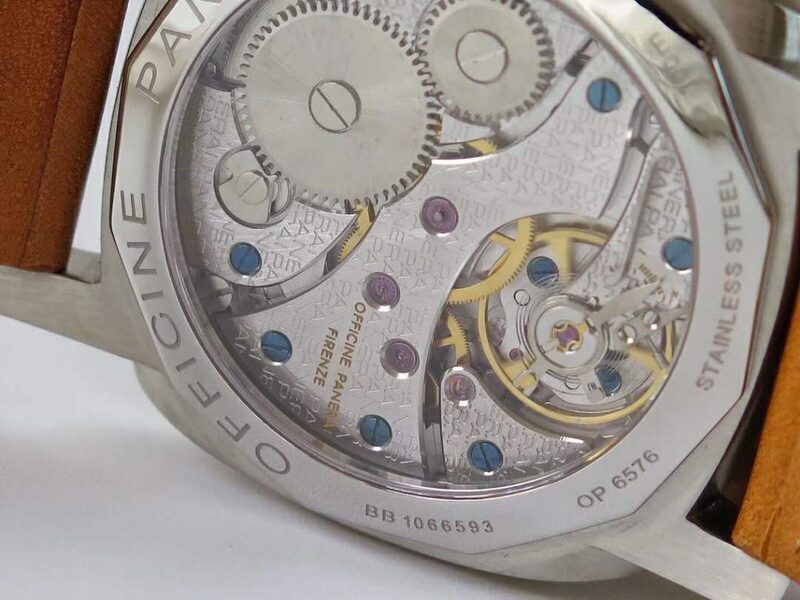 This 7750 chronograph movement has reached all functions that could be found on a genuine watch. 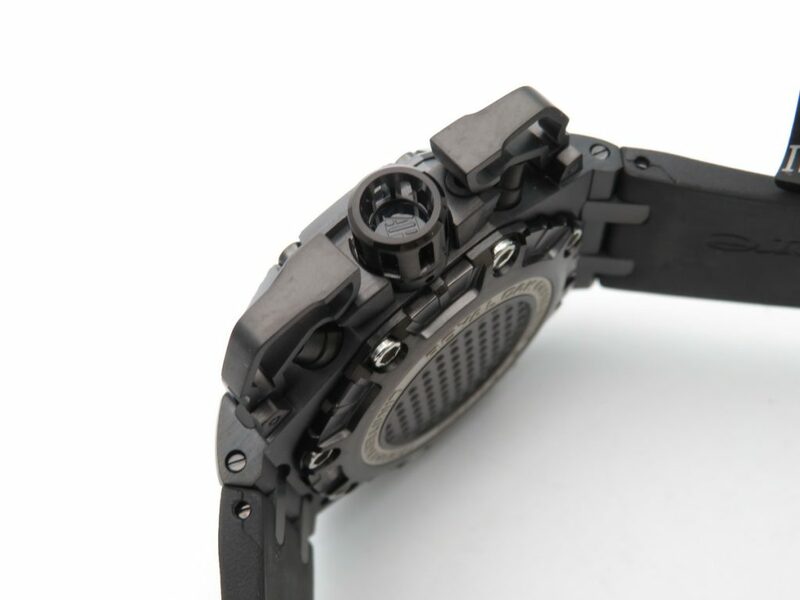 Besides, having been tested for years, this movement has an extremely high stability. 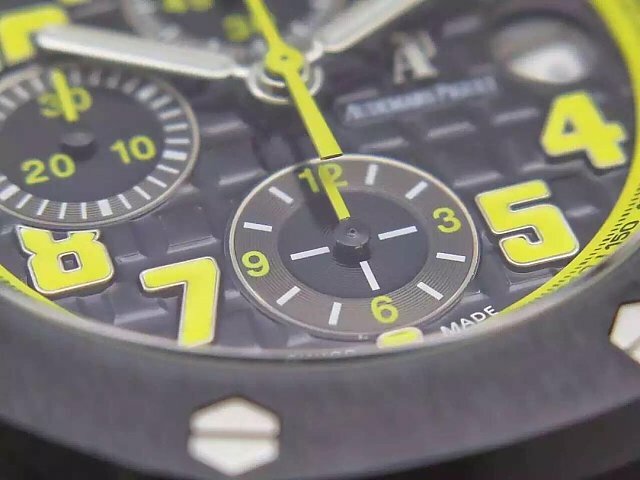 In 2018 SIHH, Audemars Piguet published this green ceramic watch, it has a special name “Combat”. 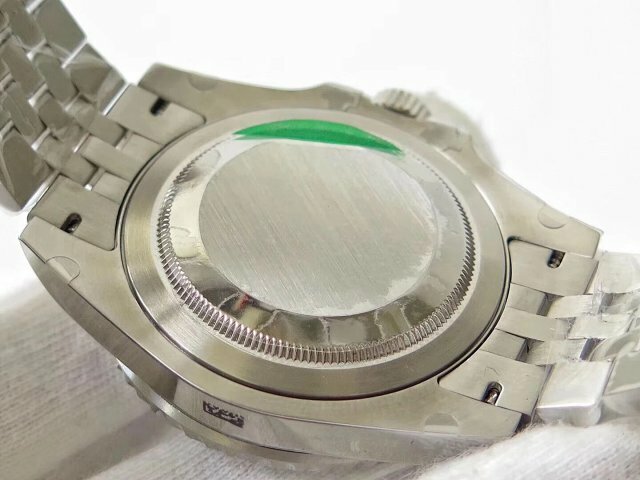 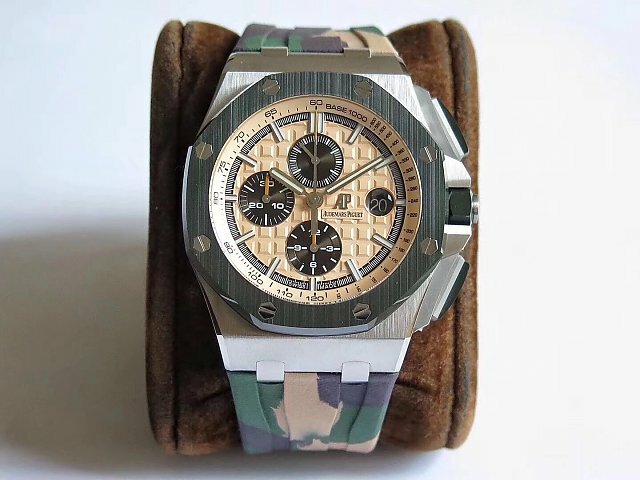 The watch also has one pair of camouflage green strap. 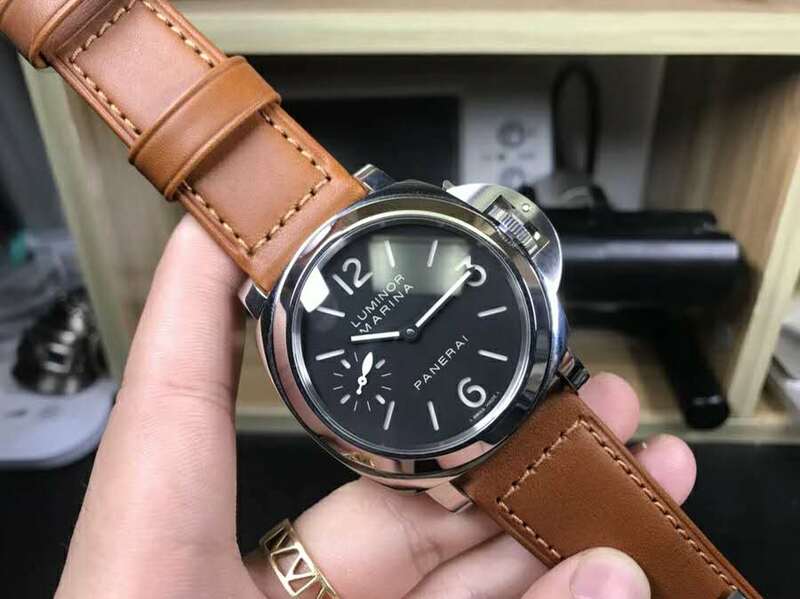 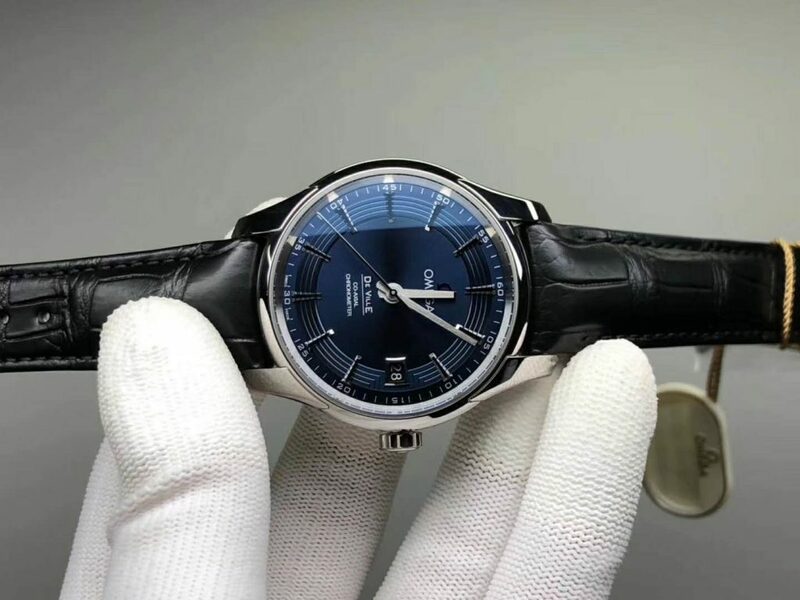 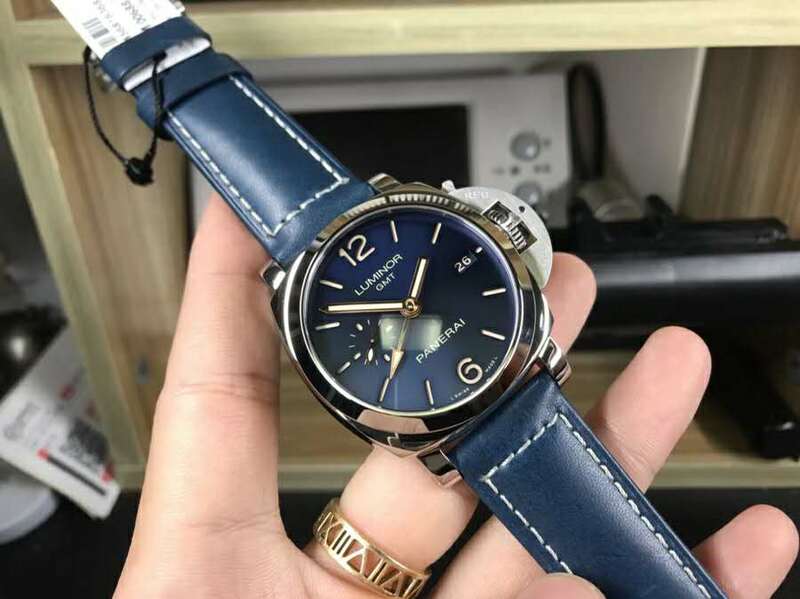 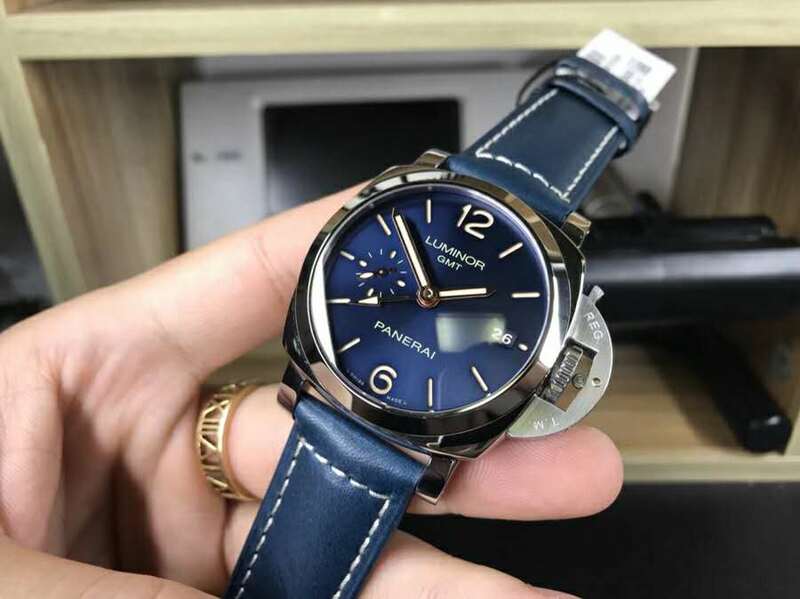 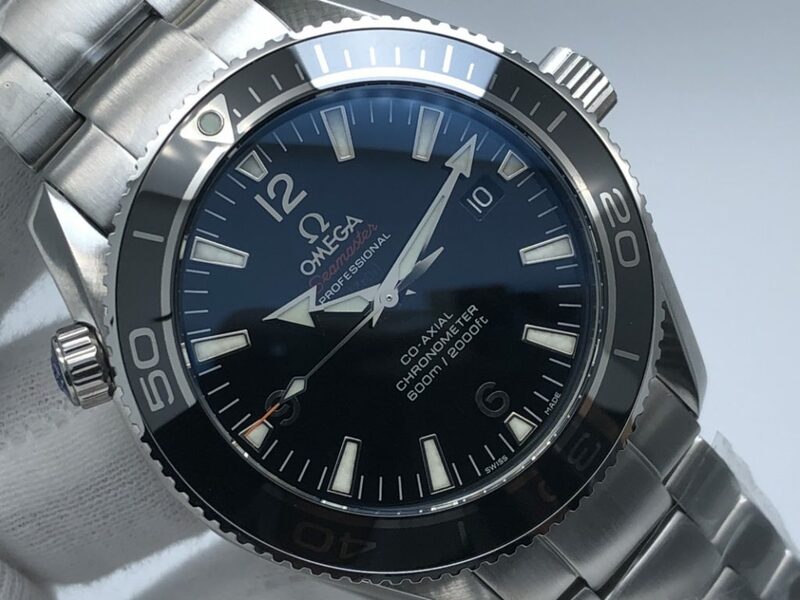 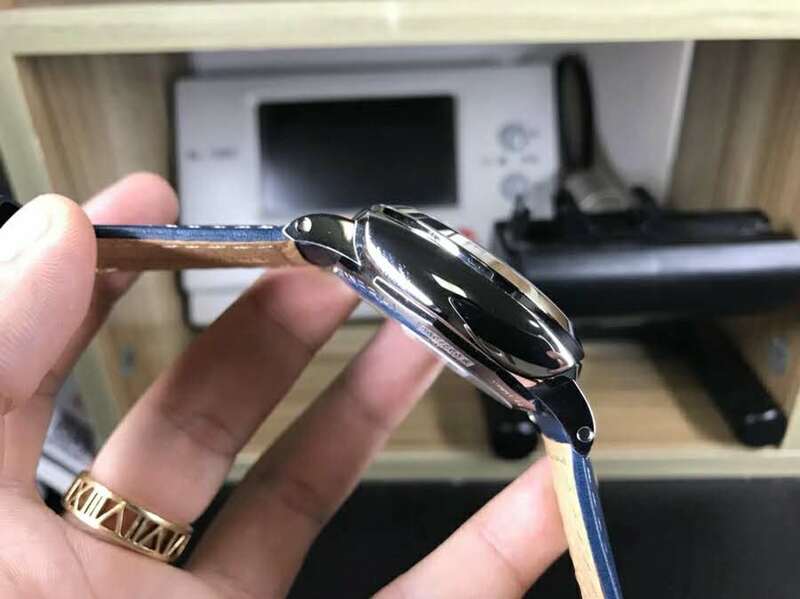 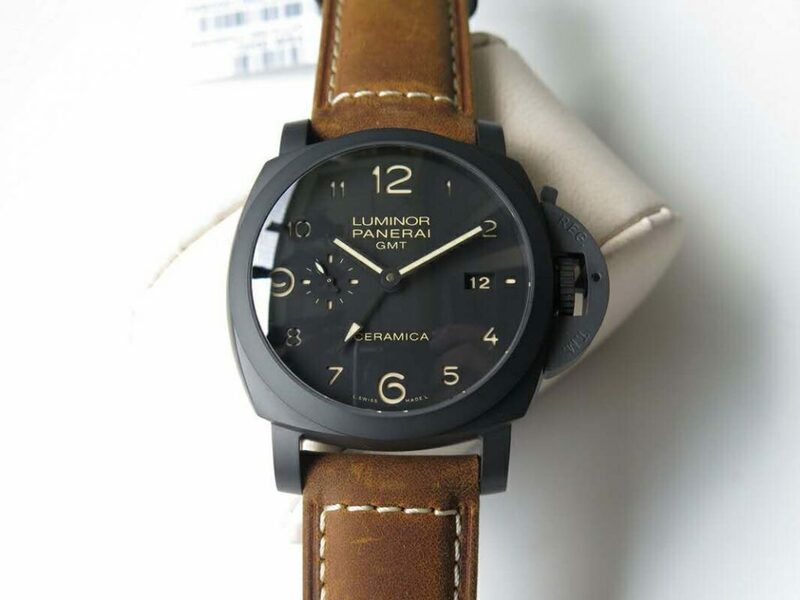 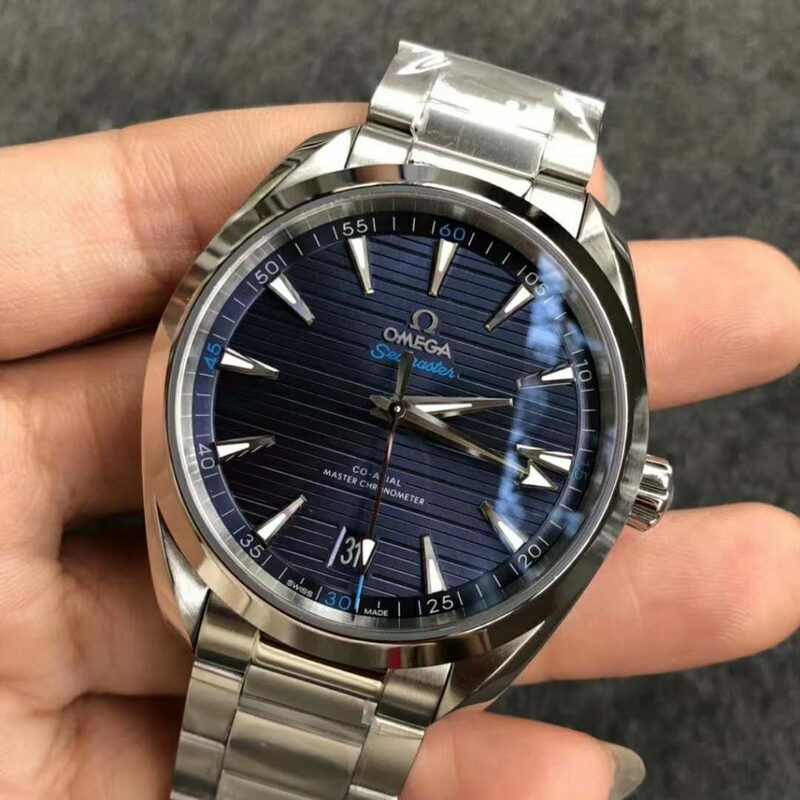 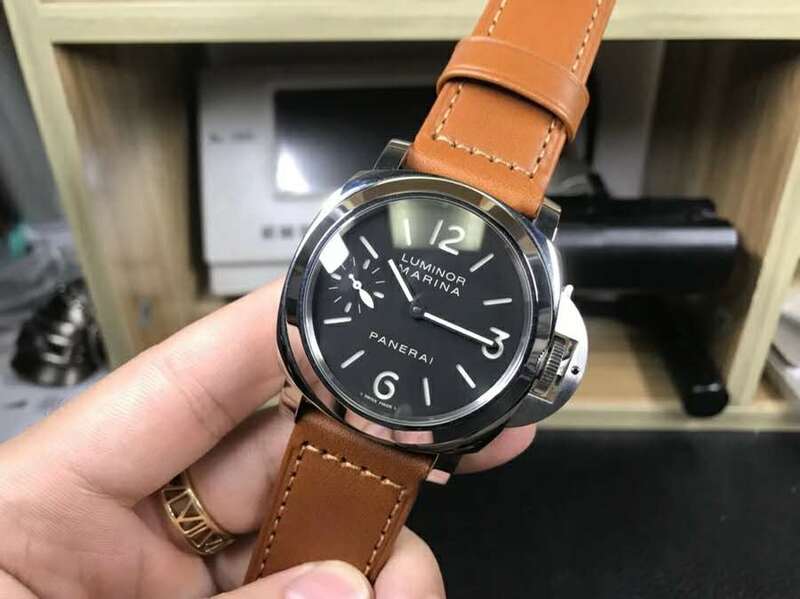 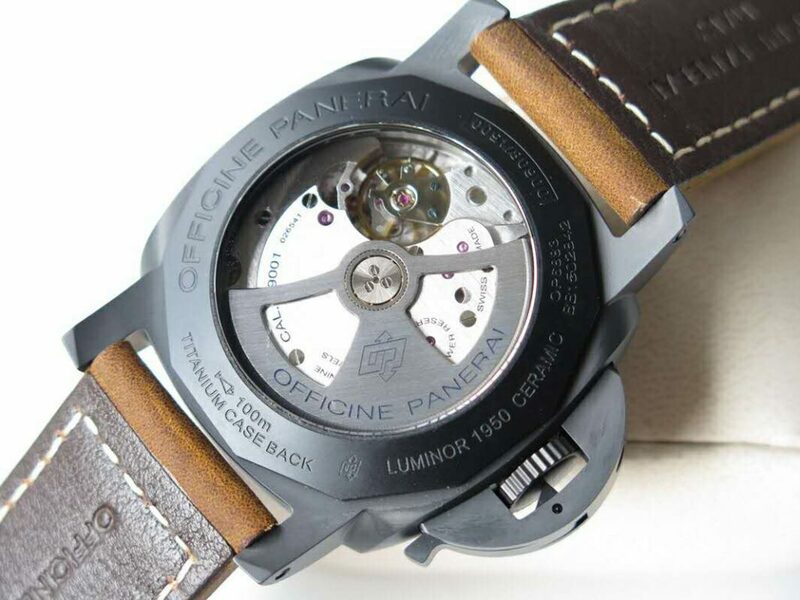 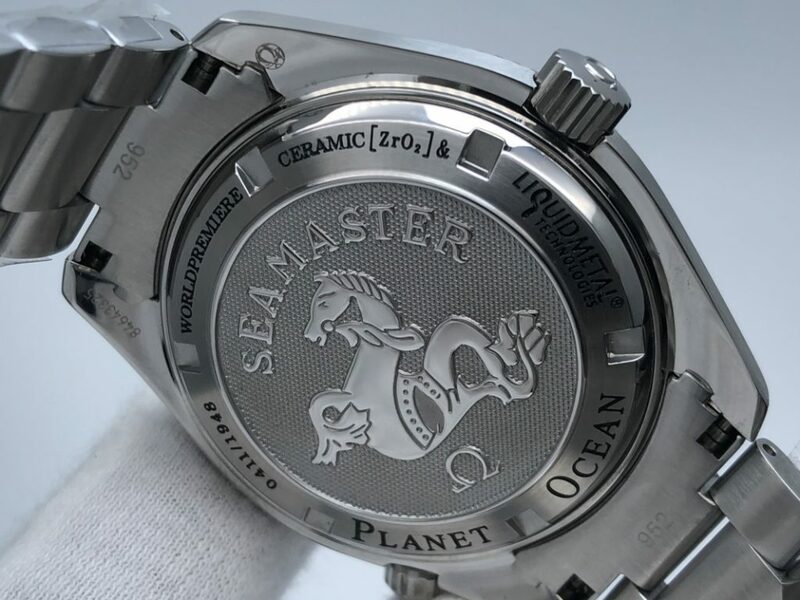 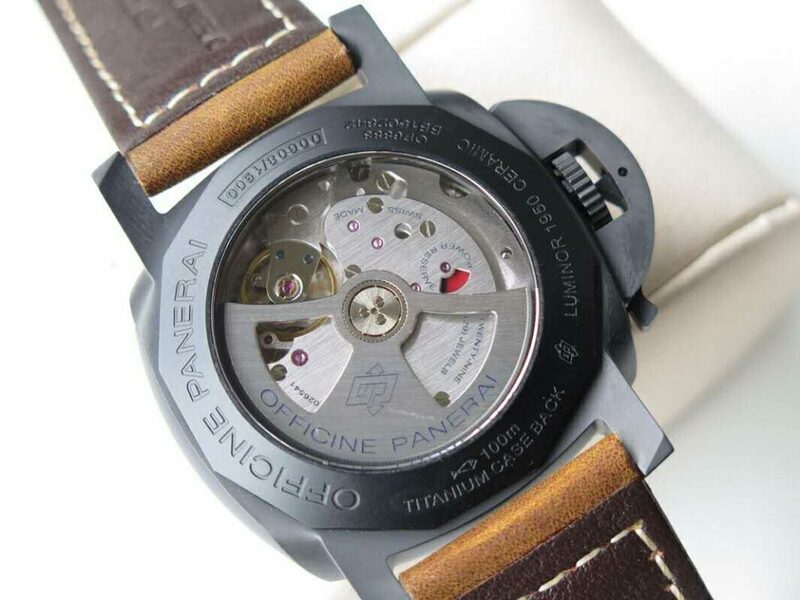 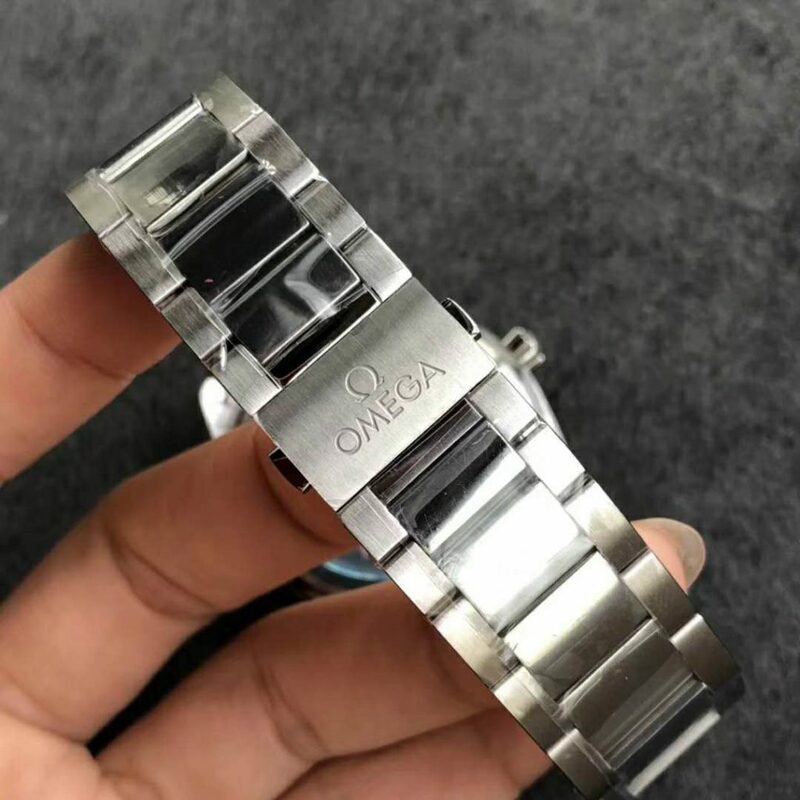 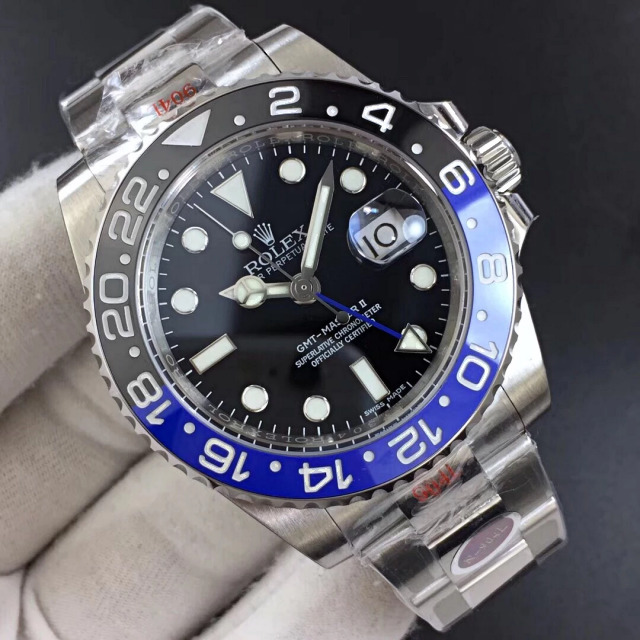 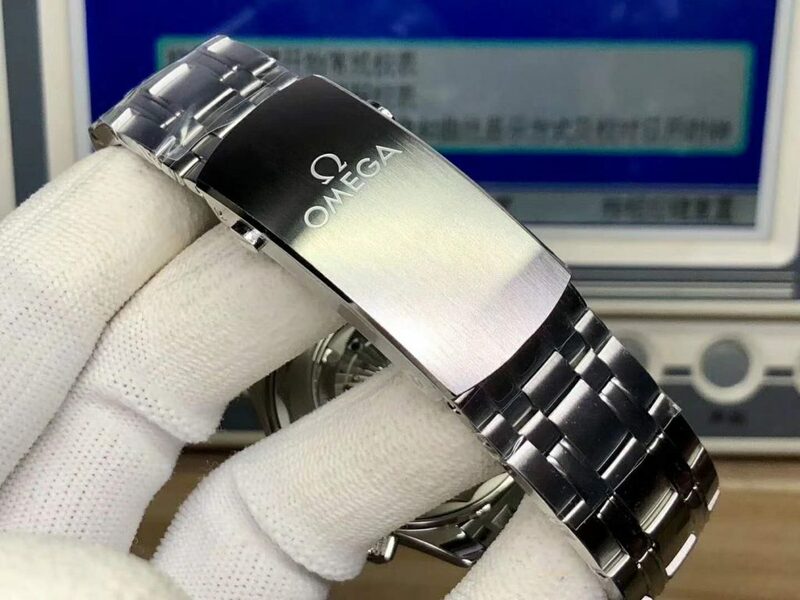 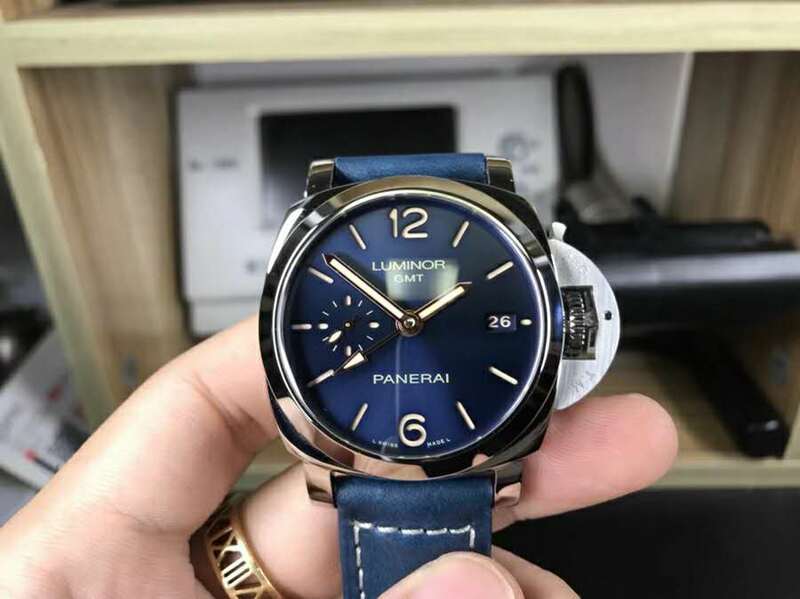 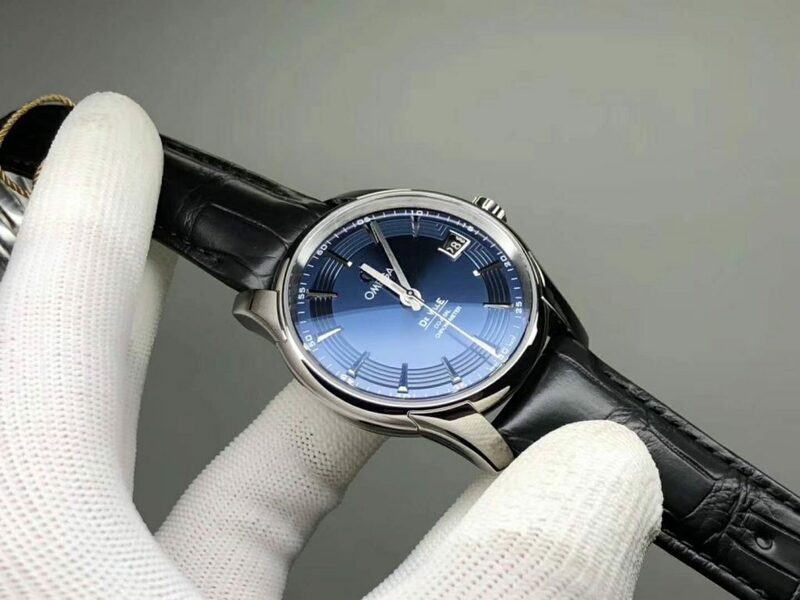 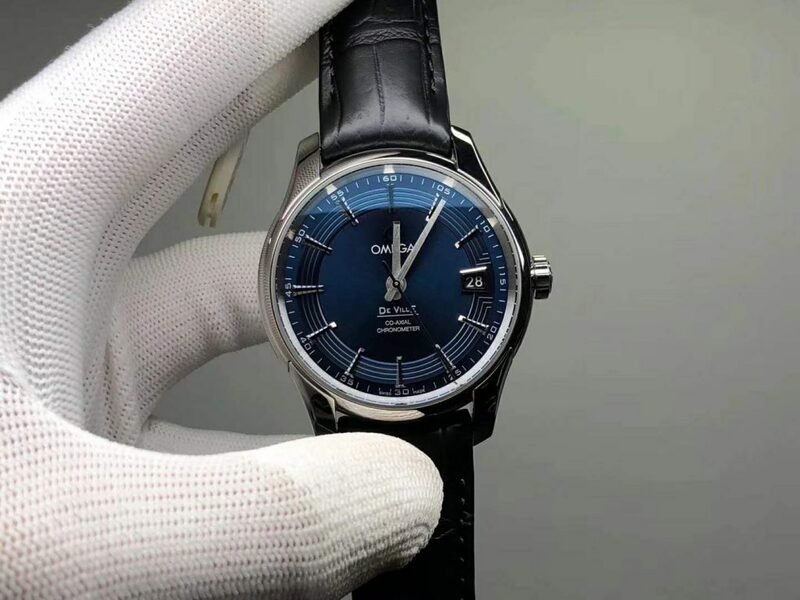 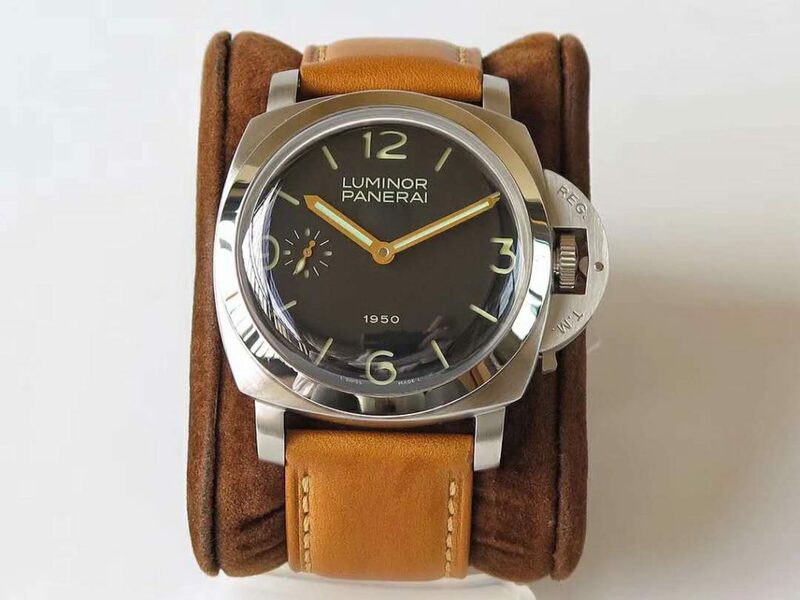 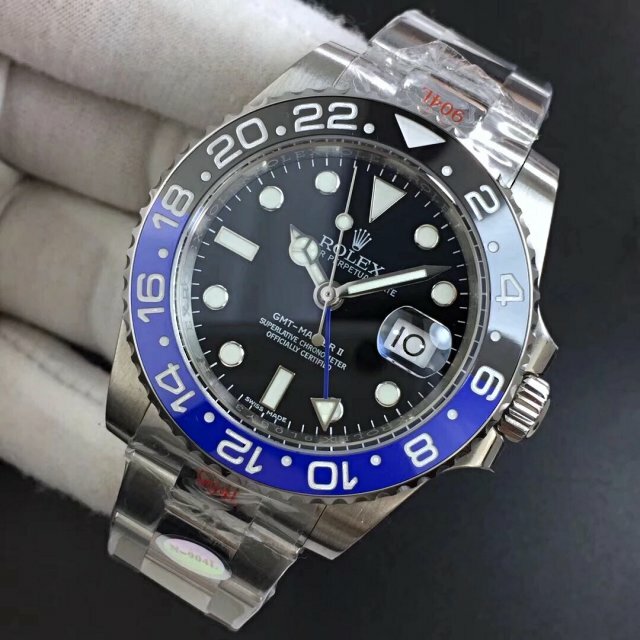 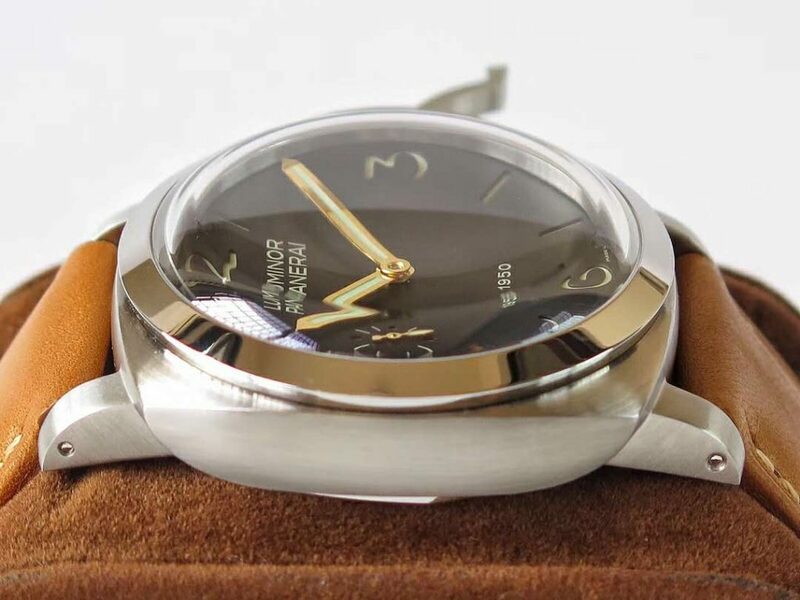 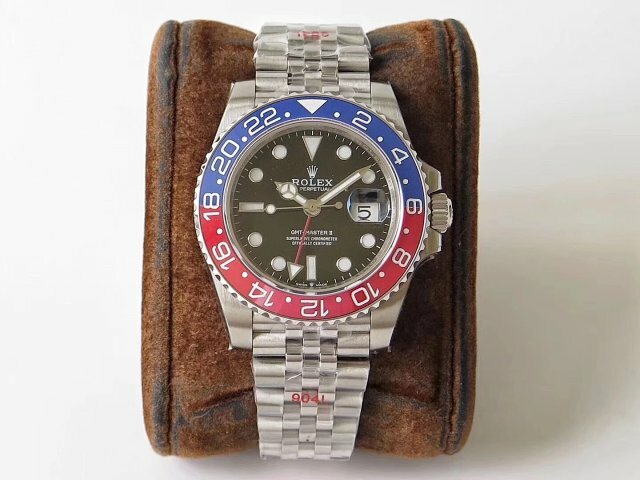 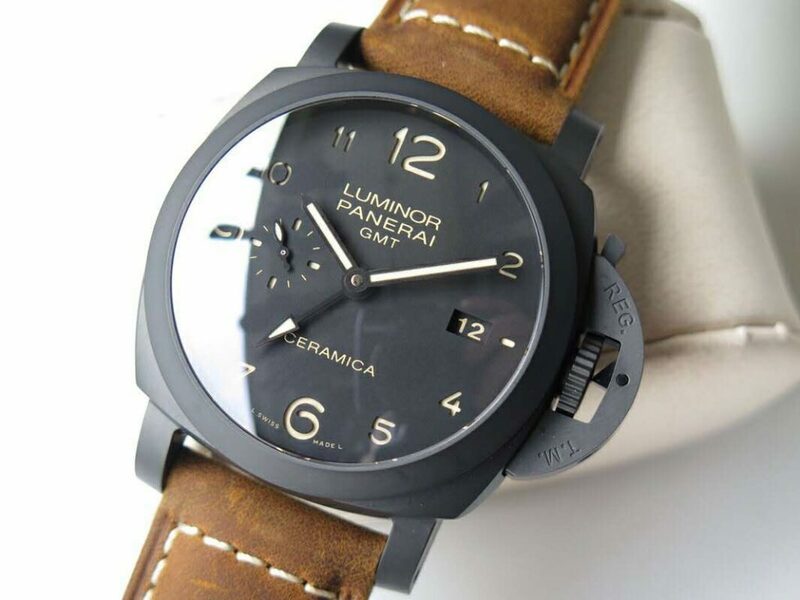 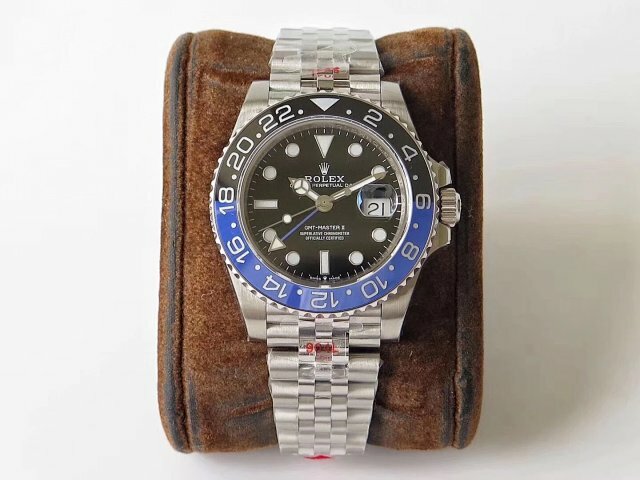 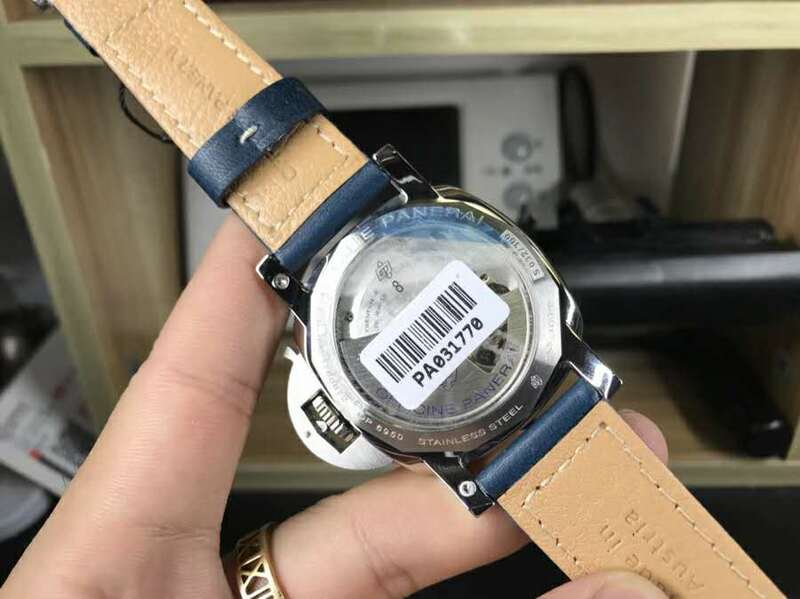 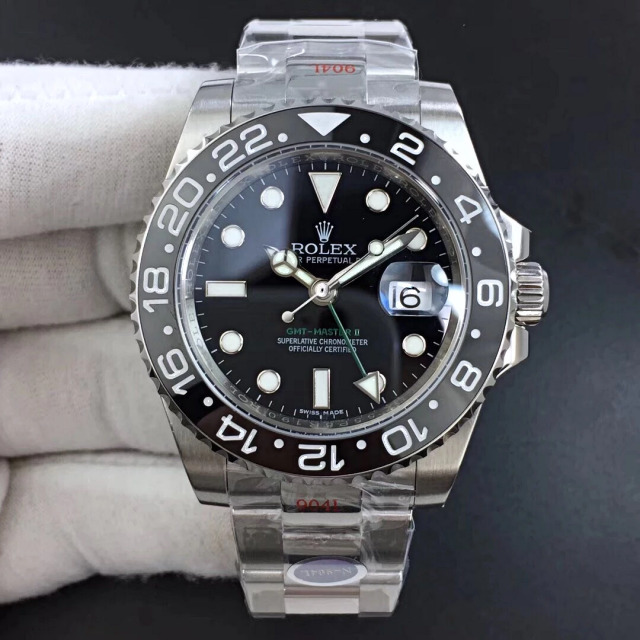 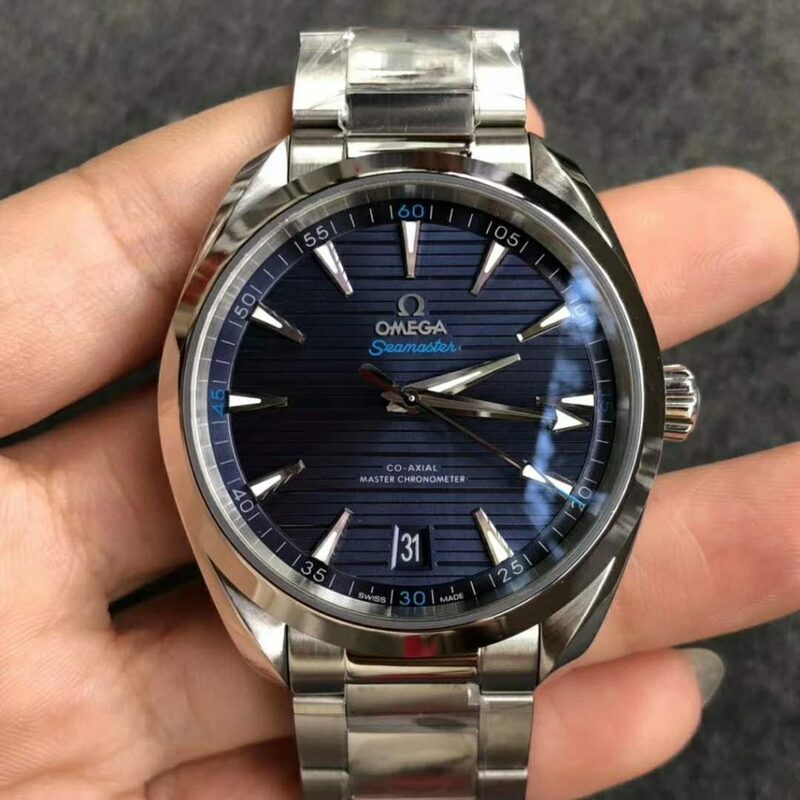 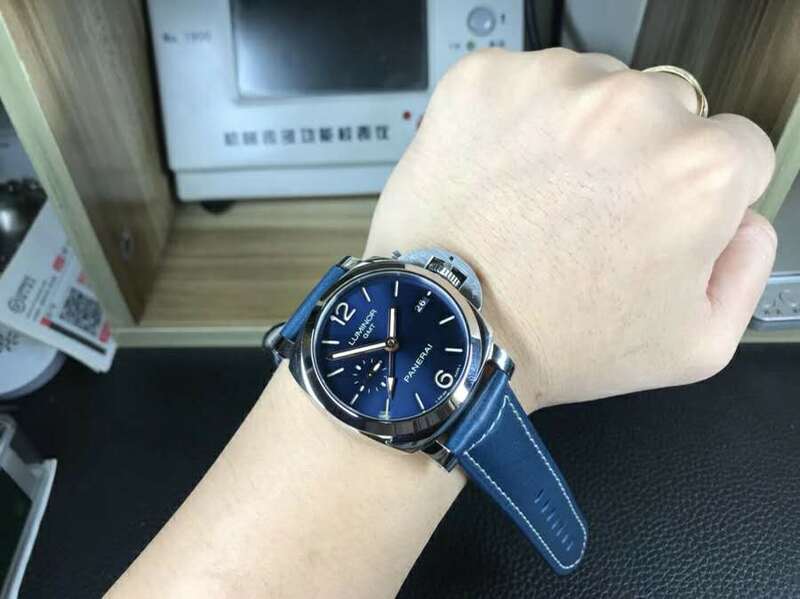 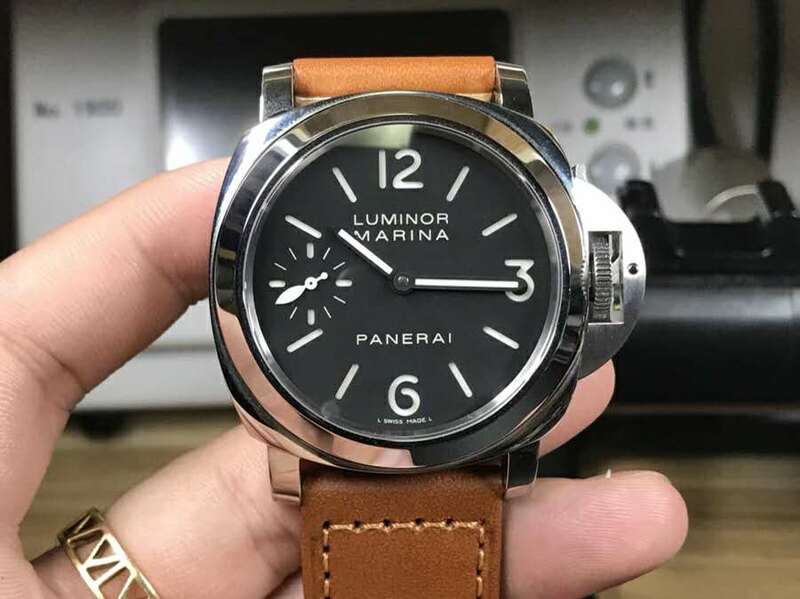 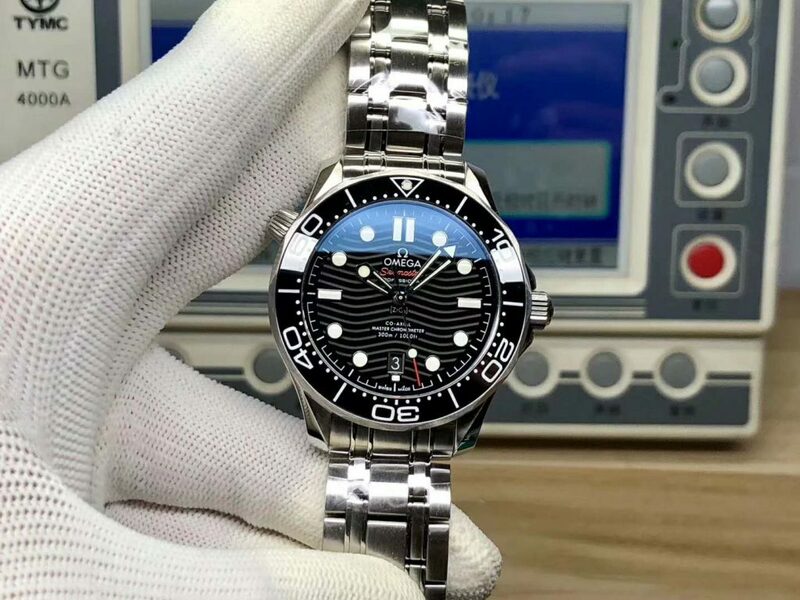 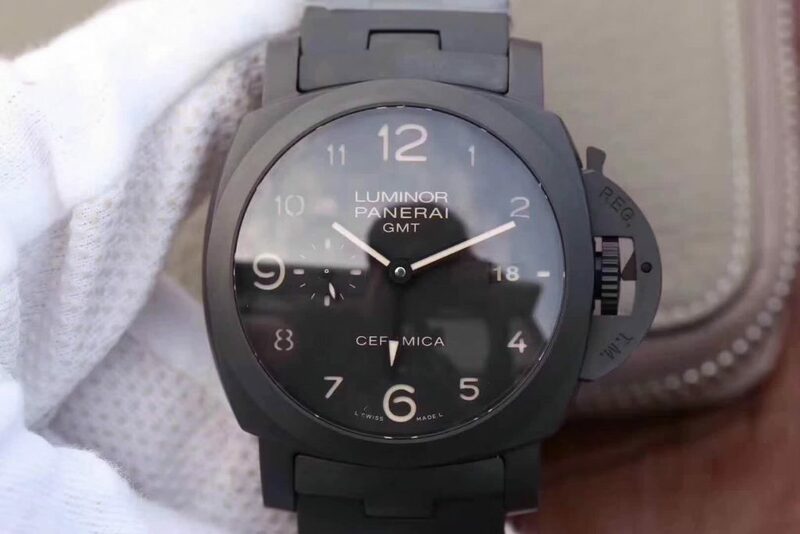 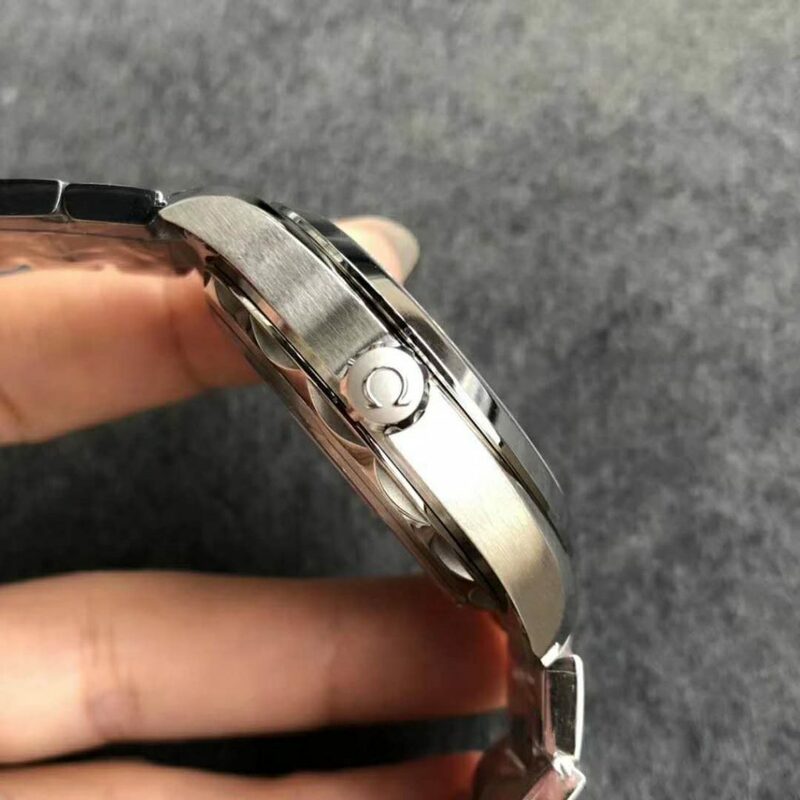 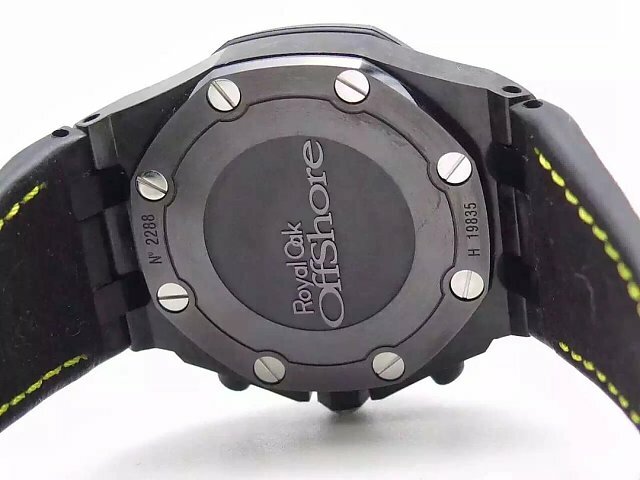 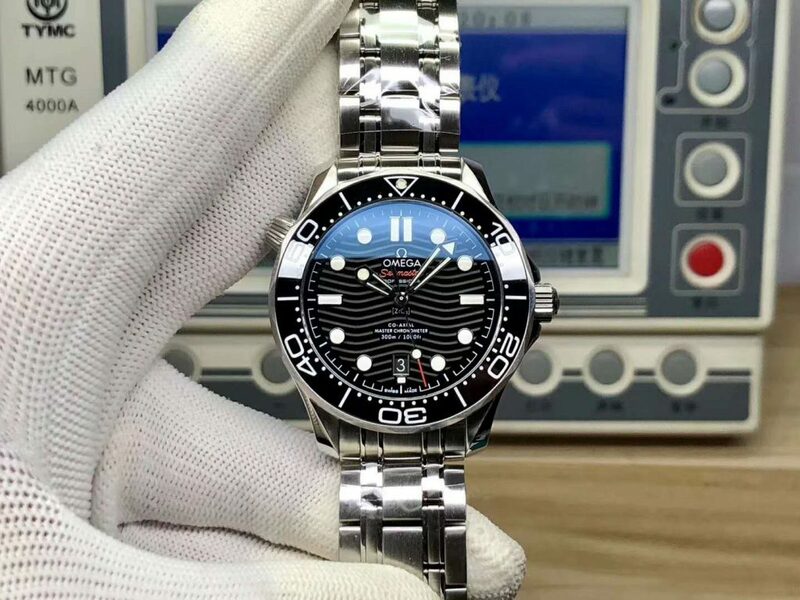 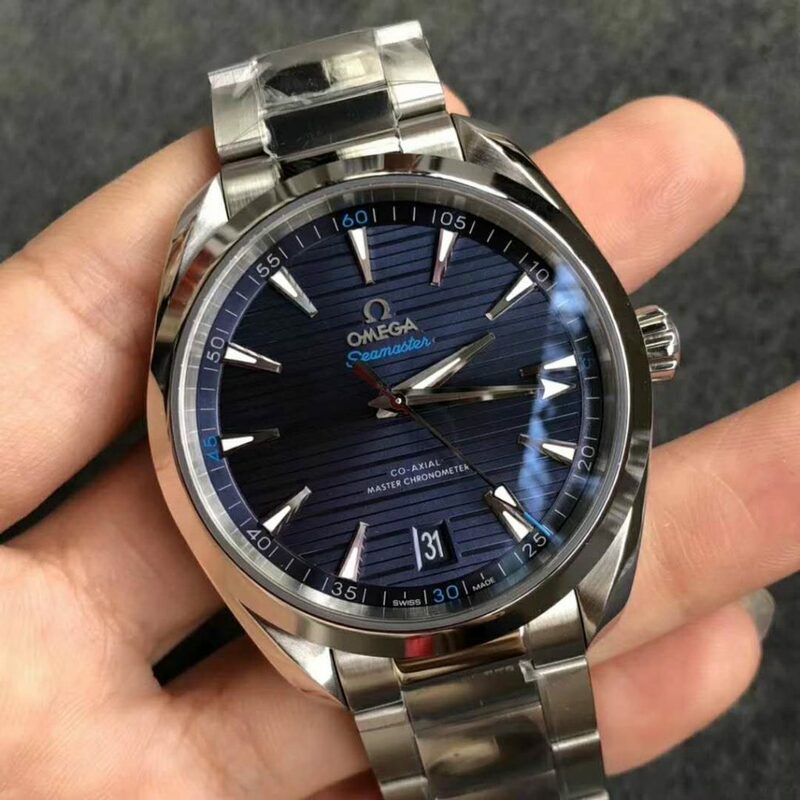 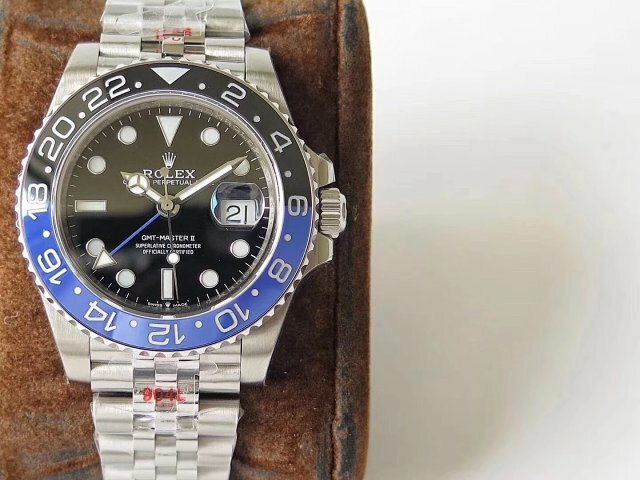 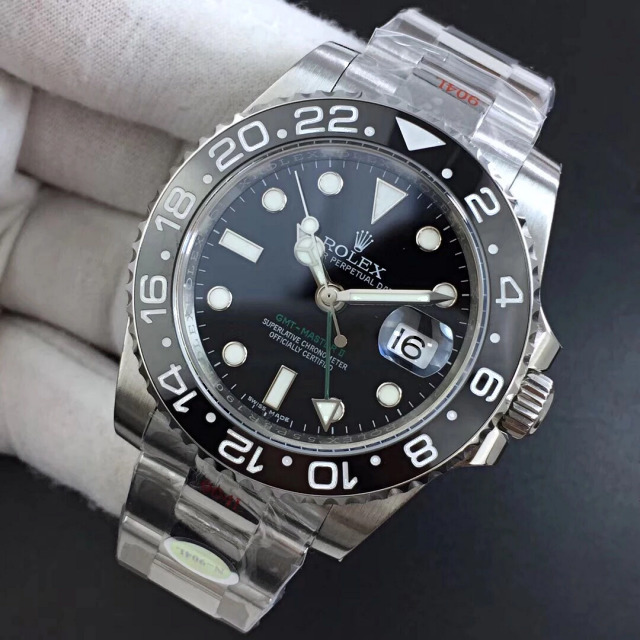 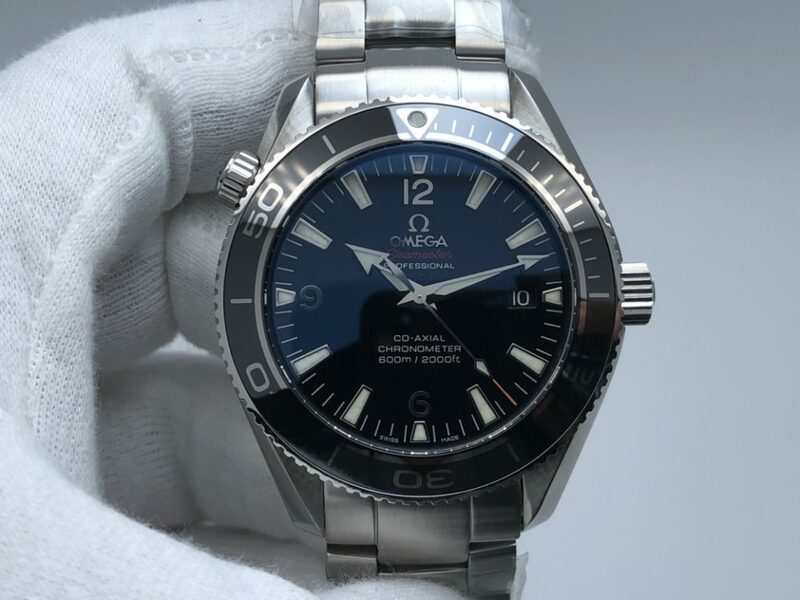 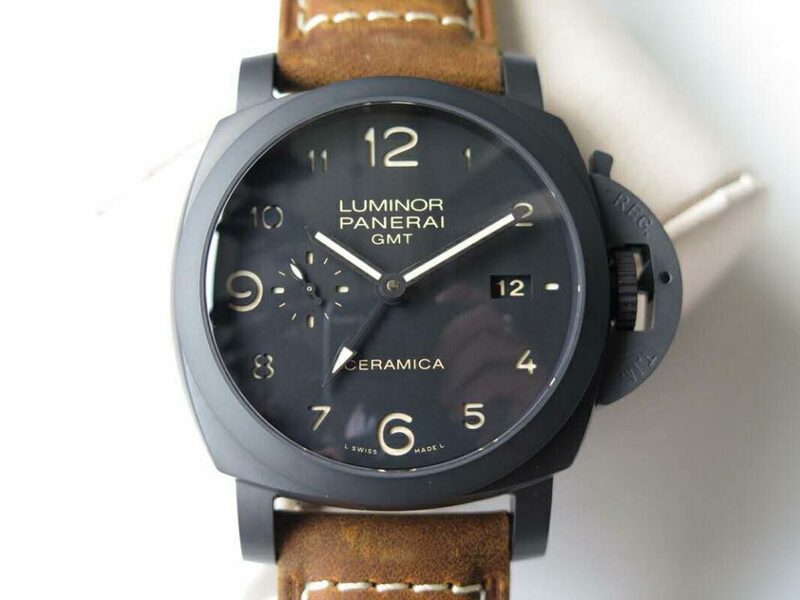 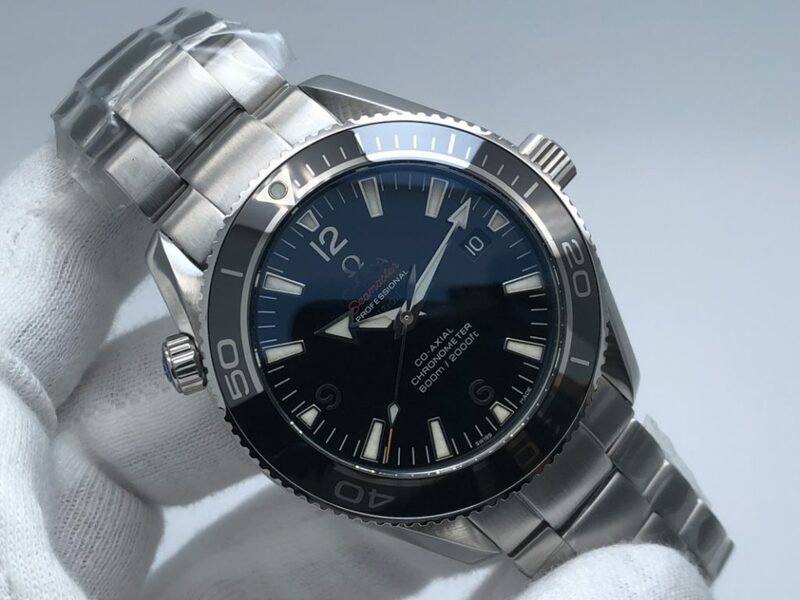 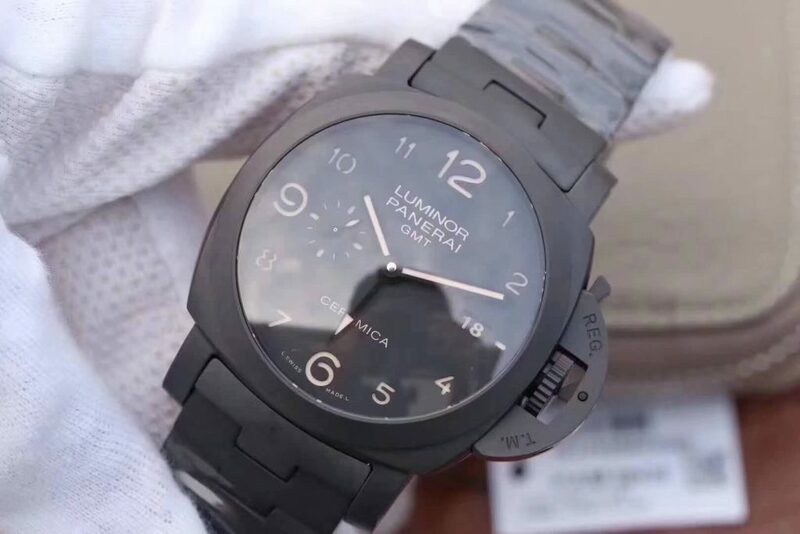 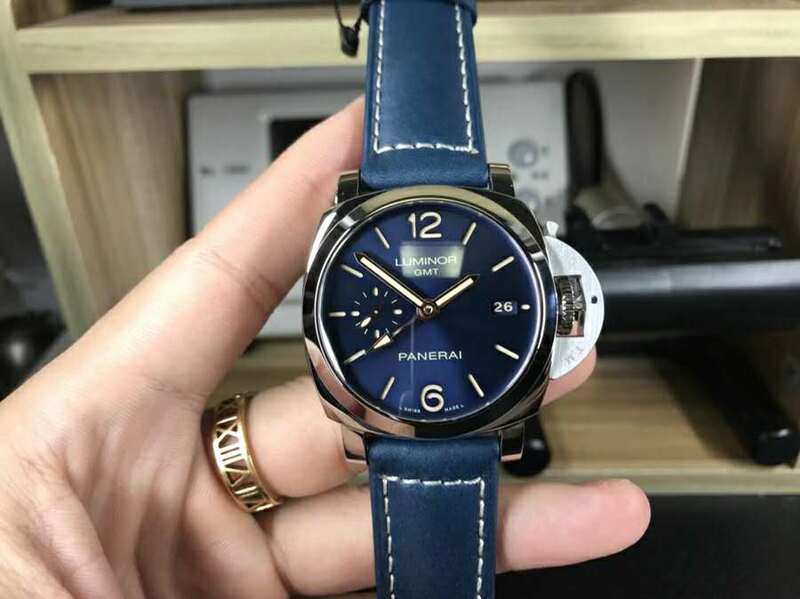 So, it immediately caught the attention of some replica watch manufacturers in our market, some replicated it and install with one quartz movement, the quality is not good. 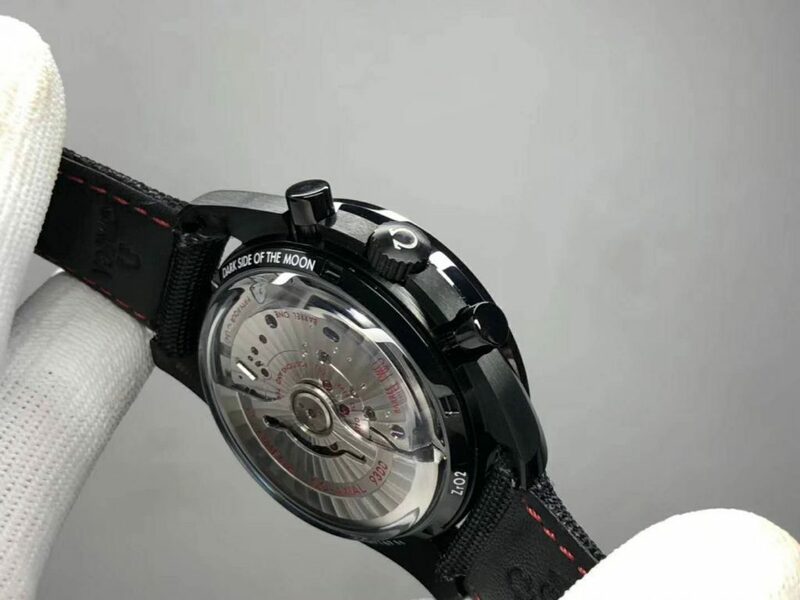 If you want a real 1:1 Swiss replica, then go with this one made by J12 factory. 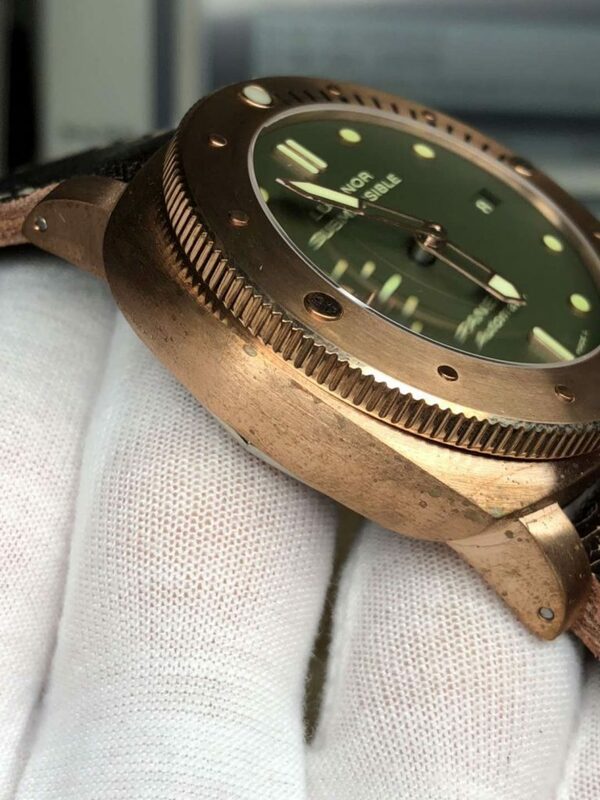 In short period, J12 has made two two big improvements on this replica and this is the latest V2 edition. 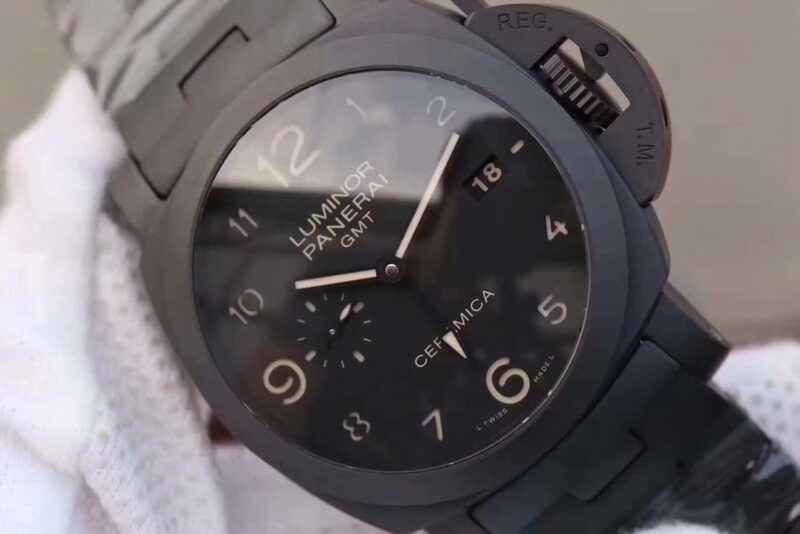 The watch was updated in bezel, date magnifier, case back, etc. 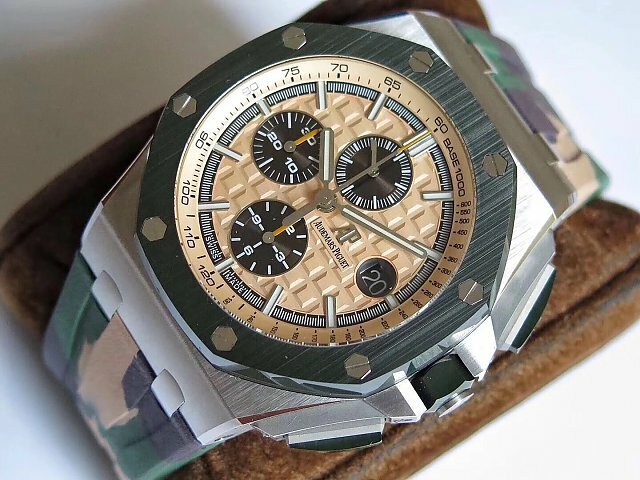 Most importantly, this Audemars Piguet green ceramic replica watch is equipped with A3126, which is independently researched and developed by J12 factory. 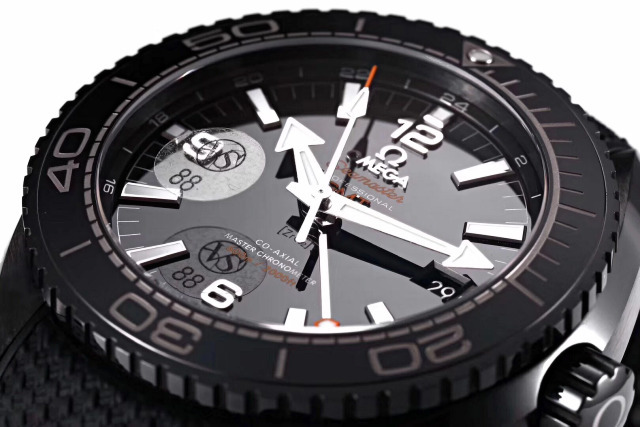 The A3126 has a extremely high accuracy and reliability. 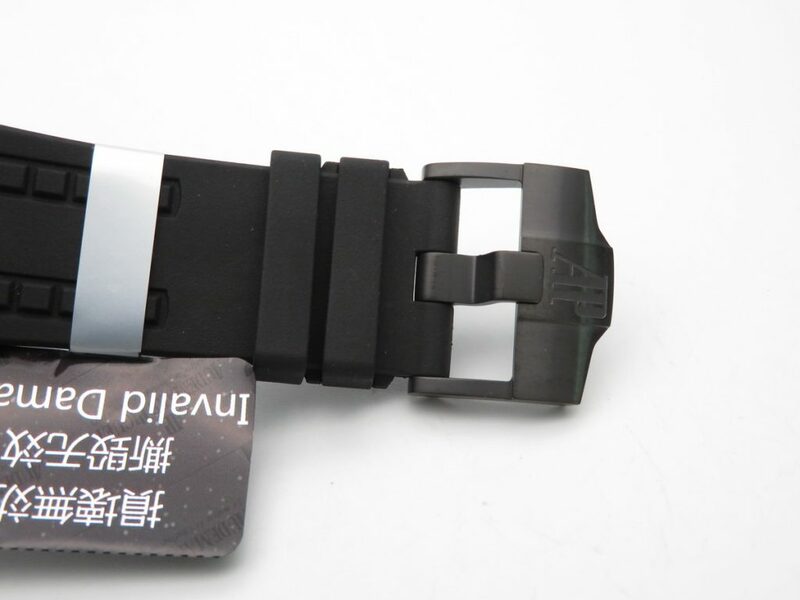 By the way, J12 factory also offers one pair of green rubber strap for free, but the quantity is limited. 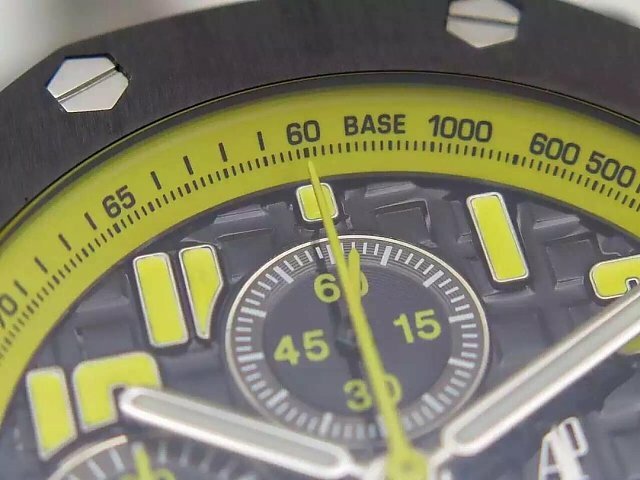 Audemars Piguet has a big case size, including this 2018 Combat model. 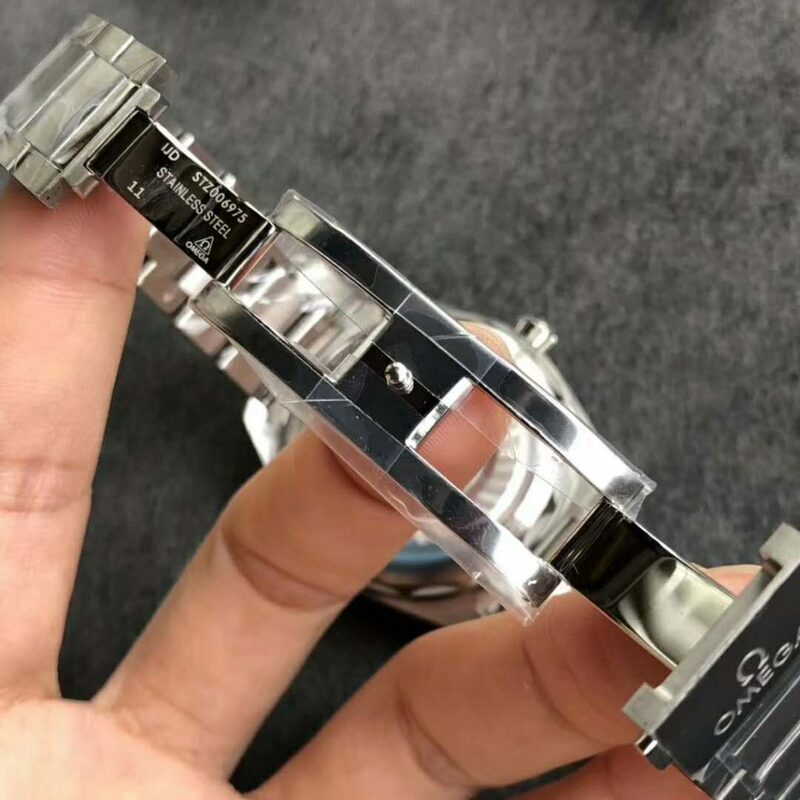 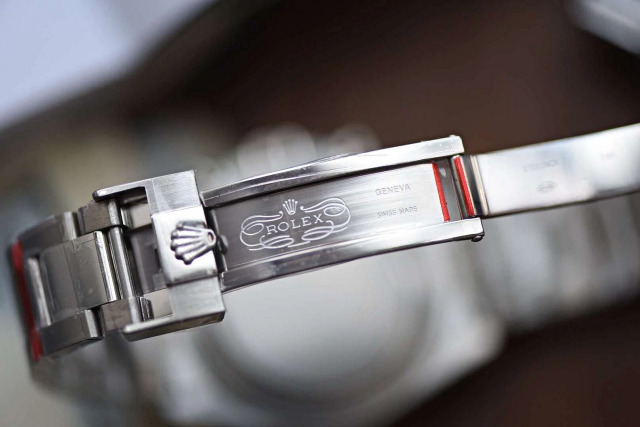 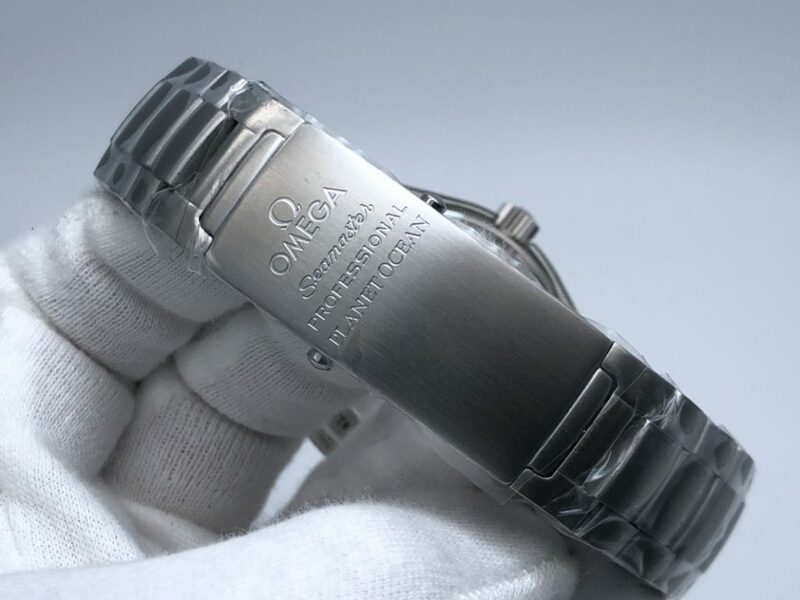 Its case is measured to be 44mm in diameter, the thickness is almost the same as genuine, which is 16mm. 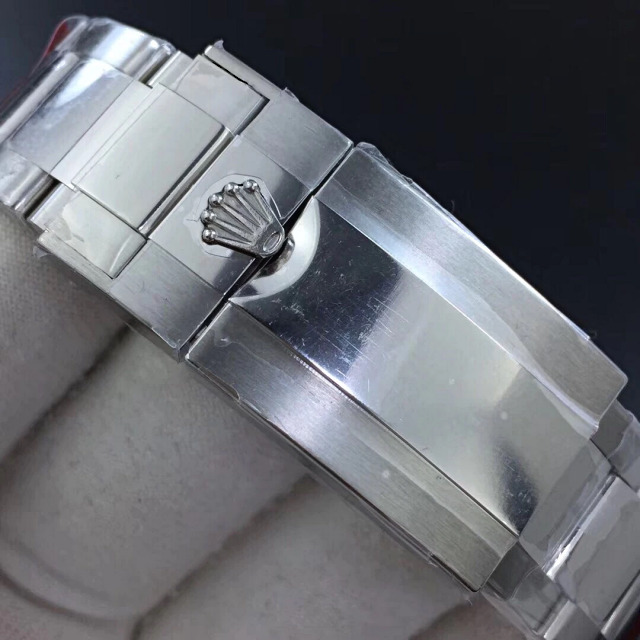 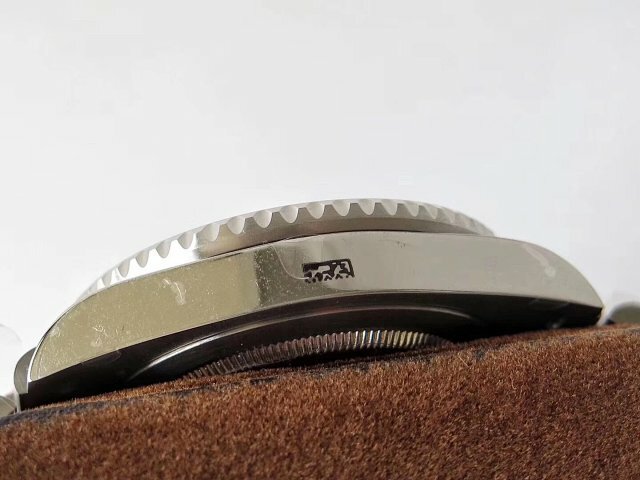 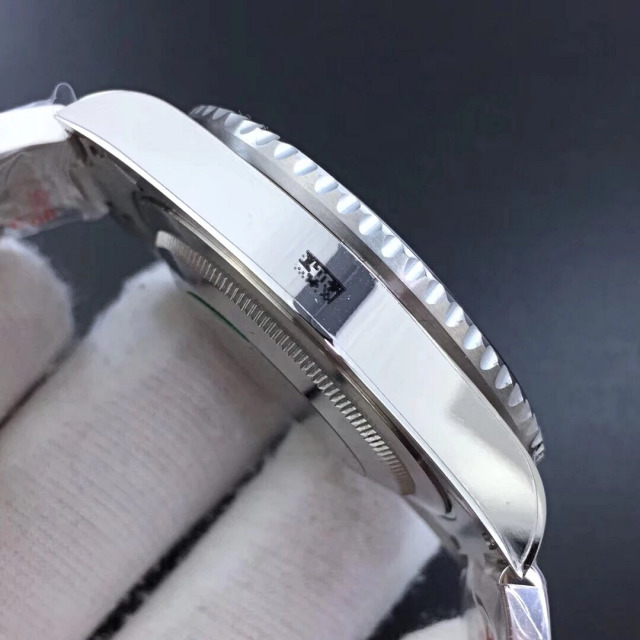 Angular Audemars Piguet case is well processed on this watch, the brushing texture on the bezel and case faces the same direction, case edge is polished to be smooth. 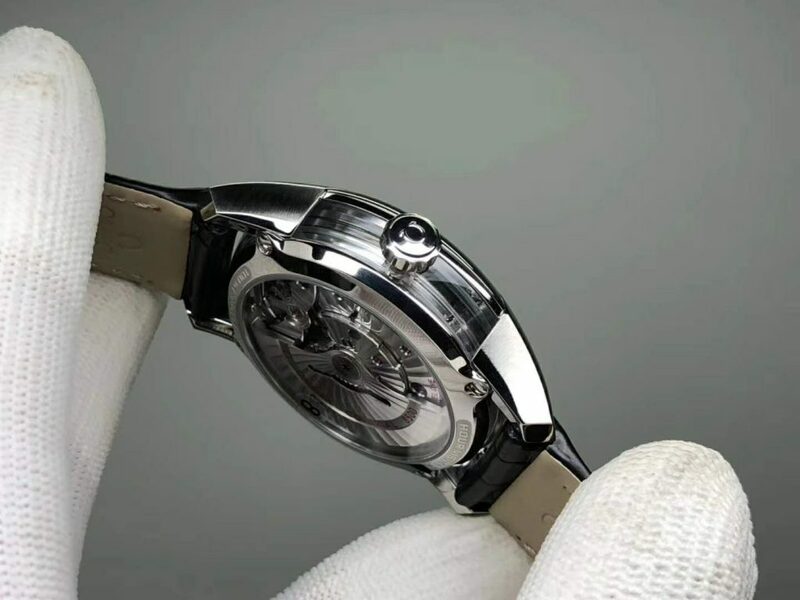 The high-level case finish not only brings you a good wearing comfort, but also refects the advanced watch-making technology of J12. 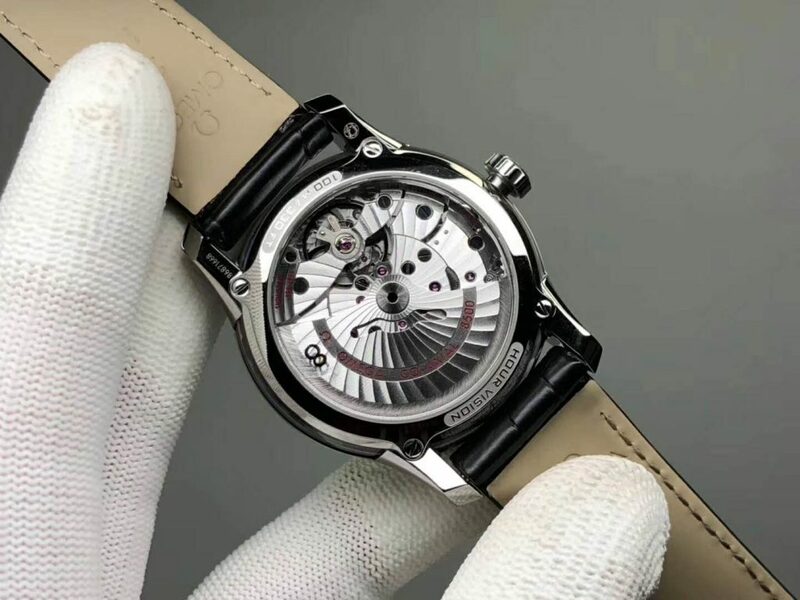 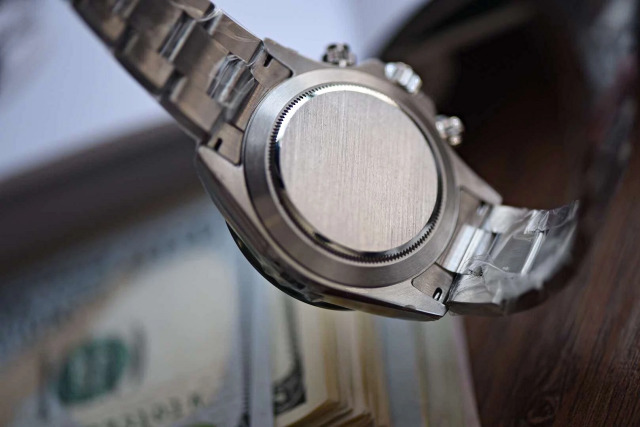 Yes, none of those replica watches in our market can have the same grade of case finish as J12 Audemars Piguet replicas, you can not deny this truth if you have a collection of replica watches from different manufacturers. 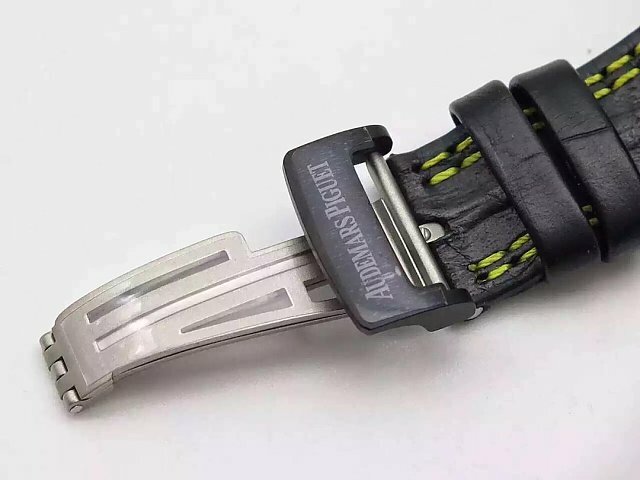 The bezel on this Audemars Piguet Combat replica is fully made of ceramic in green color, the updated brushed finish on this V2 edition gives you a very good visual enjoyment. 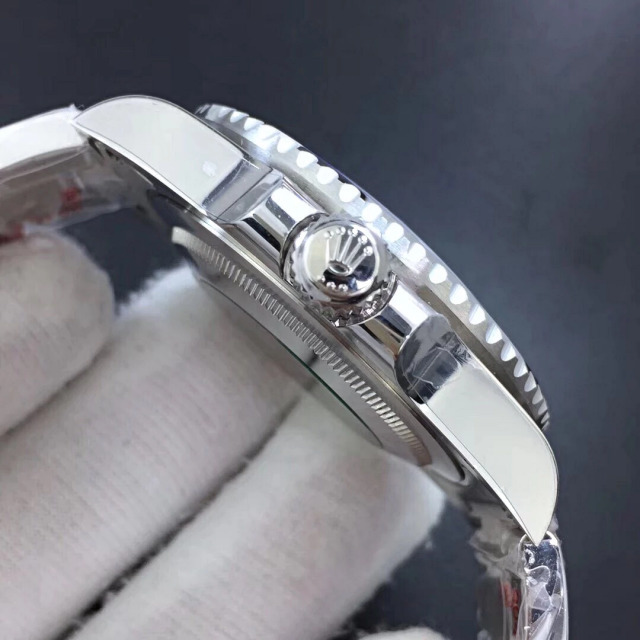 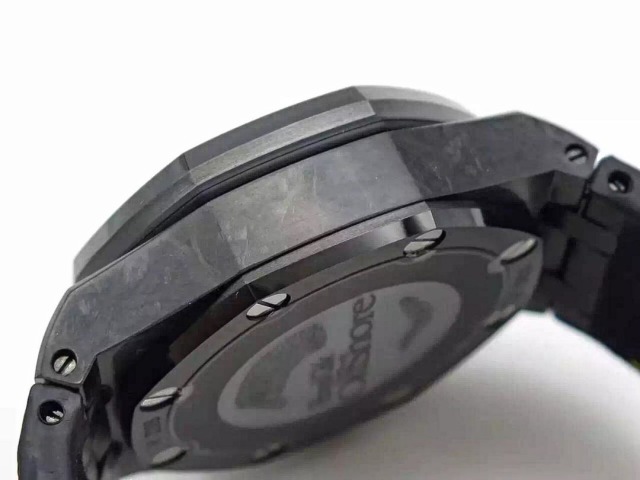 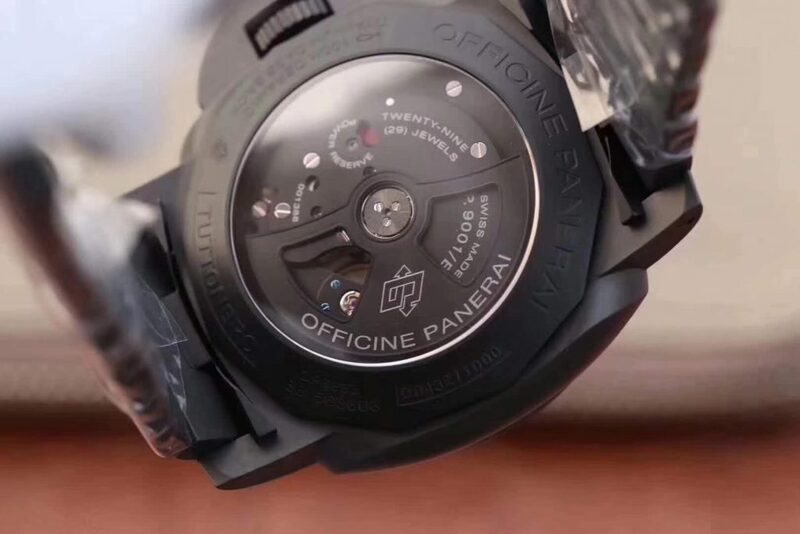 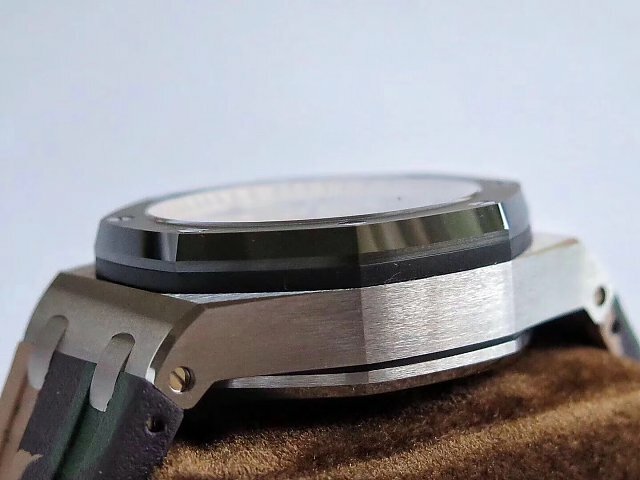 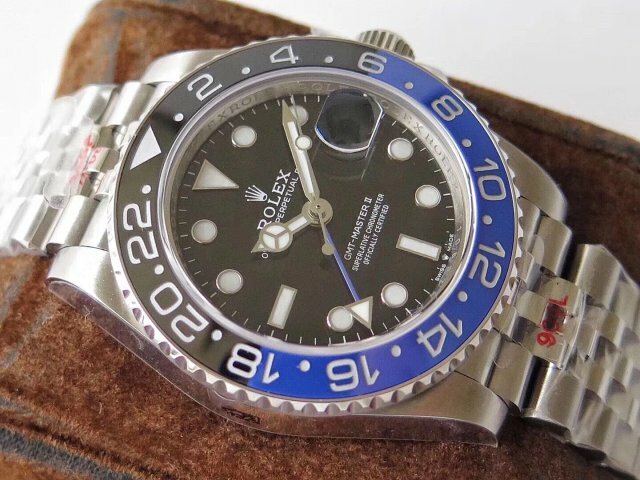 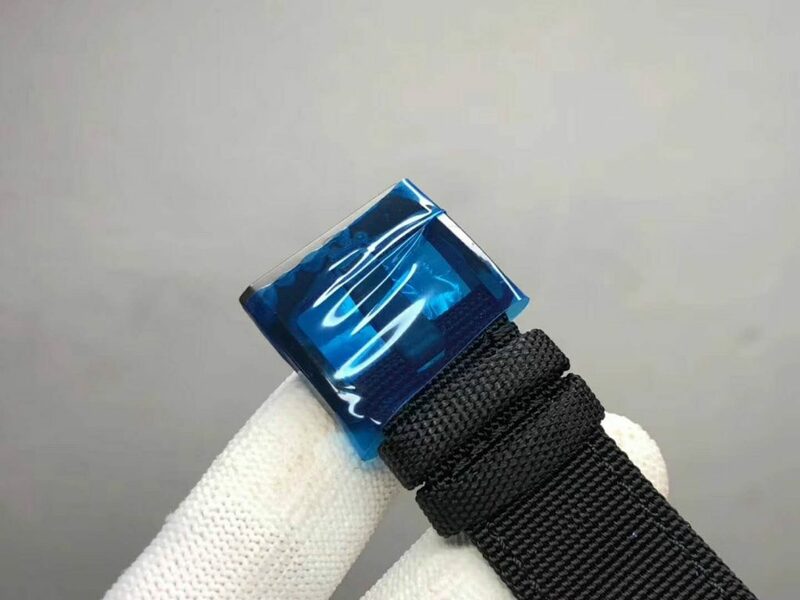 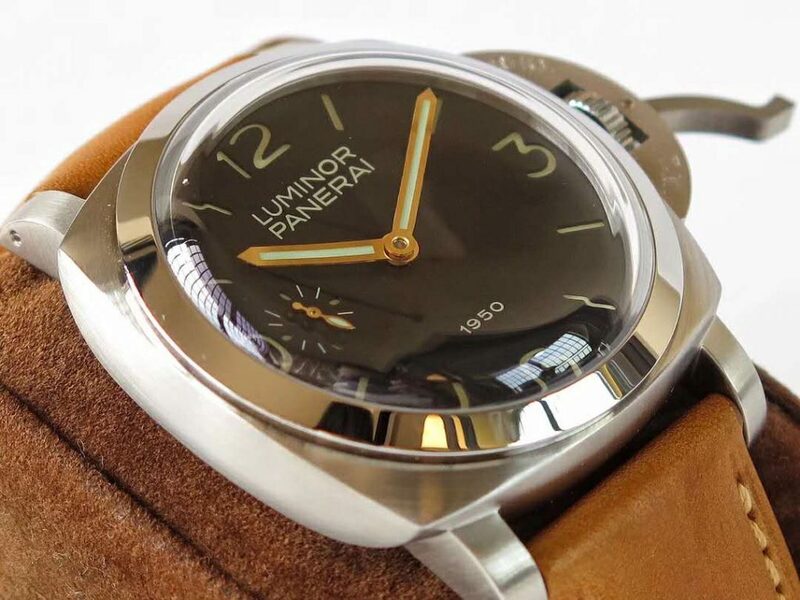 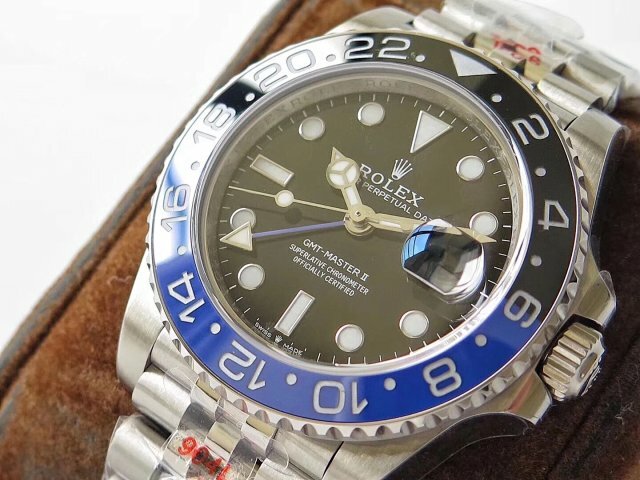 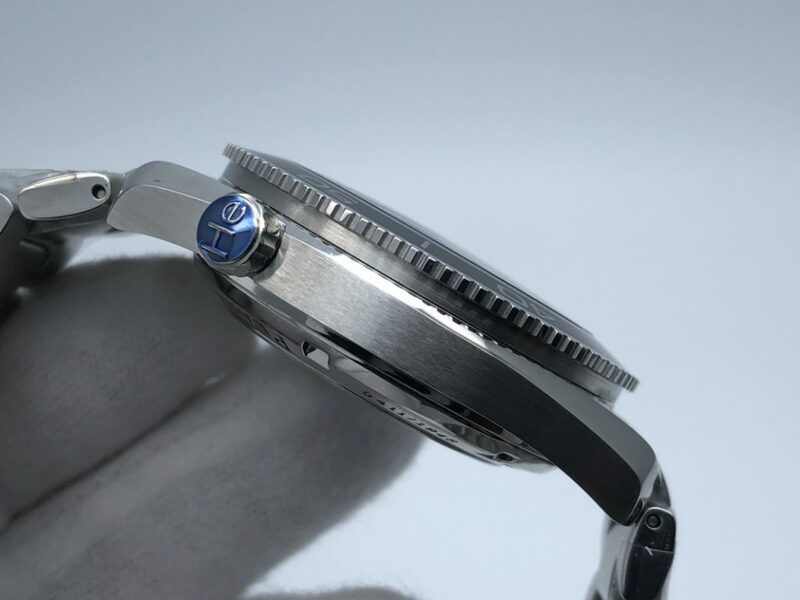 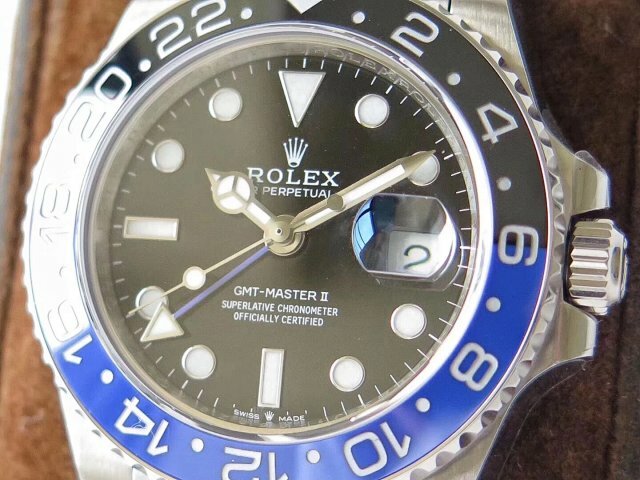 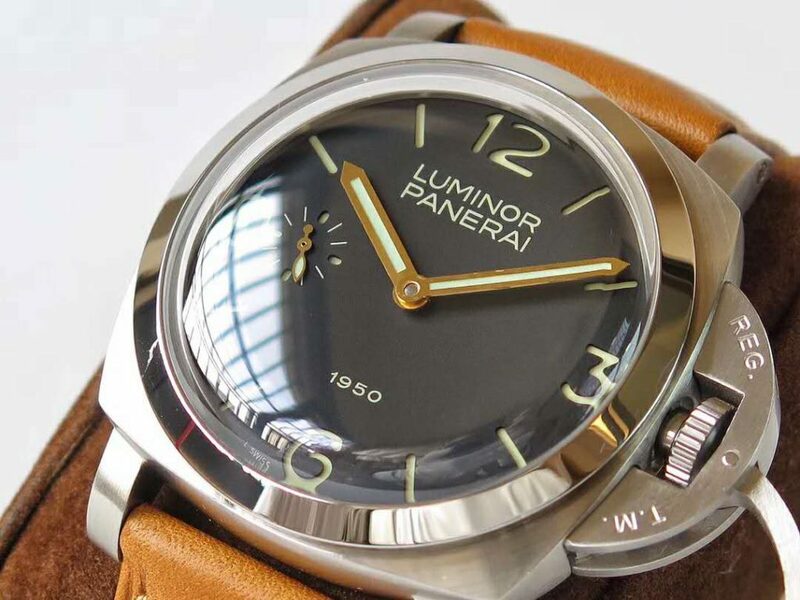 The bezel and case back are tightly fixed by eight screws through the middle case, on the center of the case back, it is see-through sapphire crystal. 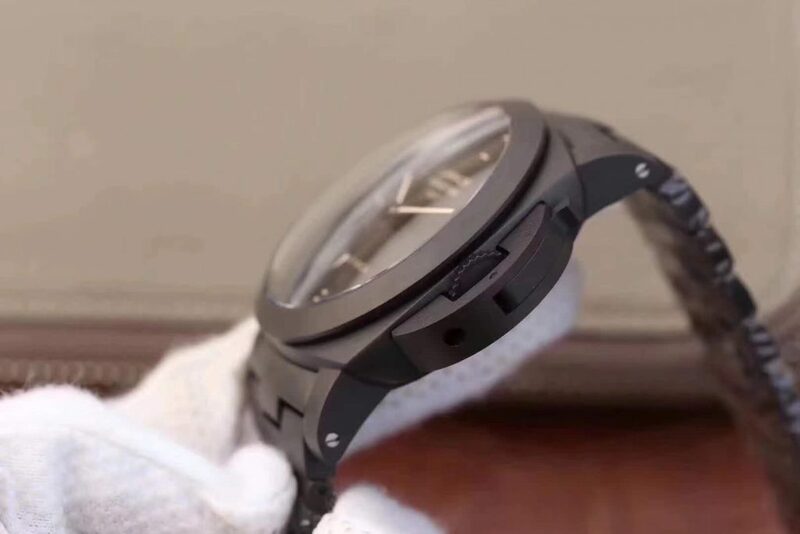 Overall, the case not only has a high grade finish, but also 1:1 replicated in structure. 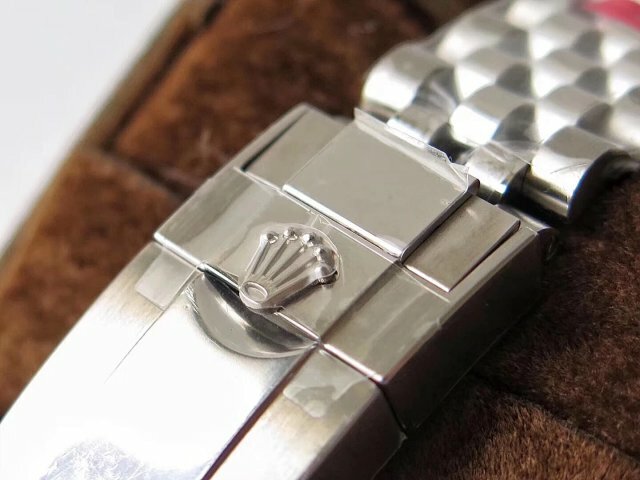 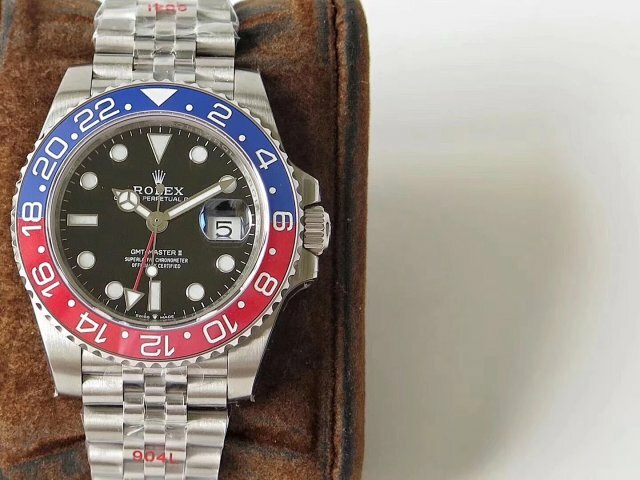 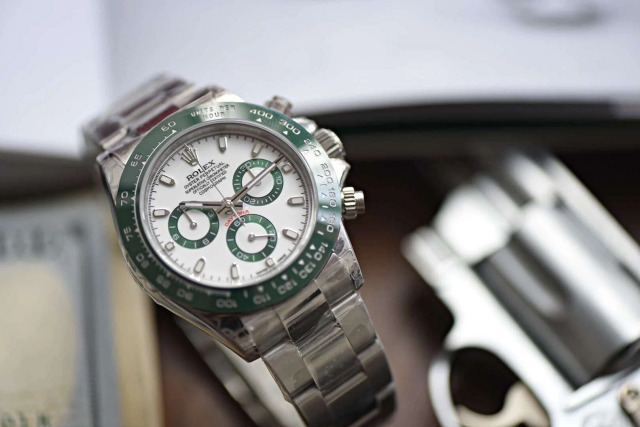 Each case part on the replica could be interchanged with genuine watch. 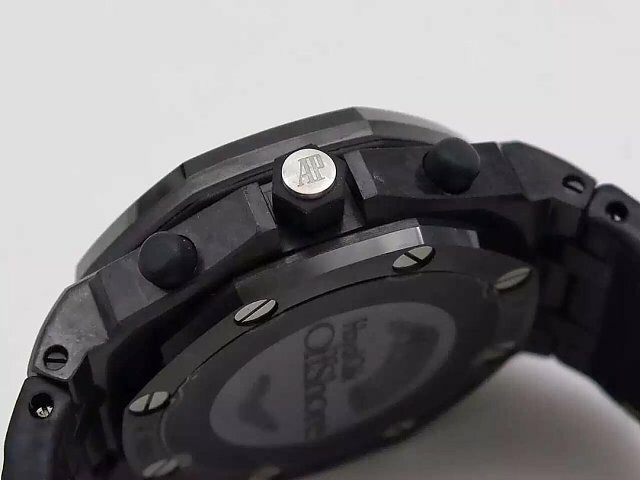 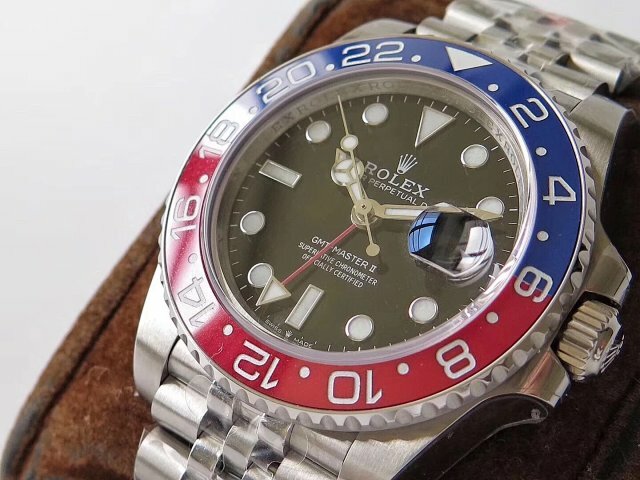 Checkered dial is in cream color, stick hour markers have silver edge and lume coating on the center, there are three subdials in black, the subdial at 12 o’clock is for small seconds display, it has a small silver hand. 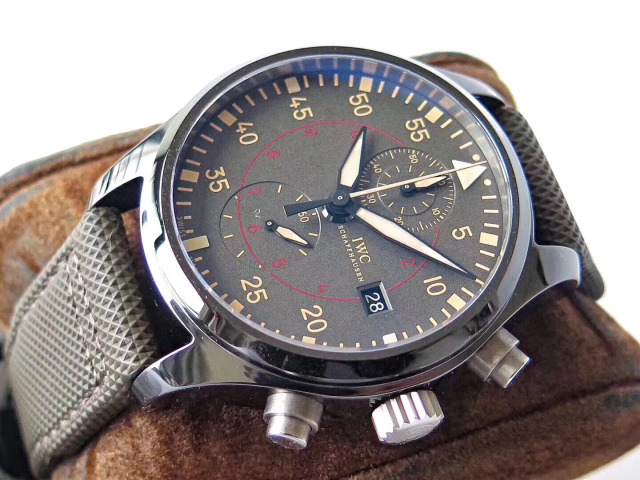 30-minute and 12-hour chronograph counter at 9 and 6 o’clock have a small hand in brown color. 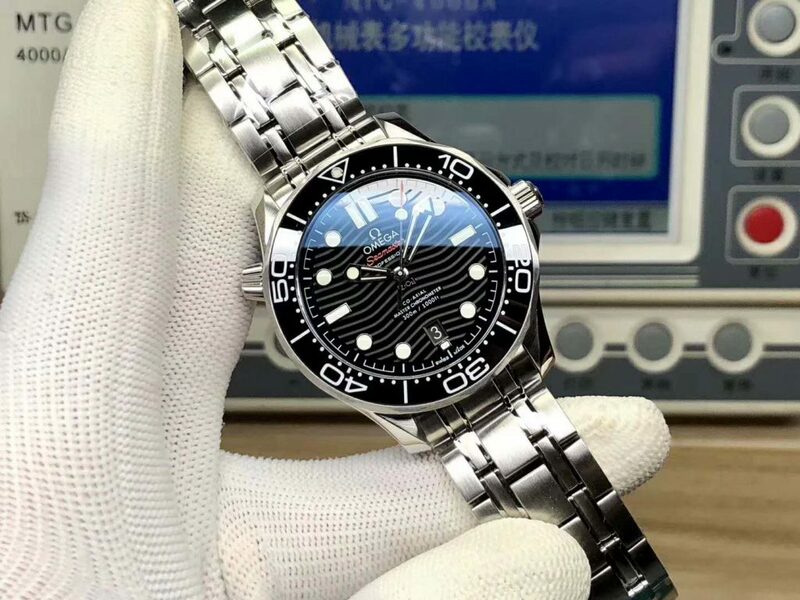 All subdials have white markers. 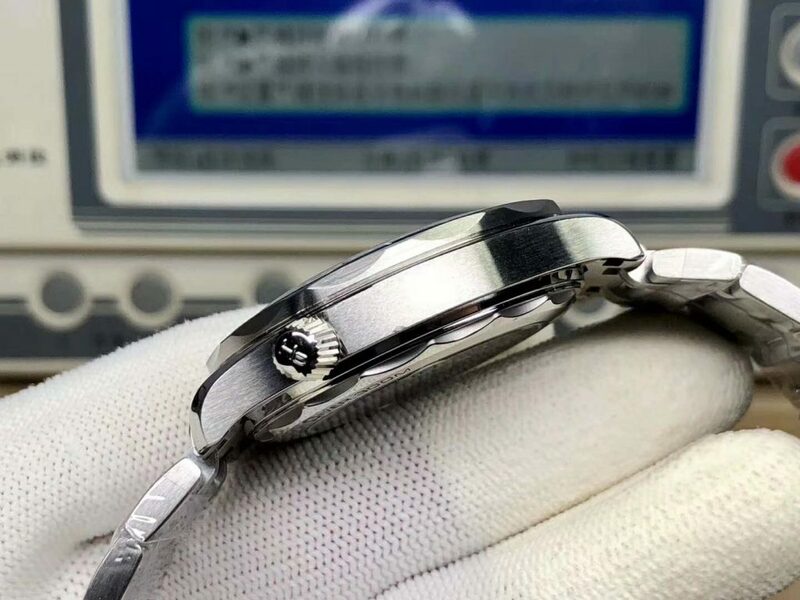 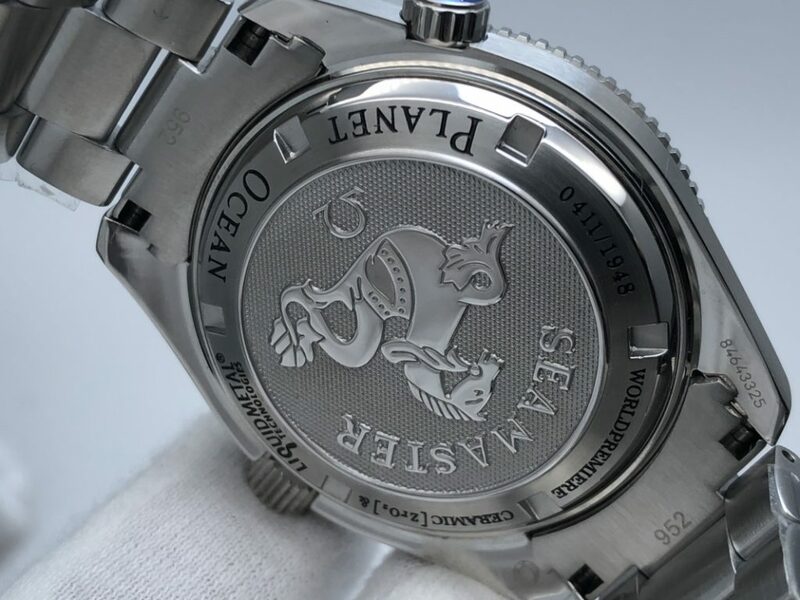 On the left side of the date window at 3 o’clock, there is an “AP” logo in silver color and black “AUDEMARS PIGUET” below. 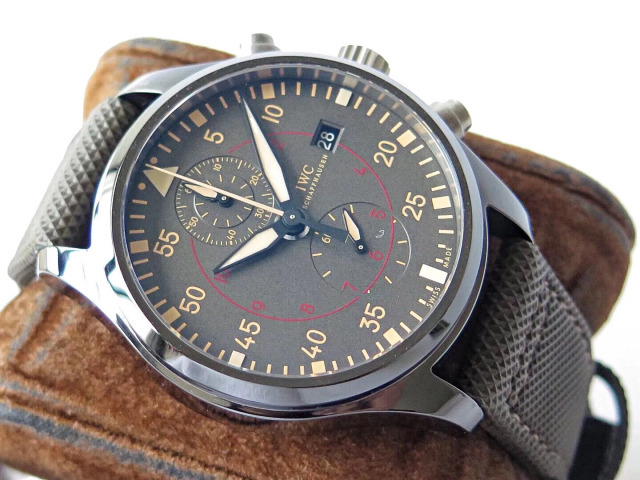 The central second chronograph hand also has a brown tip. 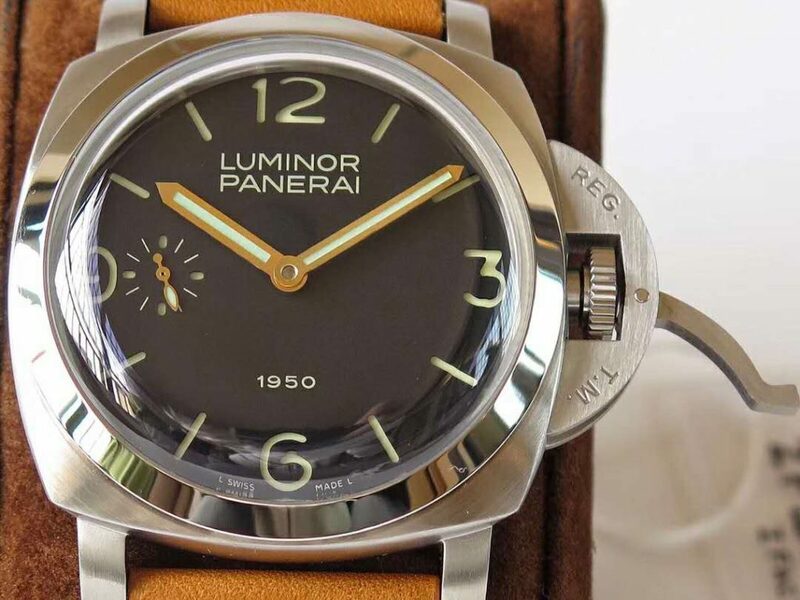 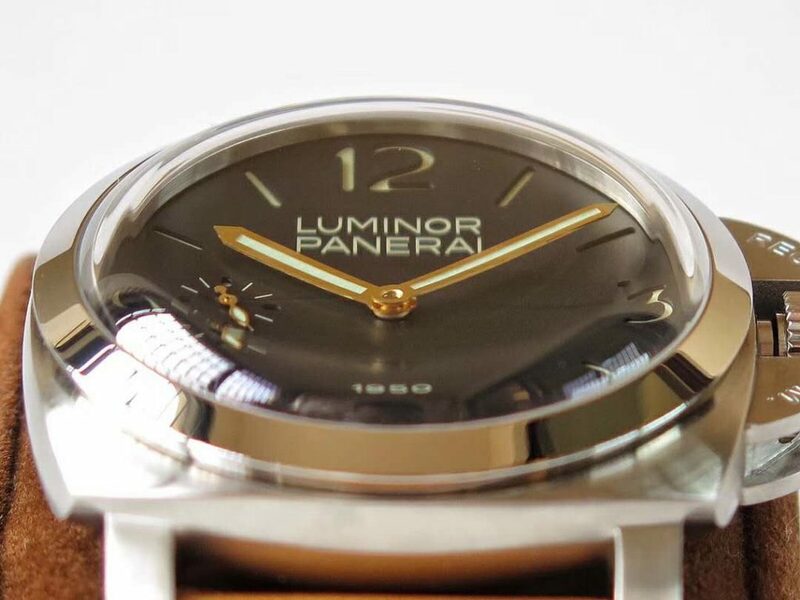 The lume coating on hour markers, hour and minute hands will emit a strong green light in the dark. 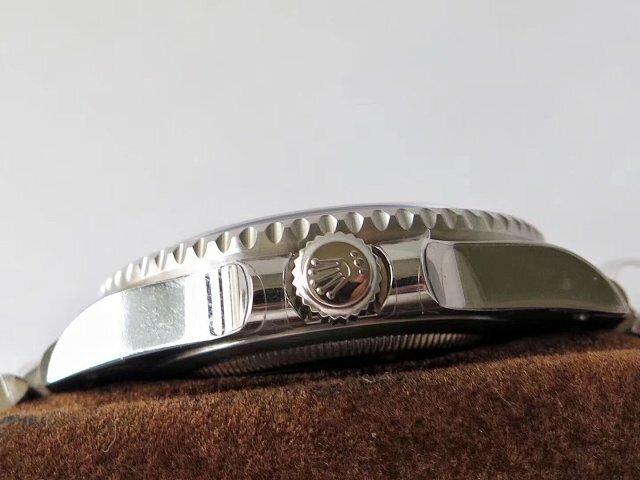 Round date window set at 3 o’clock has white date font in black background, it is clearly readable for the wearer. 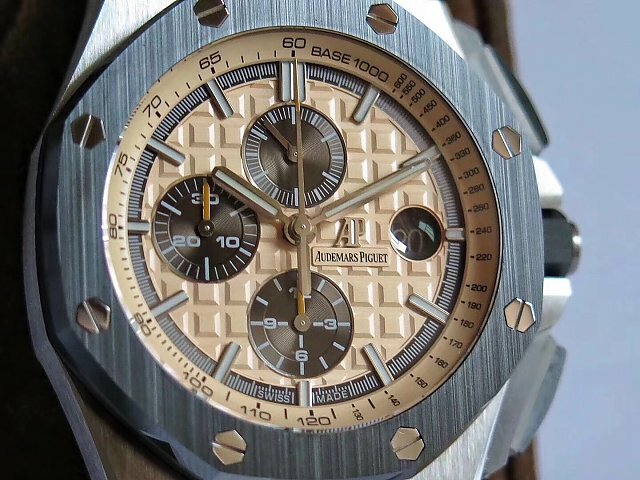 In a word, the dial of this replica Audemars Piguet not only has a high imitation level, but also has three subdials that work the same as genuine. 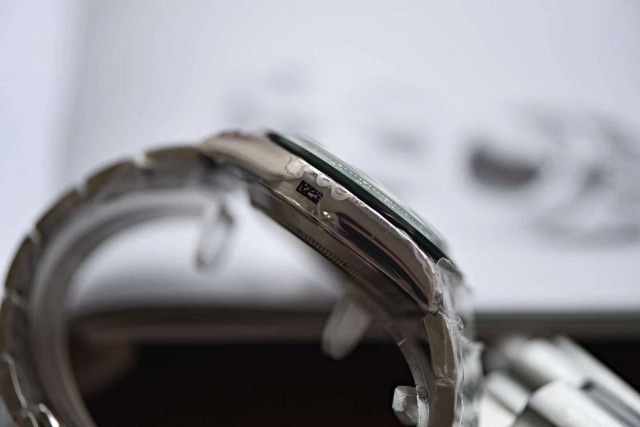 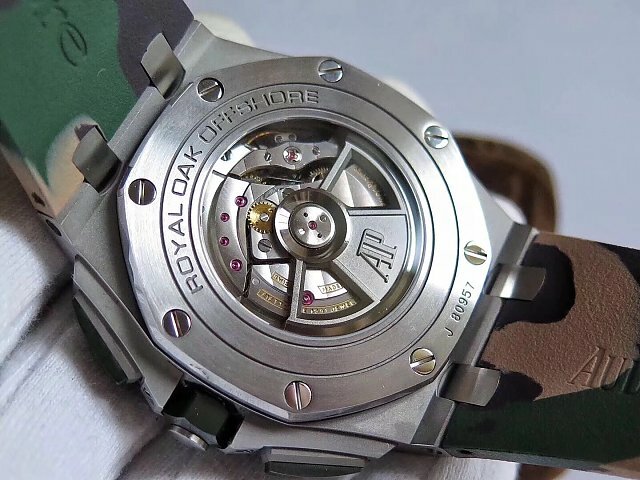 The watch has one pair of Camouflage green rubber straps. 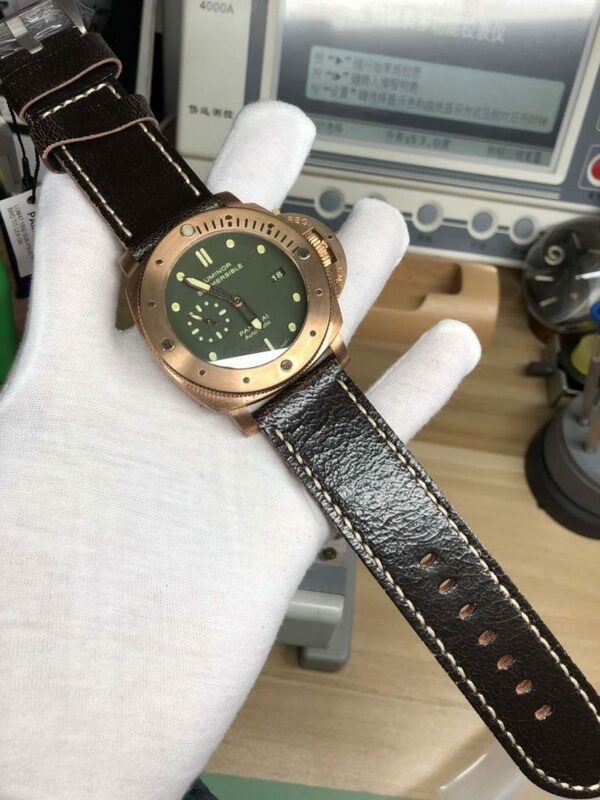 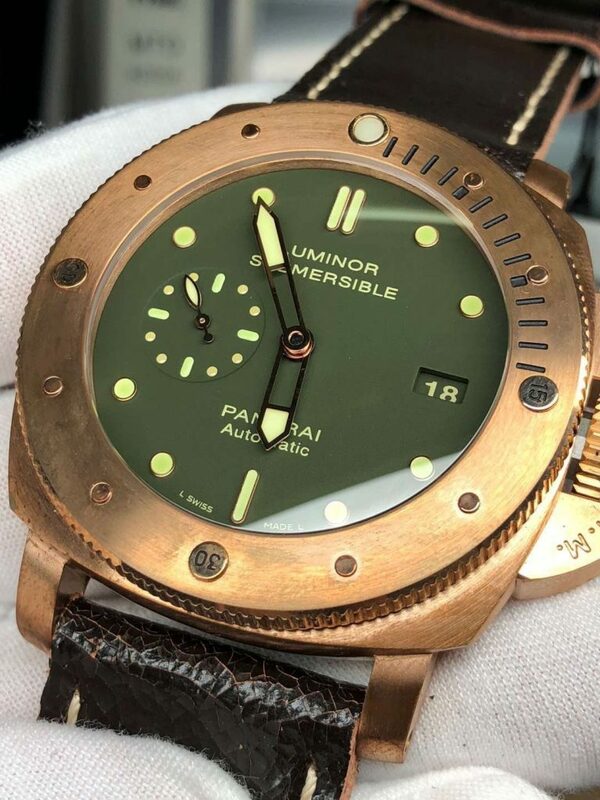 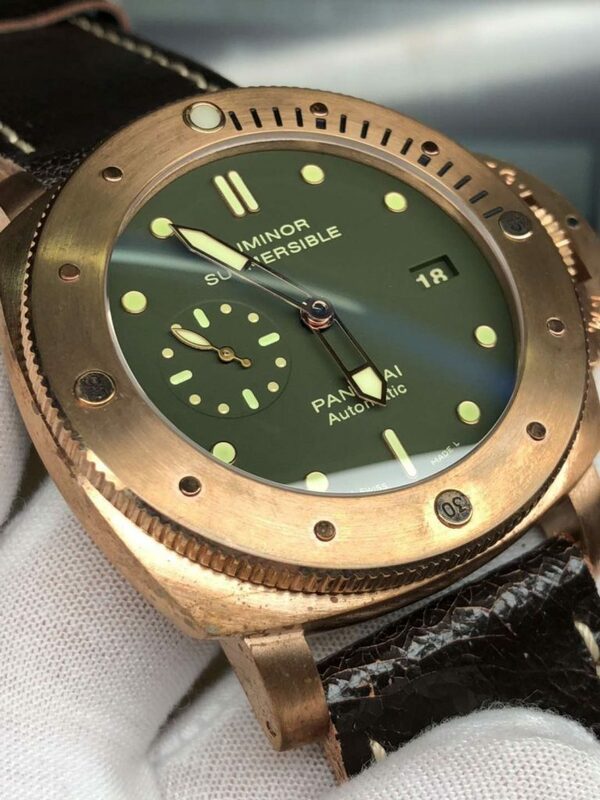 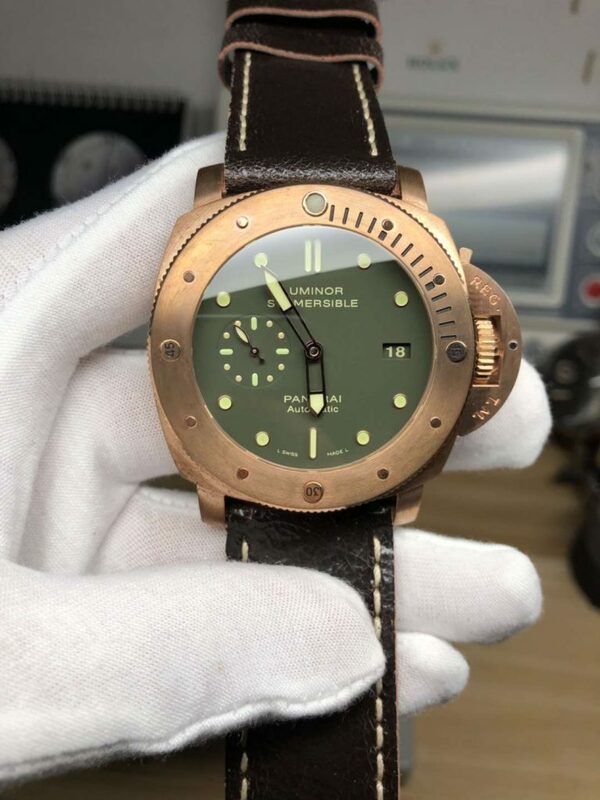 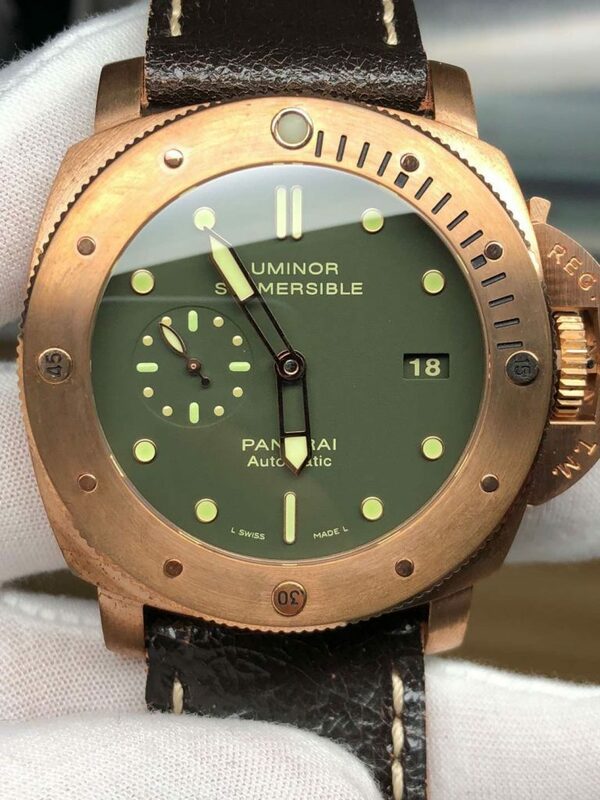 Both green ceramic bezel and Camouflage green band add military element to this watch, they attract a lot of military watch fans for this watch. 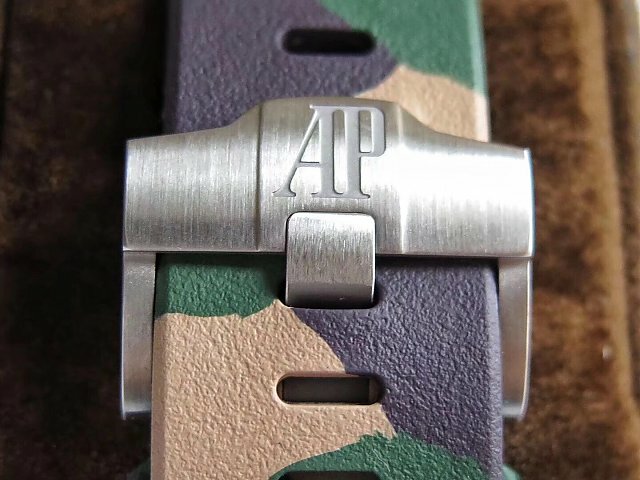 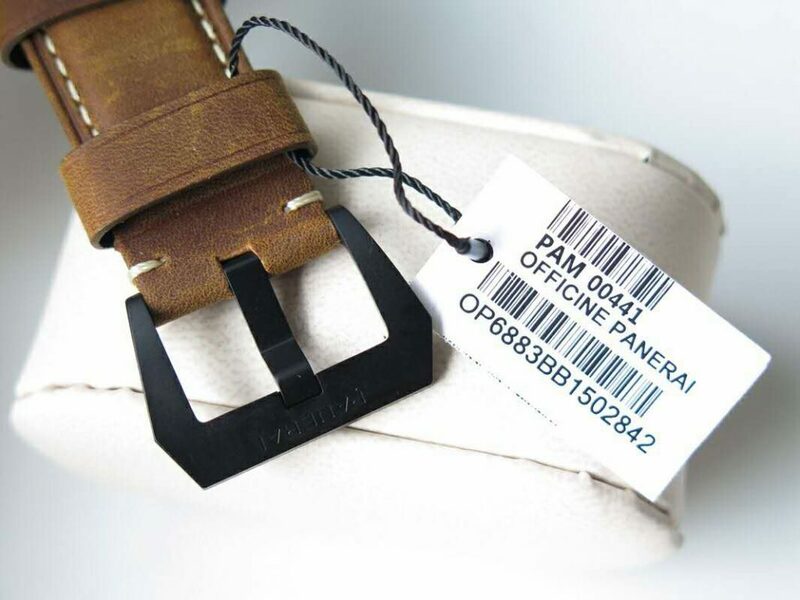 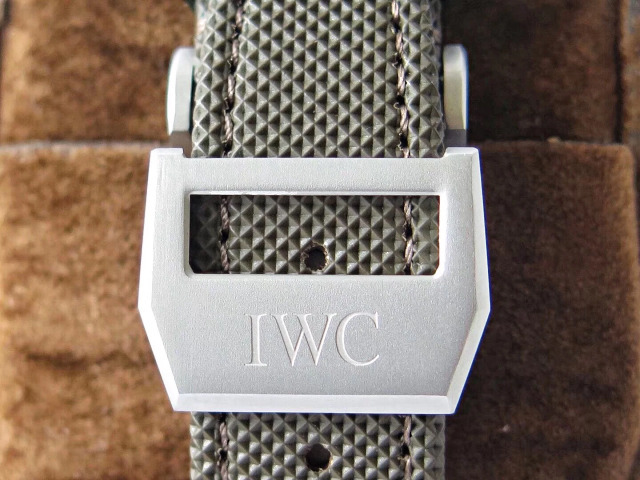 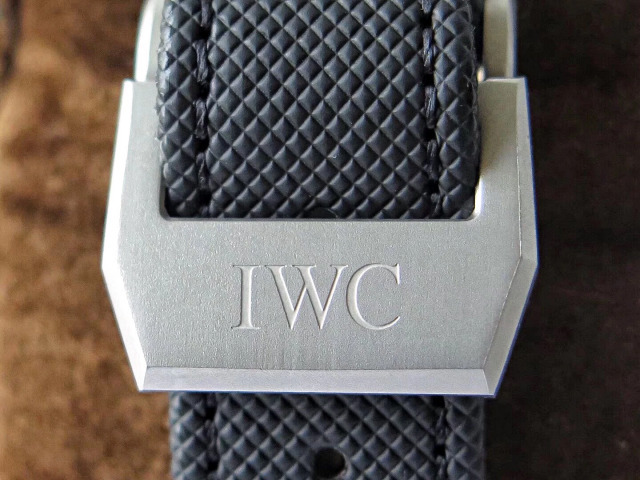 The buckle on the strap is brushed and has a “AP” engraving in satin-finished. 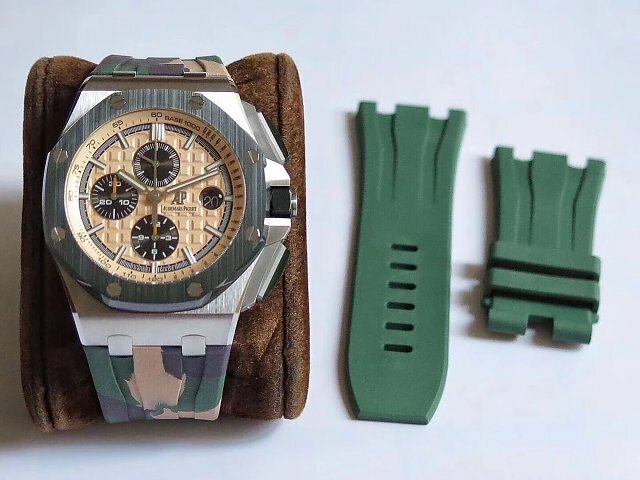 Among so many Audemars Piguet replica watches with ordinary looks that you have been tired of, this Audemars Piguet Combat replica in camouflage green will definitely turns you on.